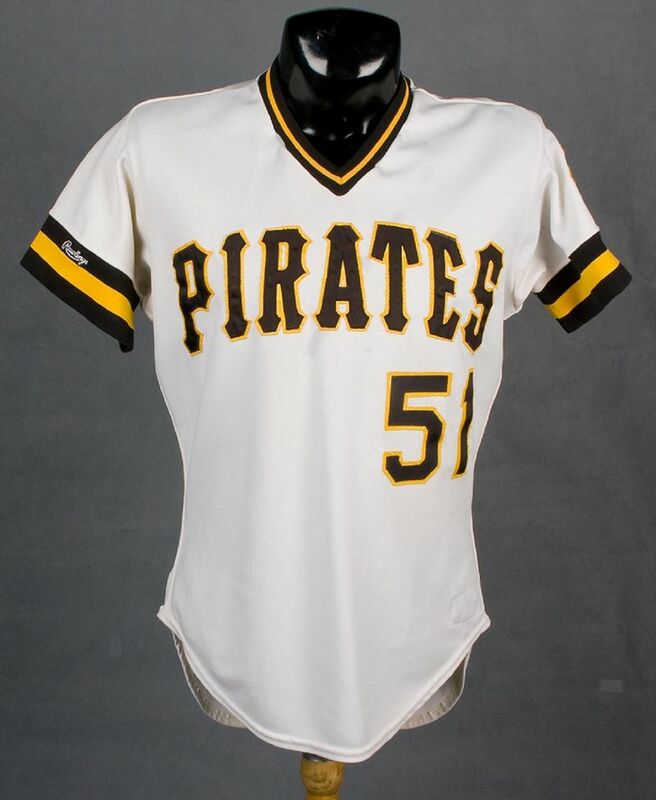 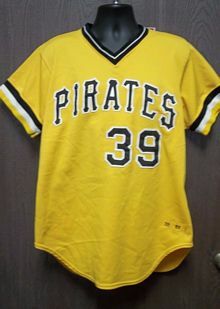 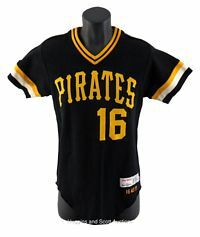 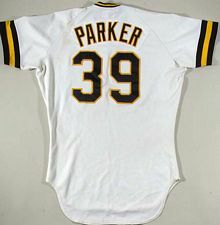 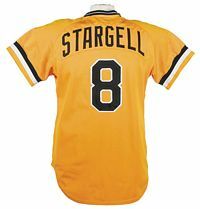 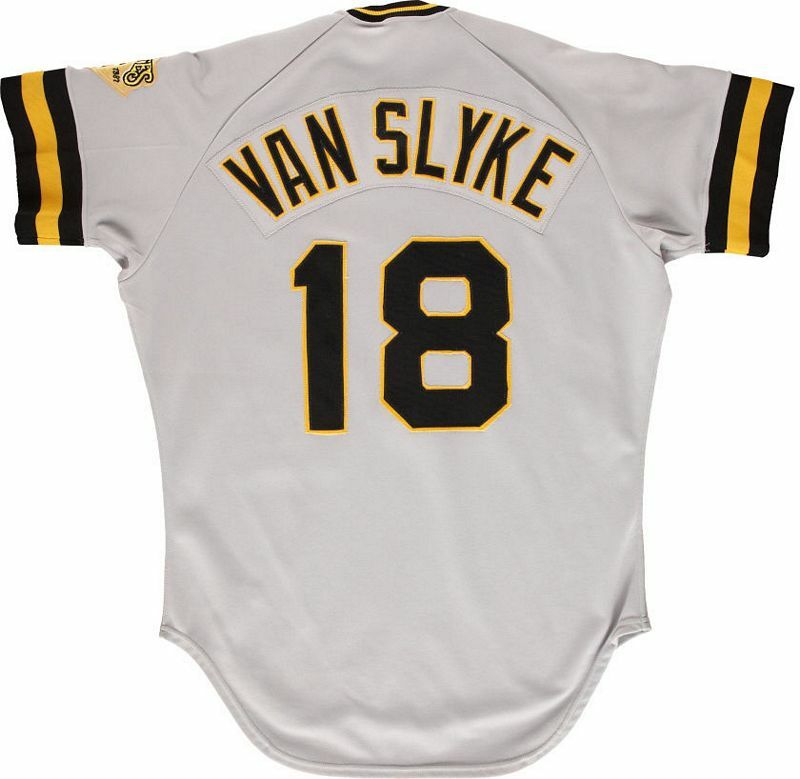 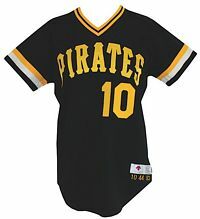 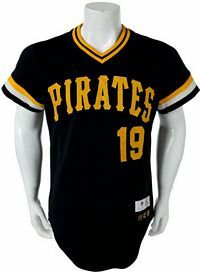 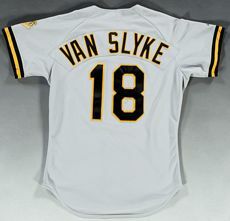 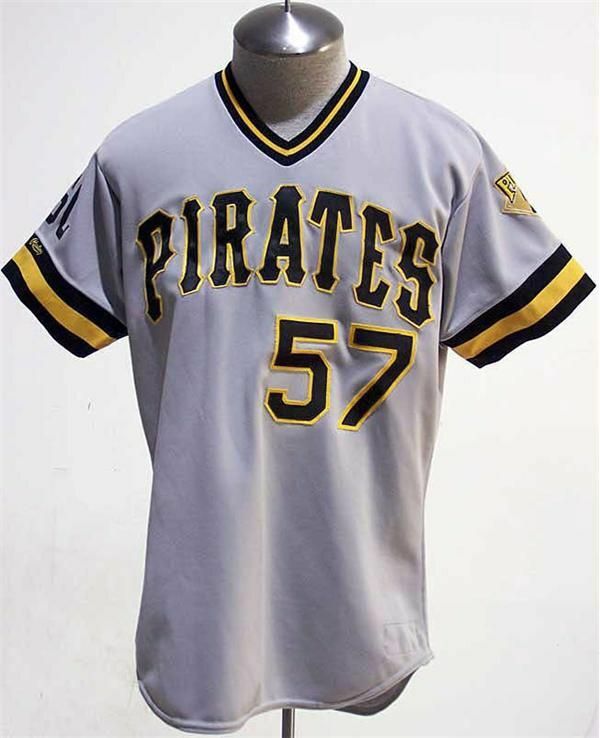 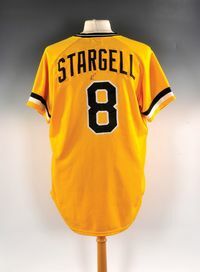 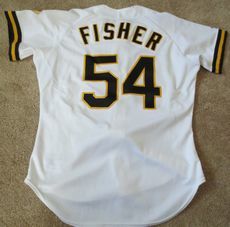 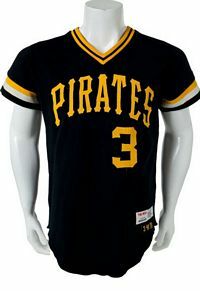 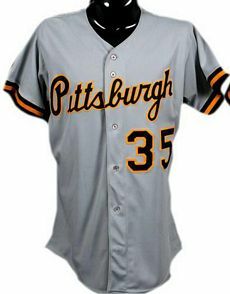 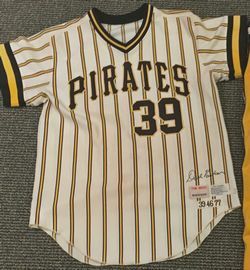 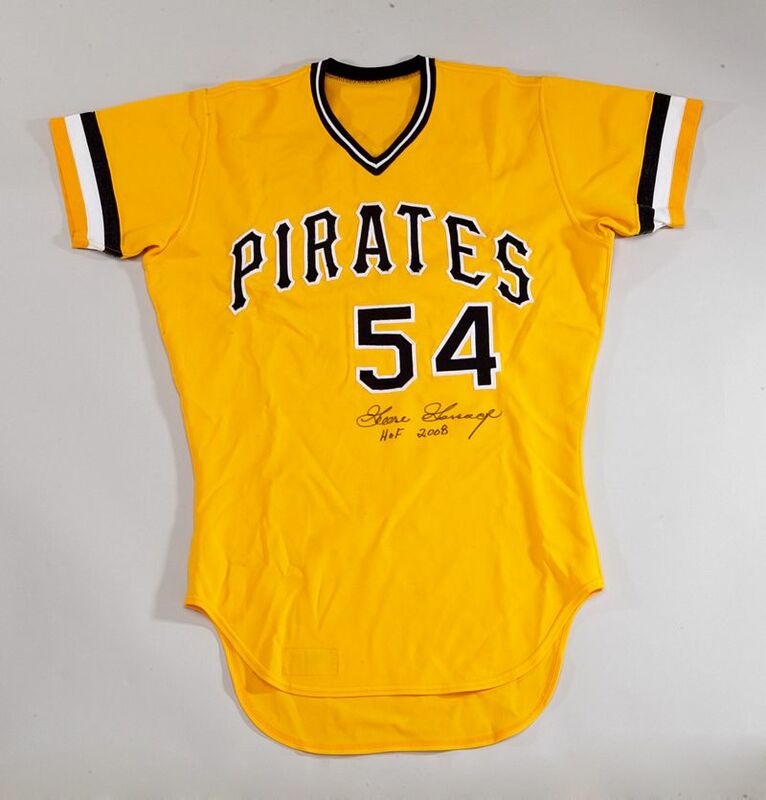 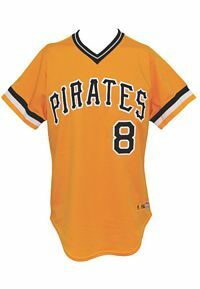 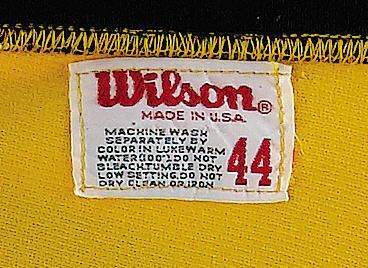 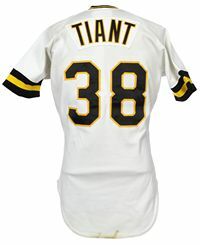 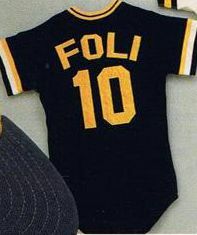 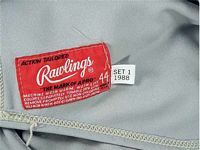 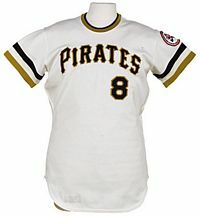 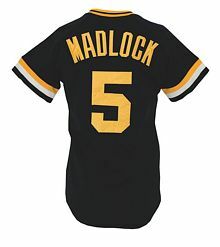 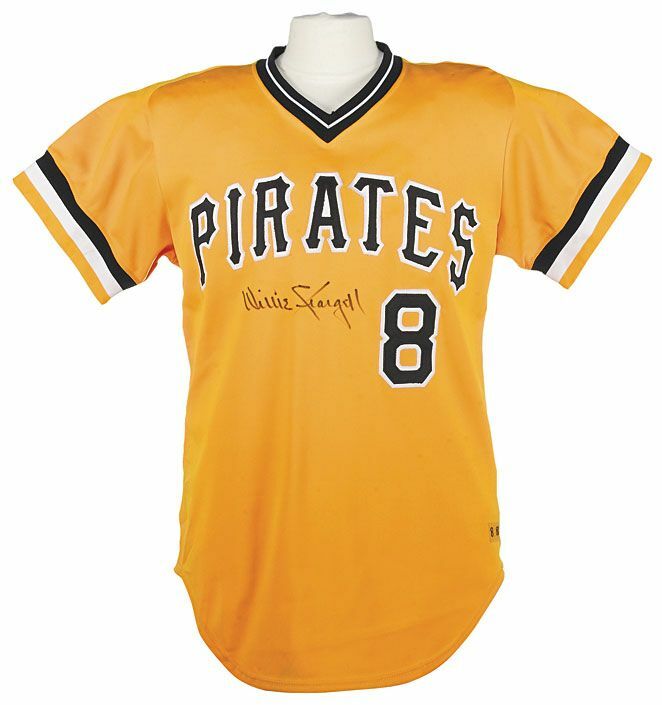 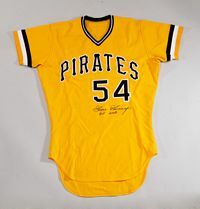 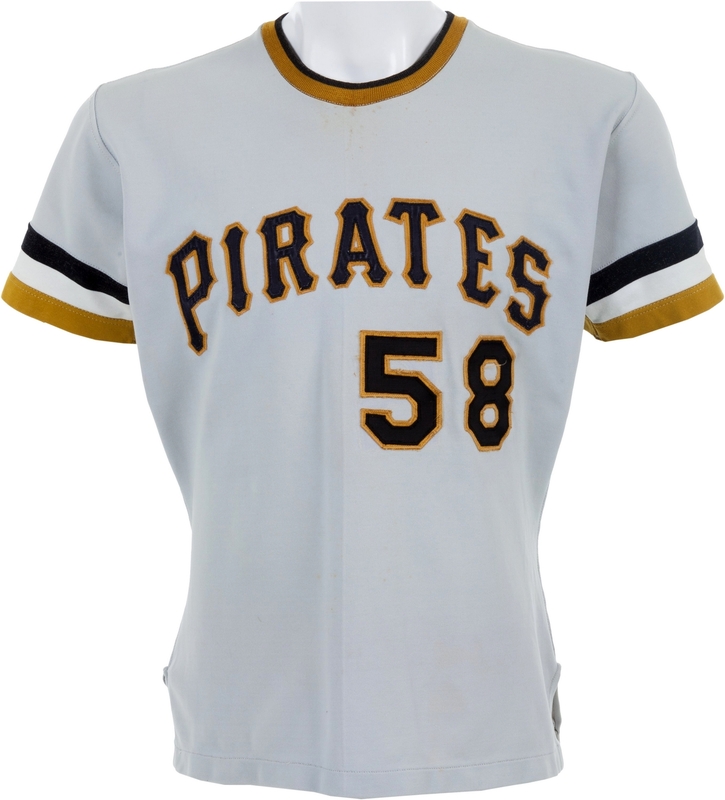 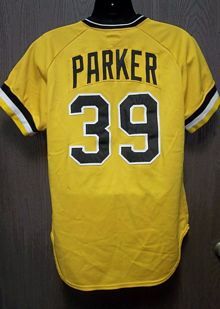 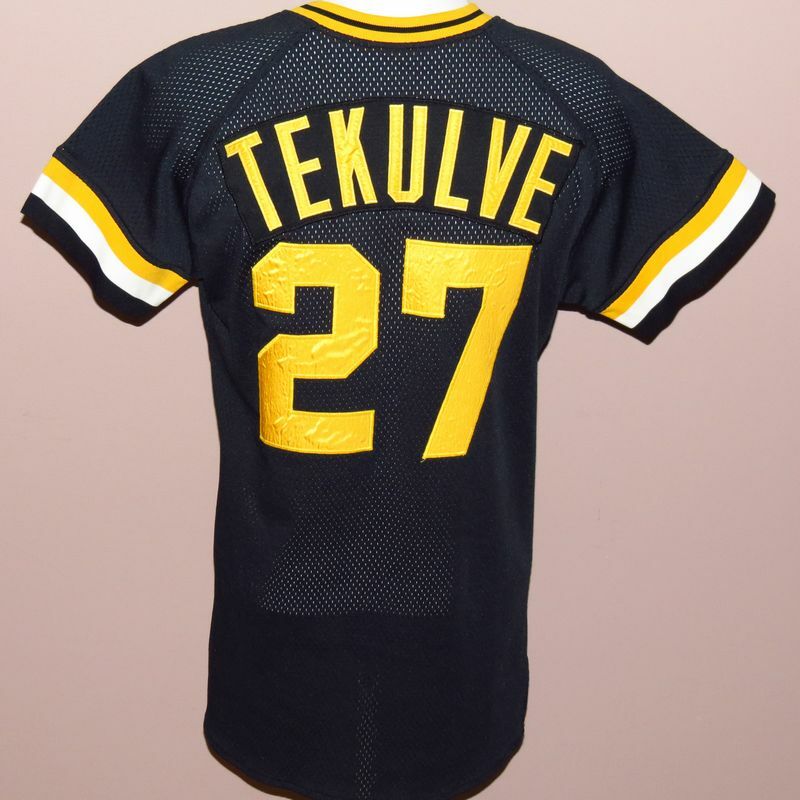 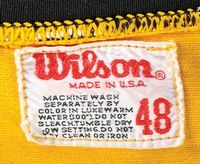 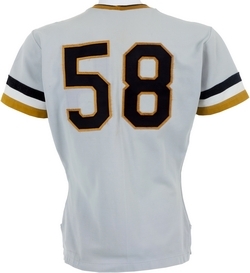 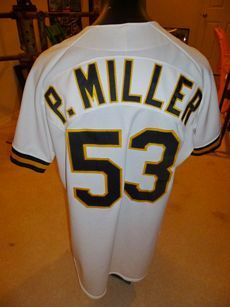 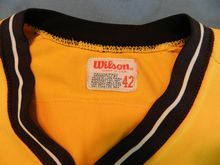 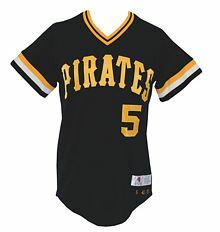 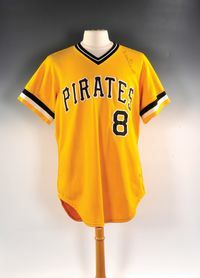 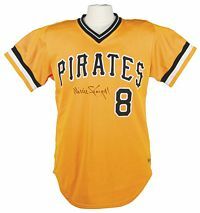 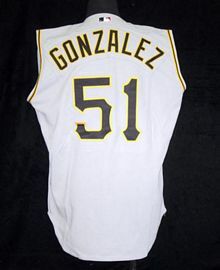 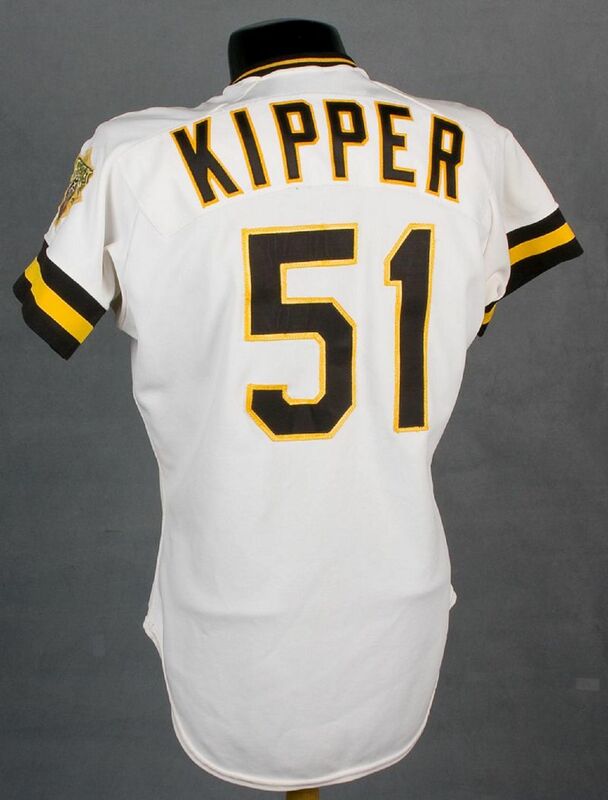 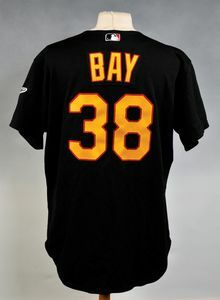 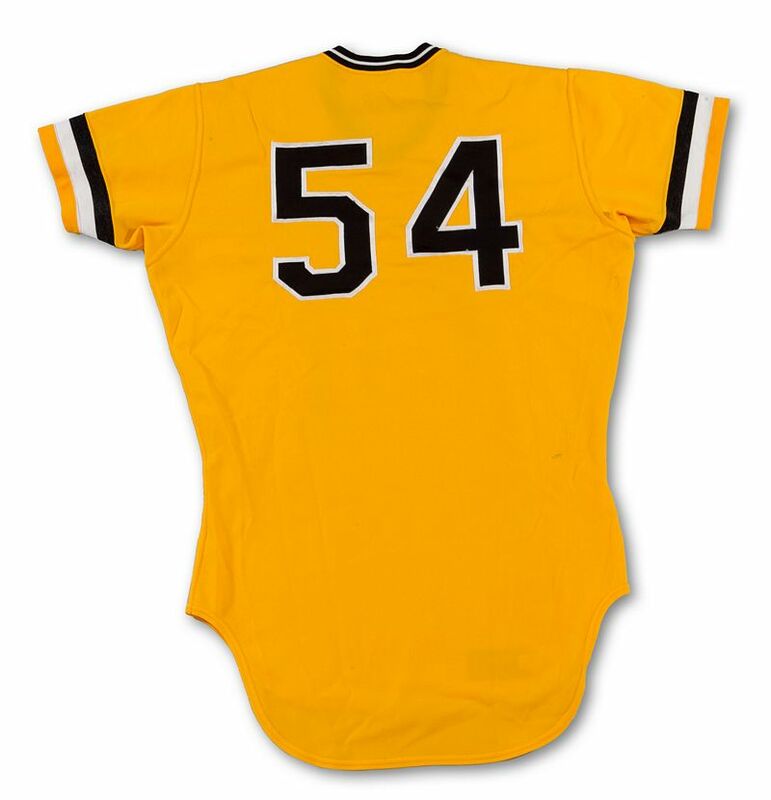 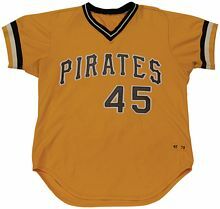 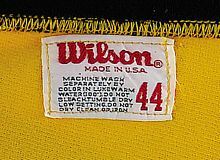 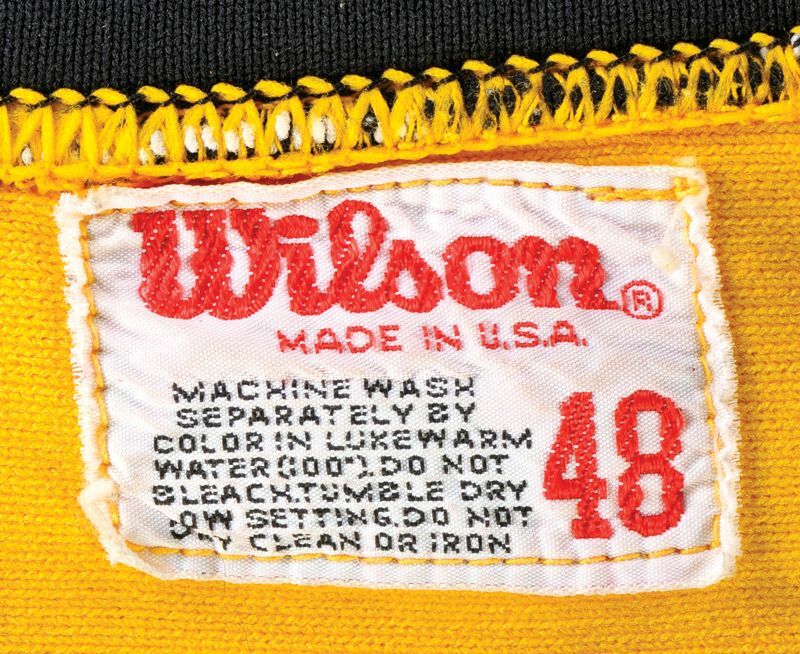 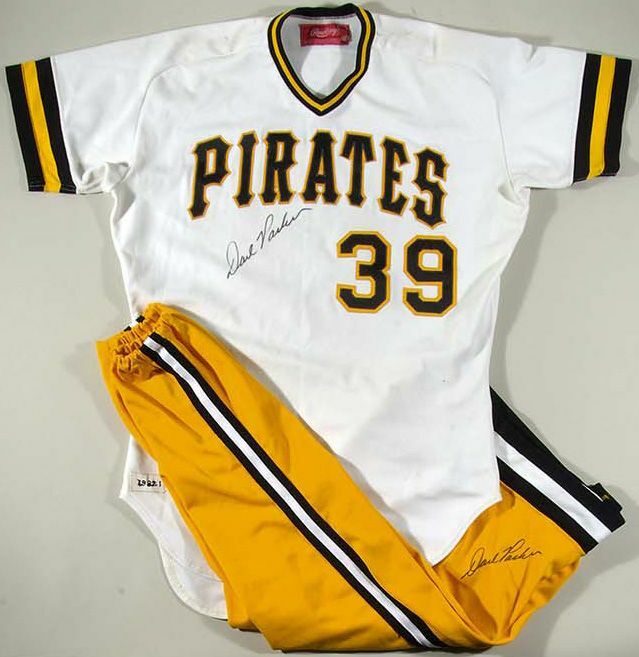 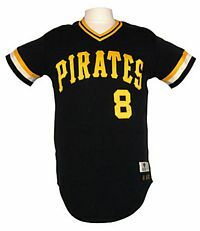 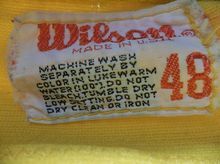 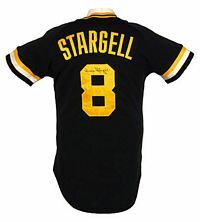 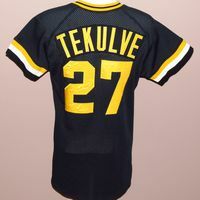 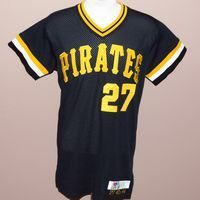 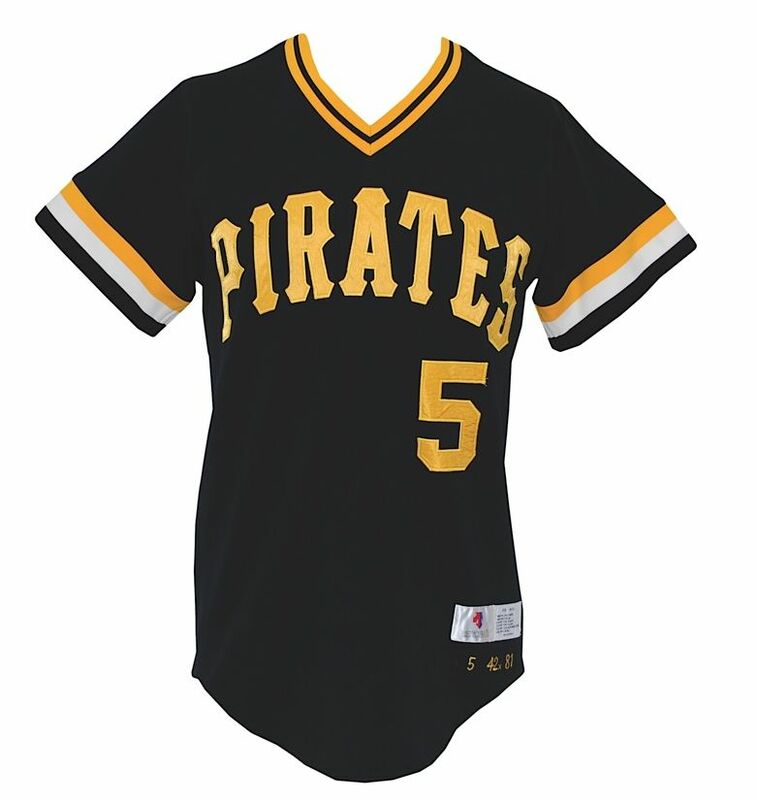 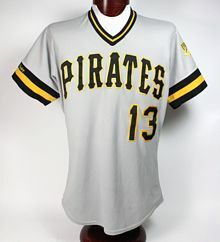 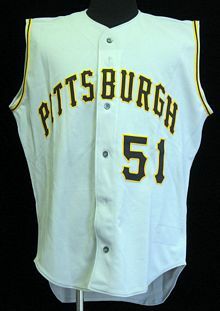 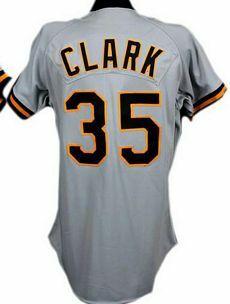 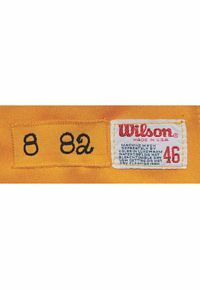 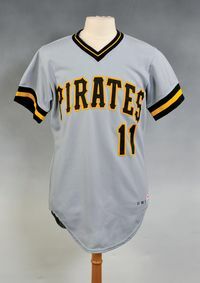 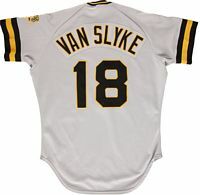 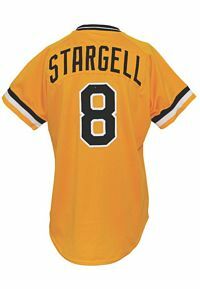 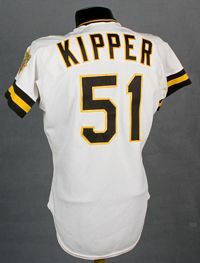 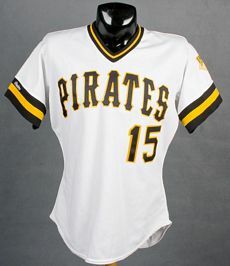 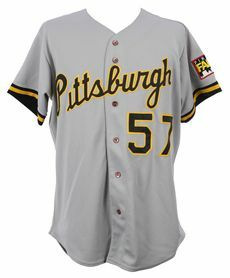 Coinciding with the move to Three Rivers Stadium in July 1970, the Pirates become the first MLB team to introduce a cotton-nylon pullover jersey with an elasticized waist. 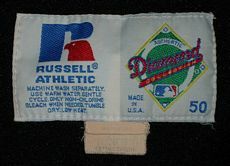 It started what became the double-knit revolution (with polyester taking over) which was cooler, lighter and with more stretch than woven flannel. 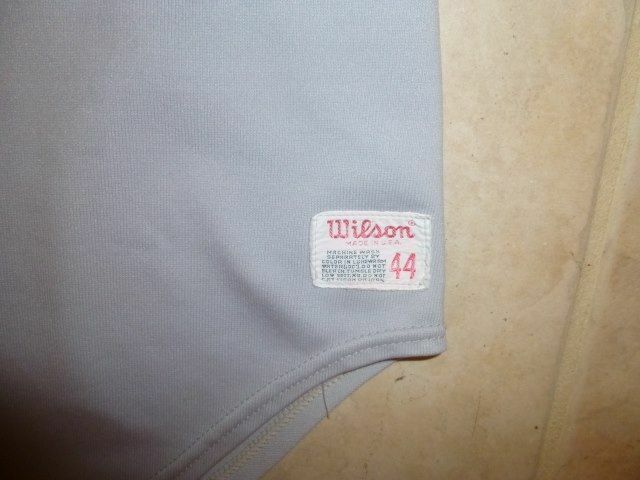 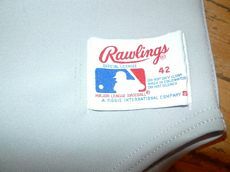 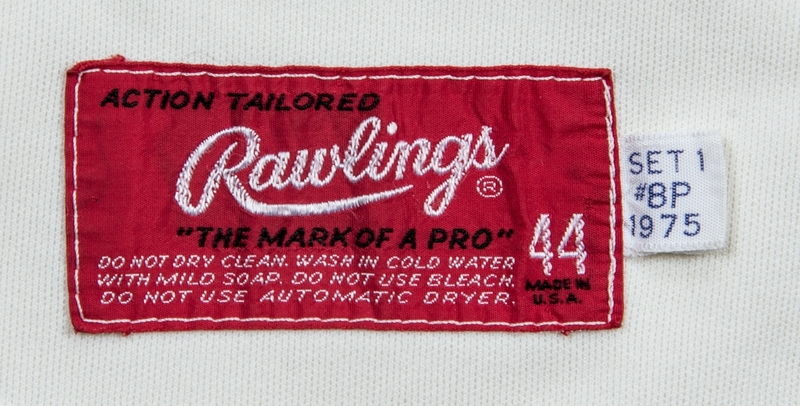 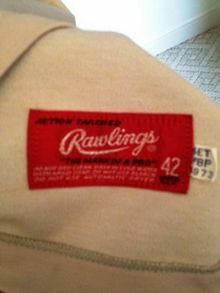 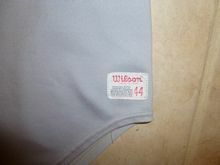 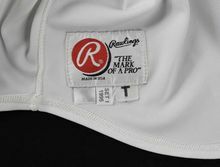 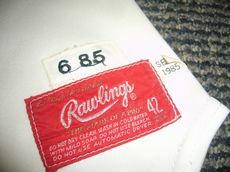 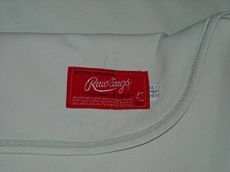 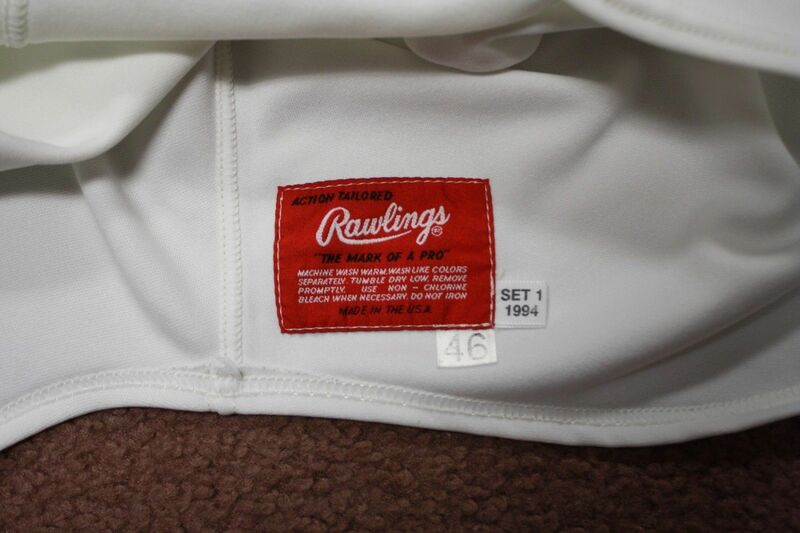 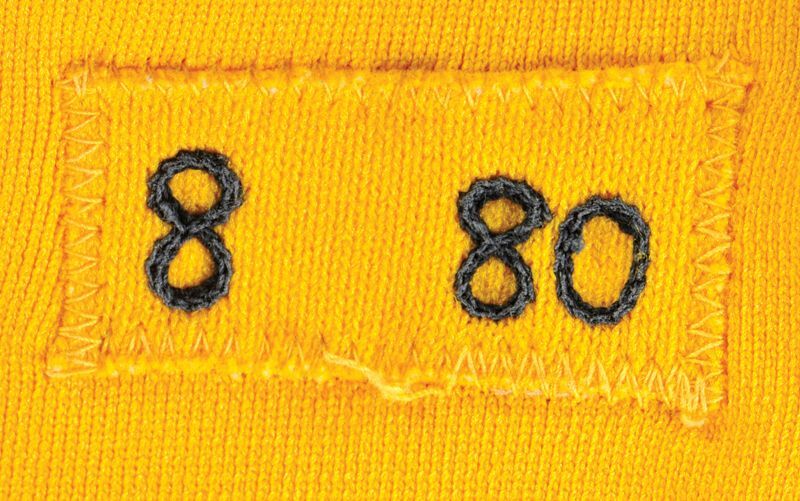 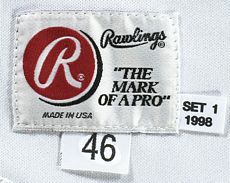 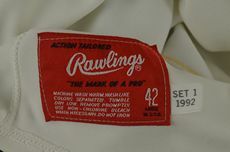 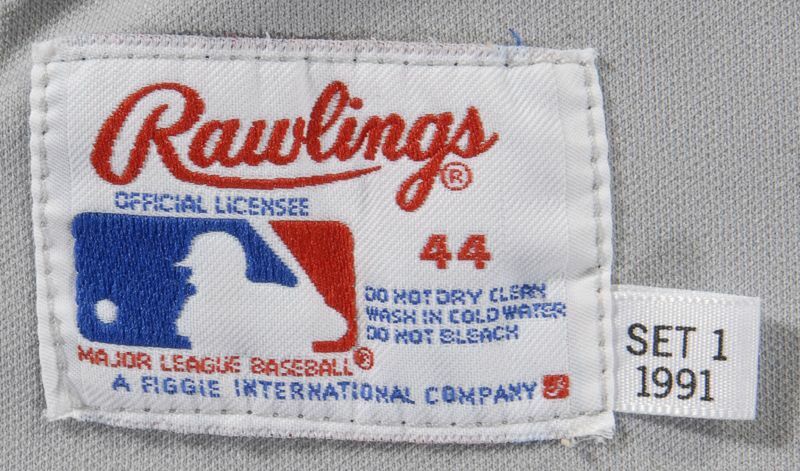 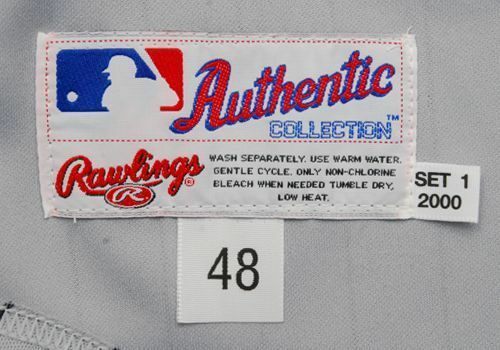 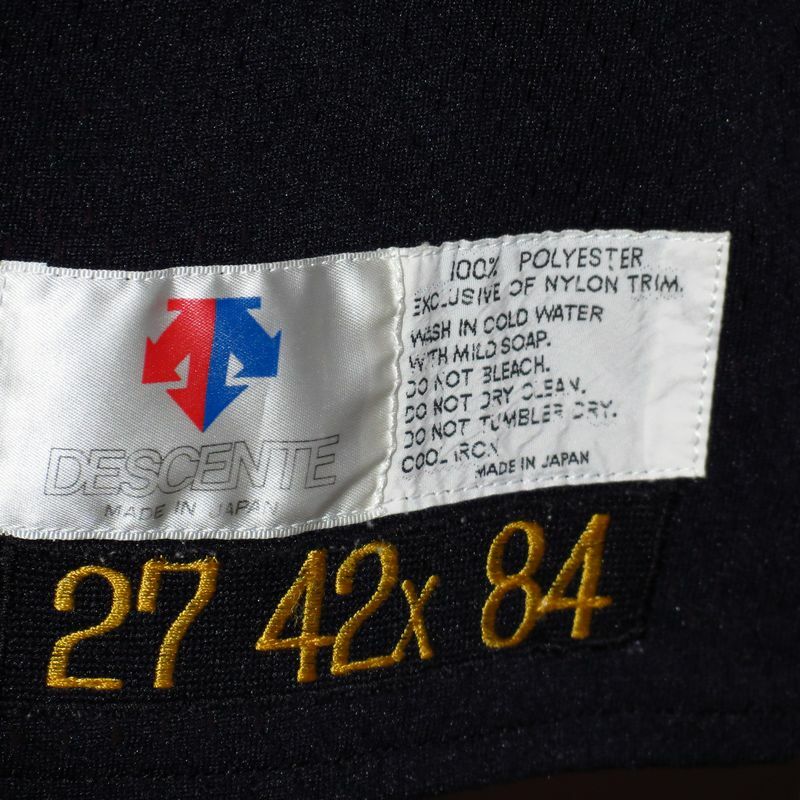 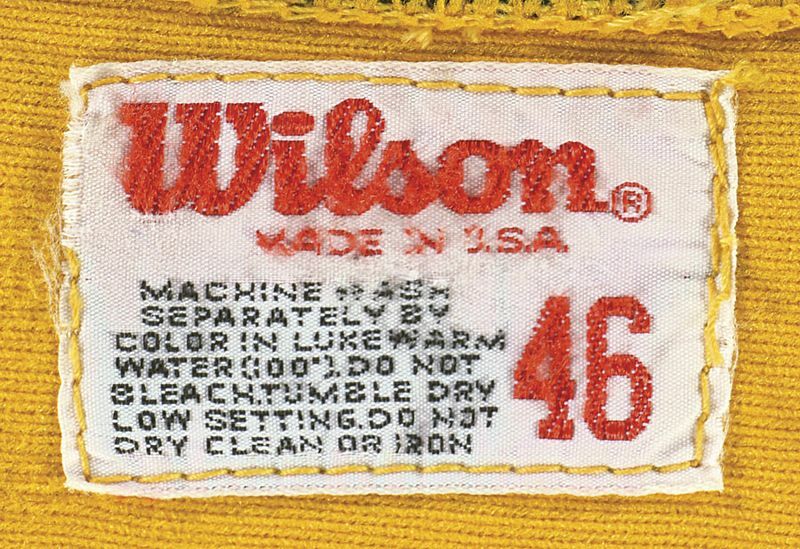 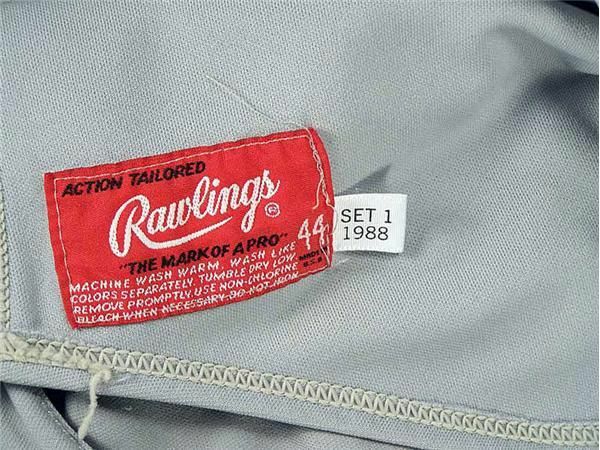 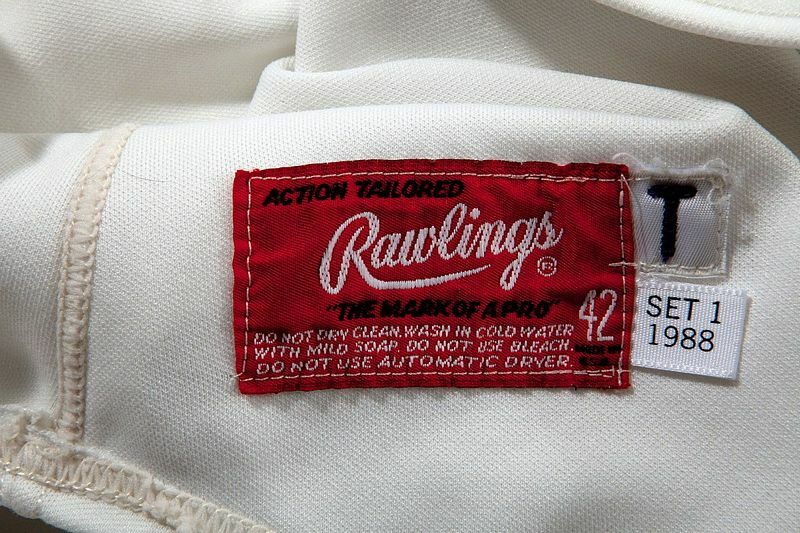 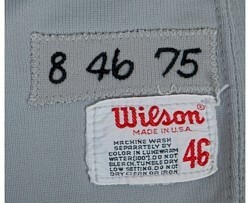 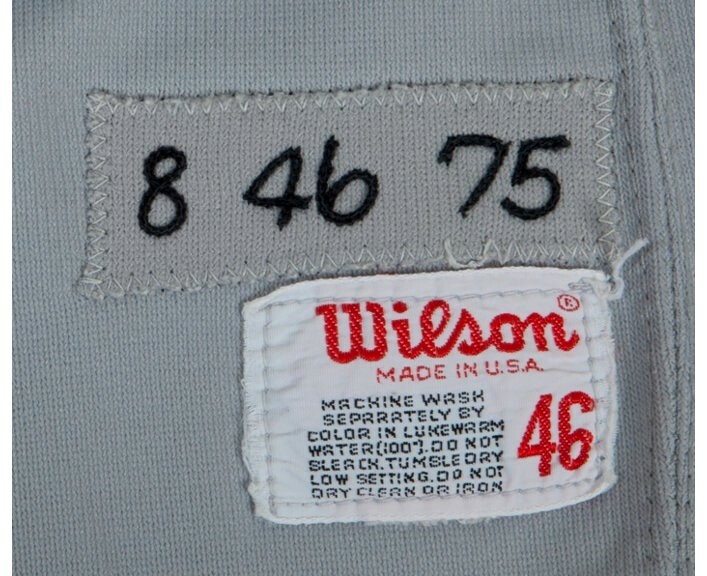 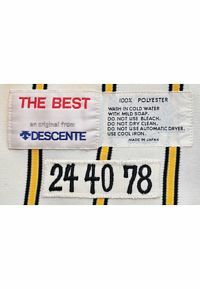 By 1973 all teams were using a stretch knit fabric of some type. 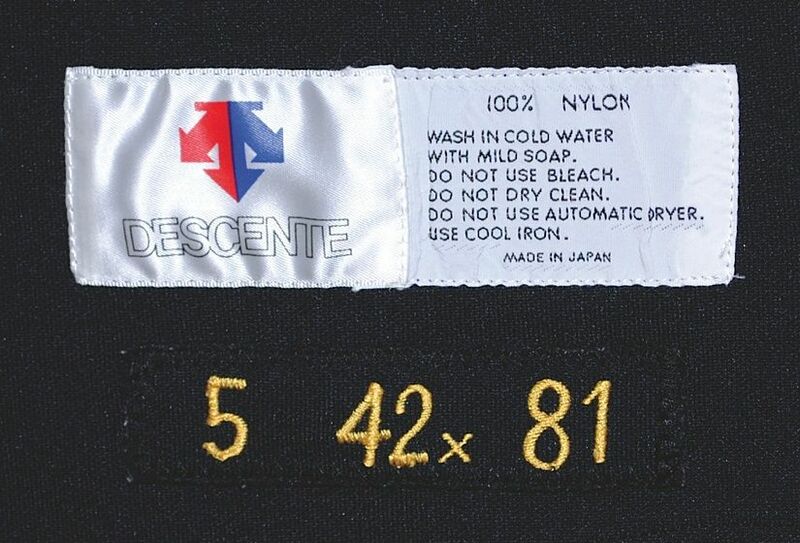 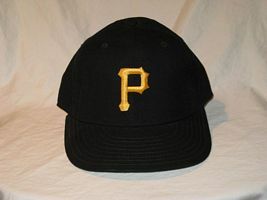 Cap changes to a smoother fabric and a more yellow gold color. 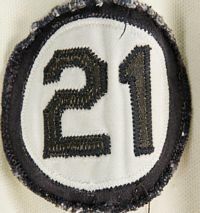 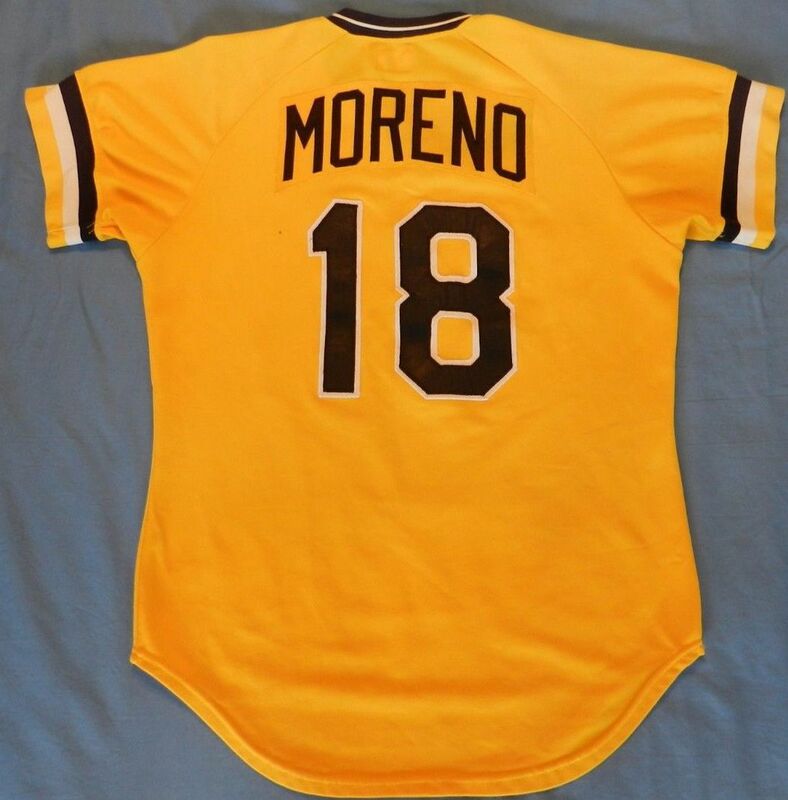 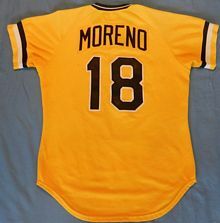 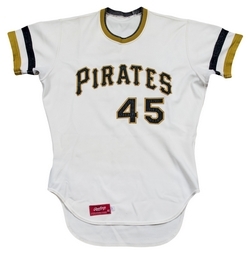 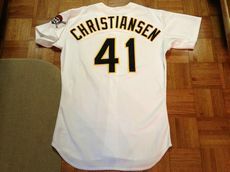 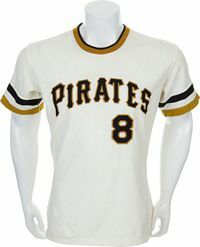 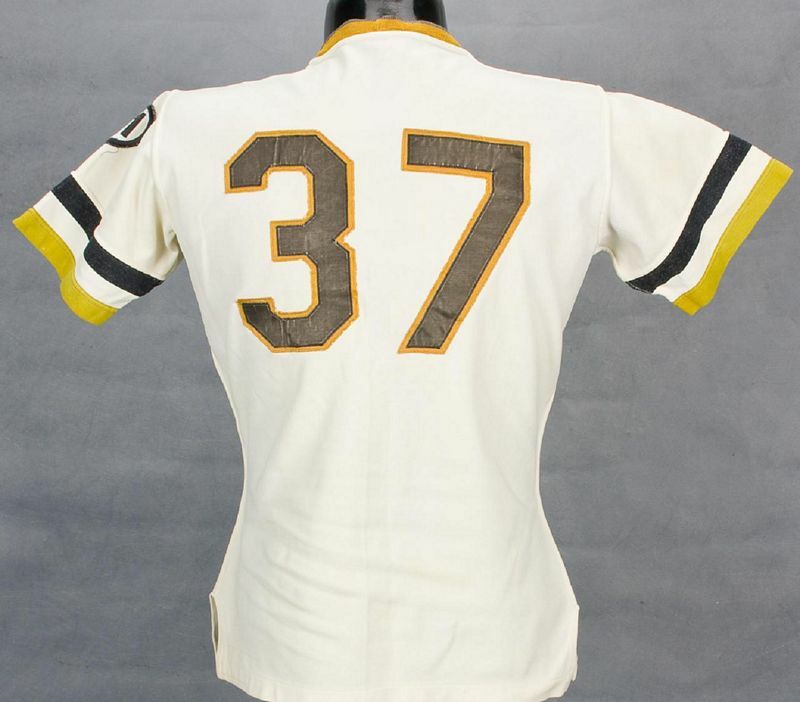 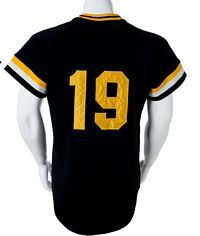 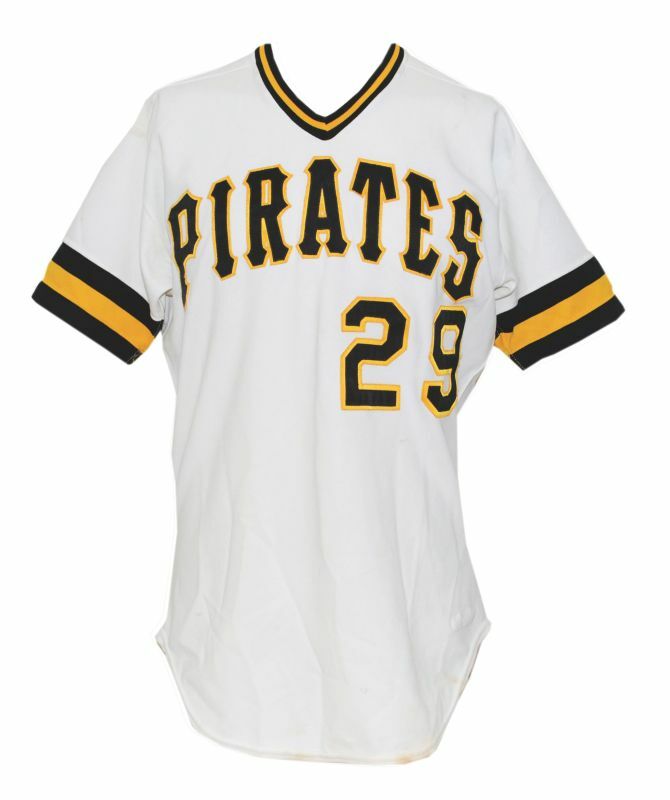 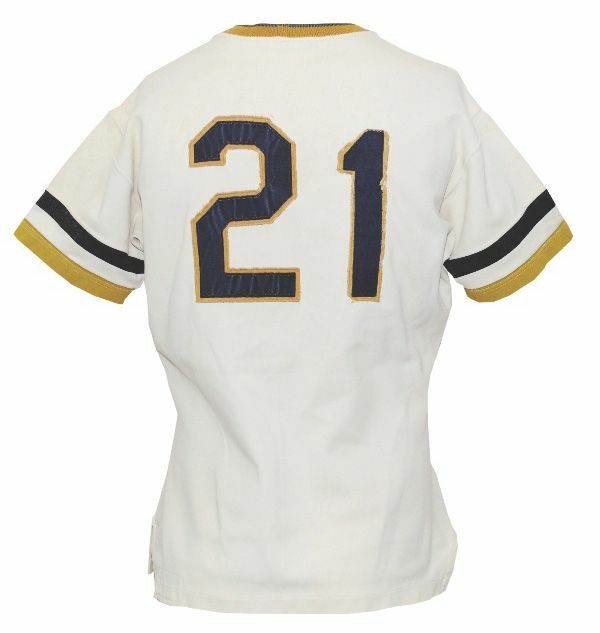 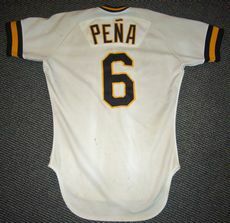 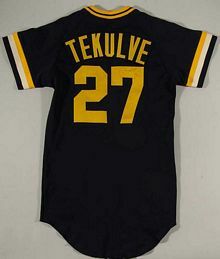 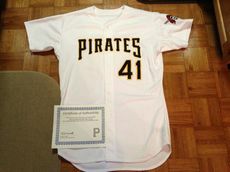 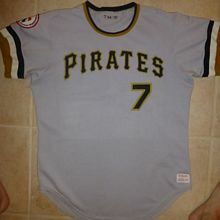 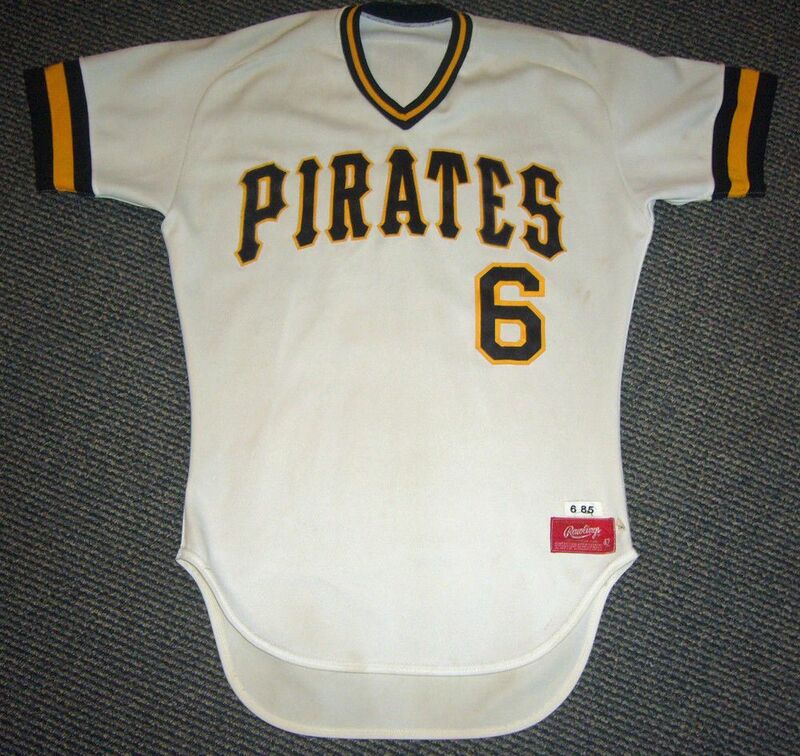 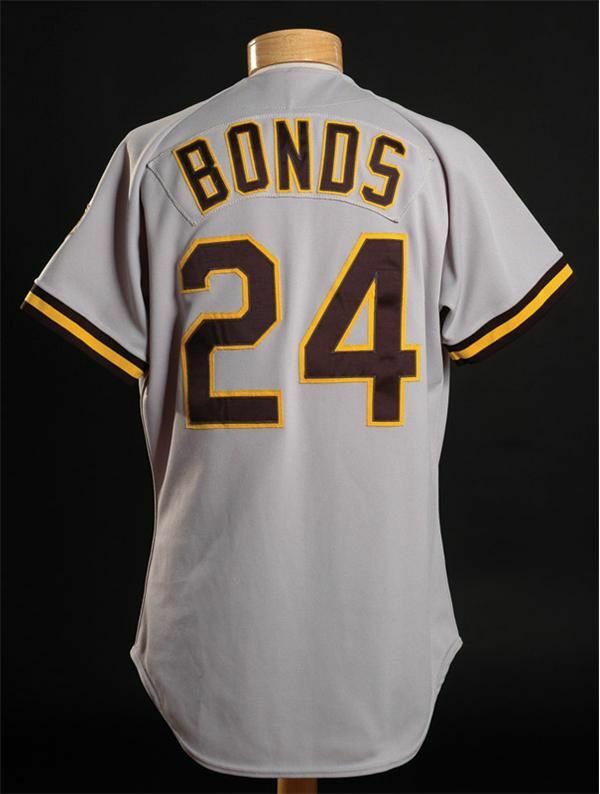 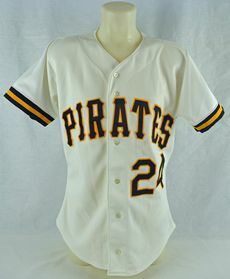 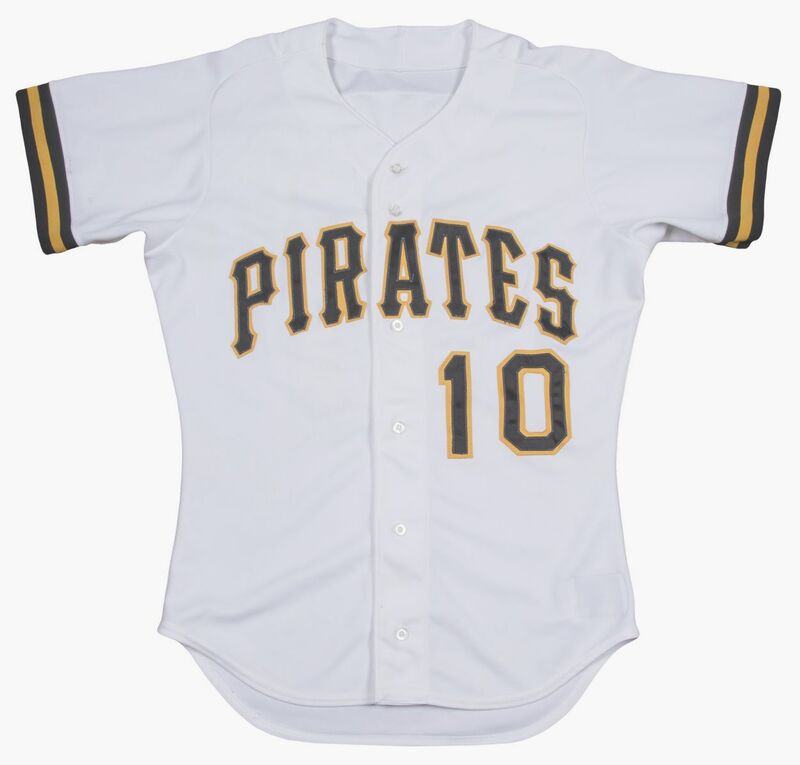 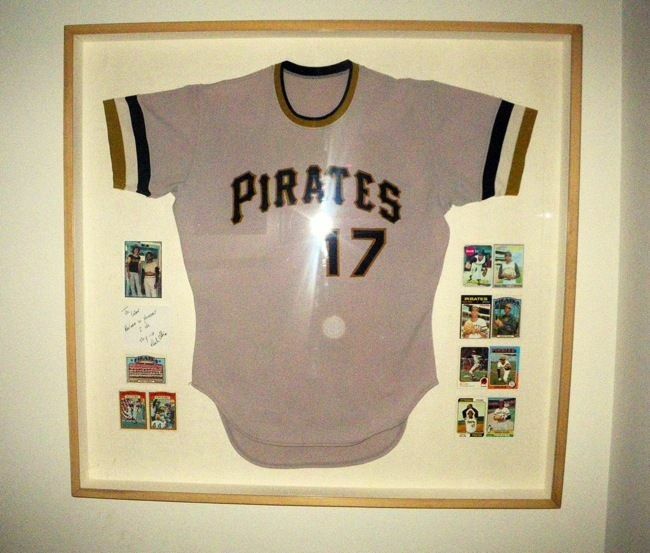 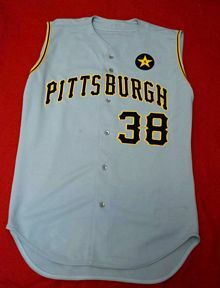 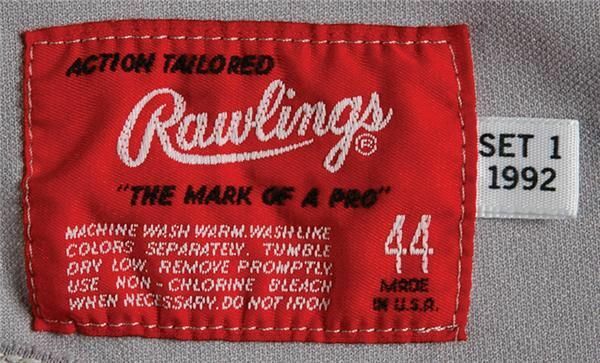 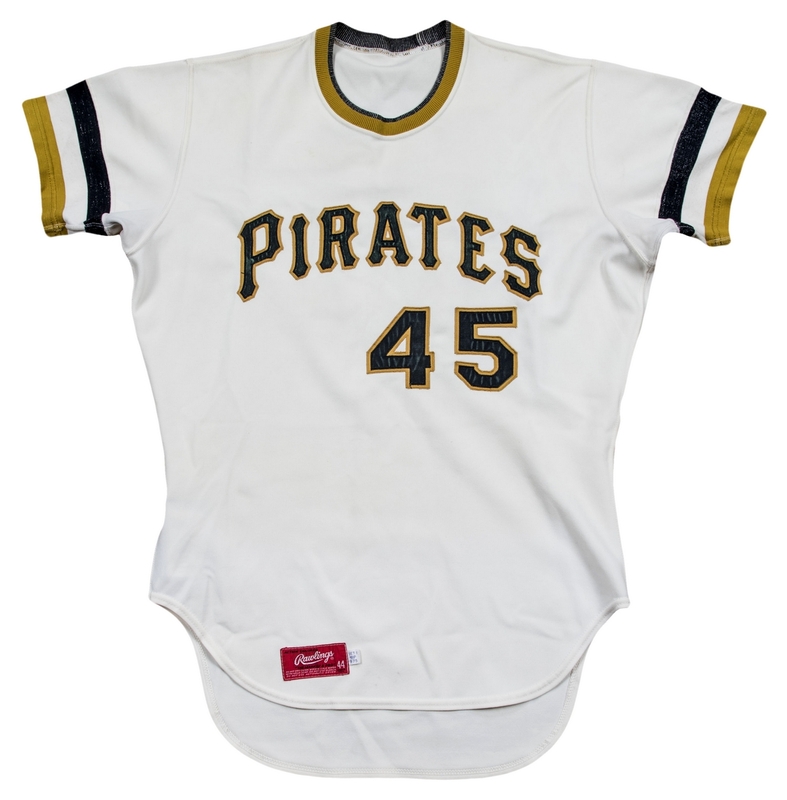 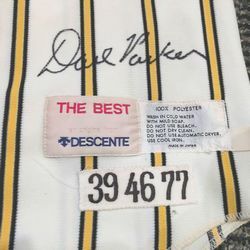 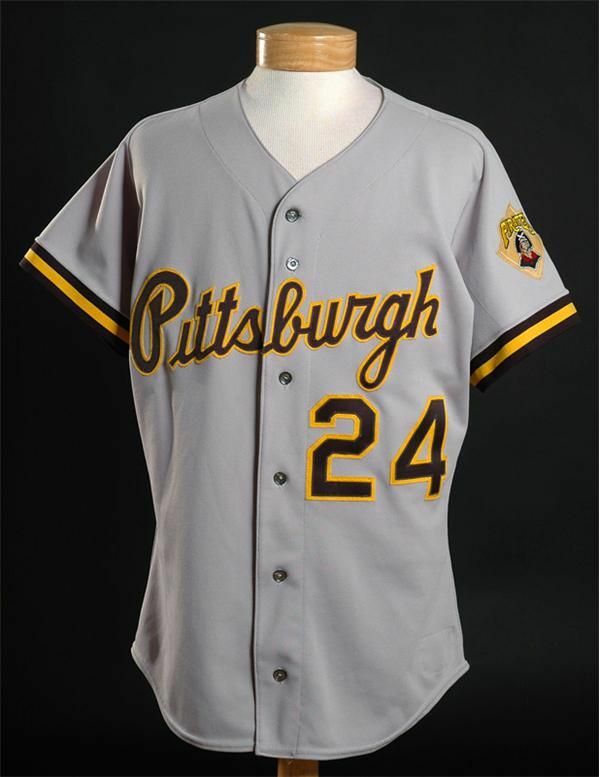 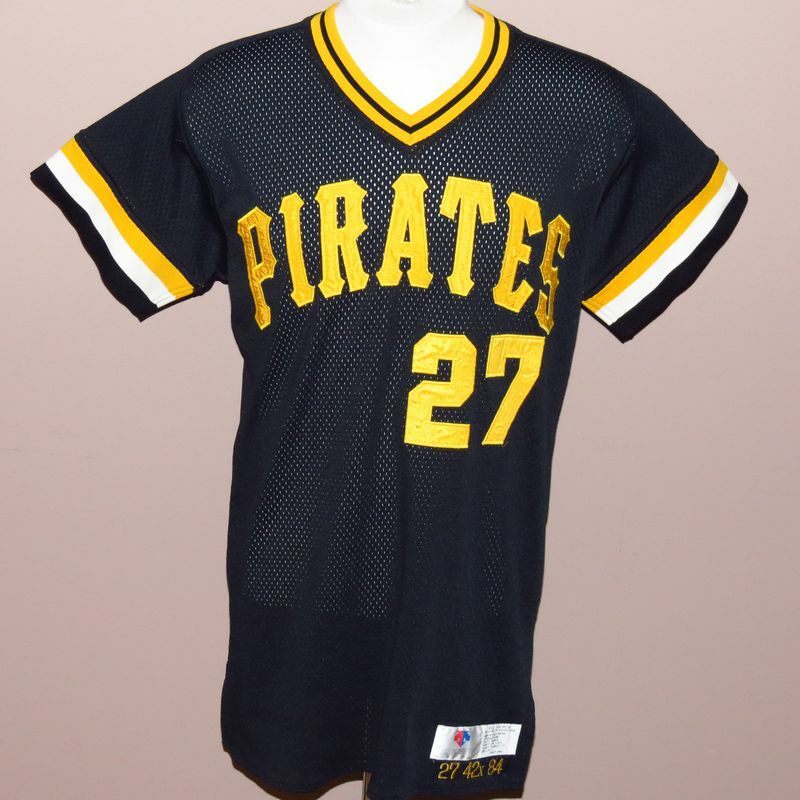 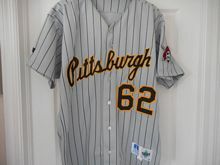 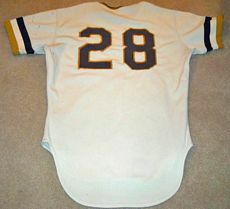 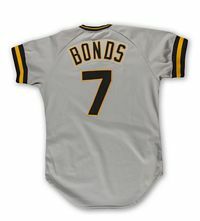 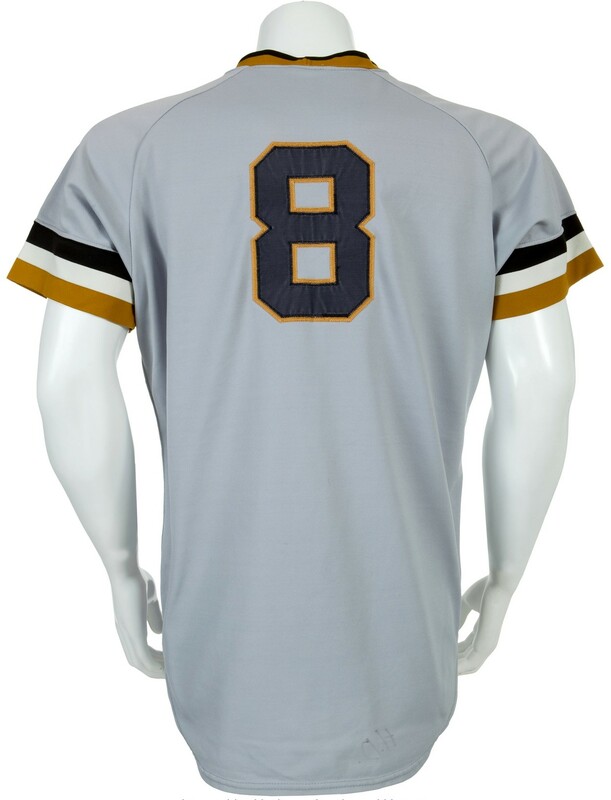 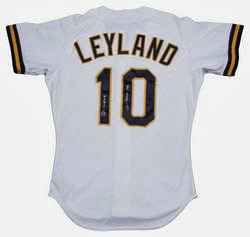 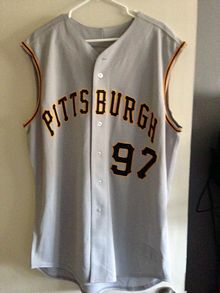 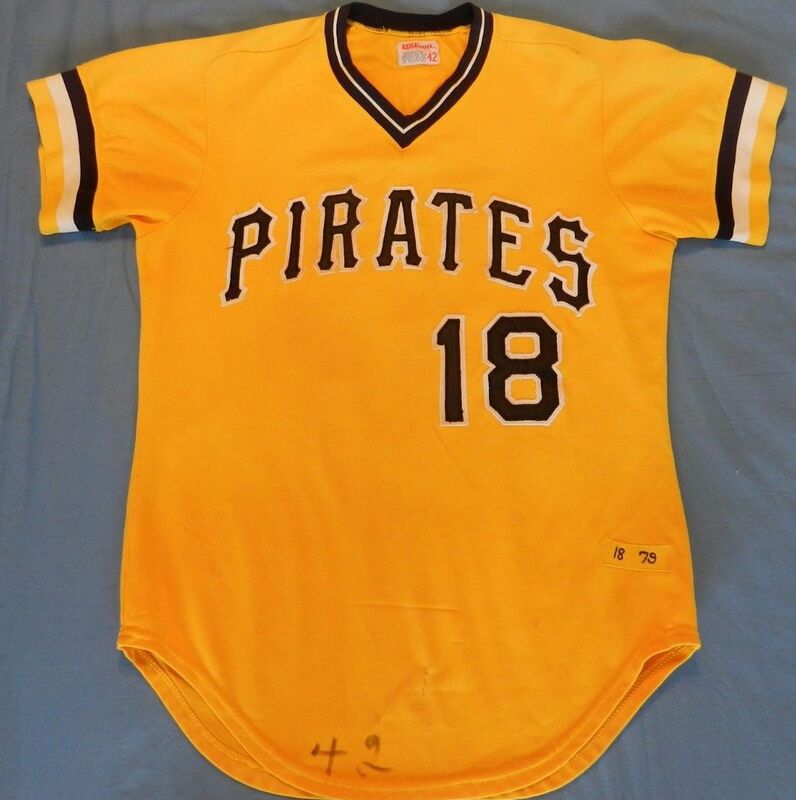 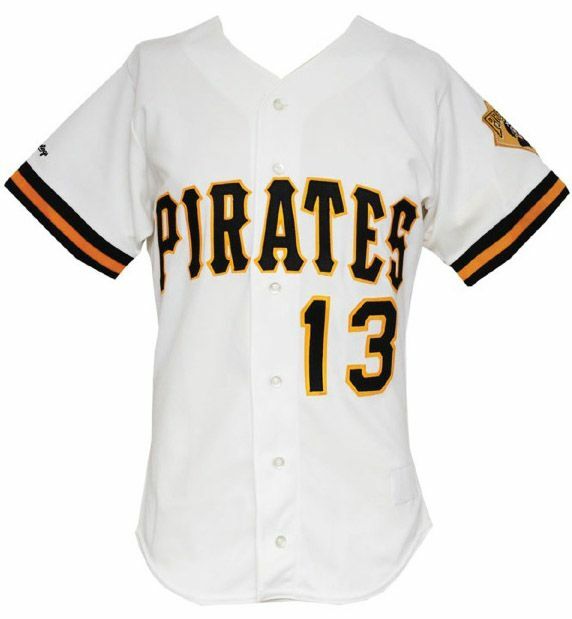 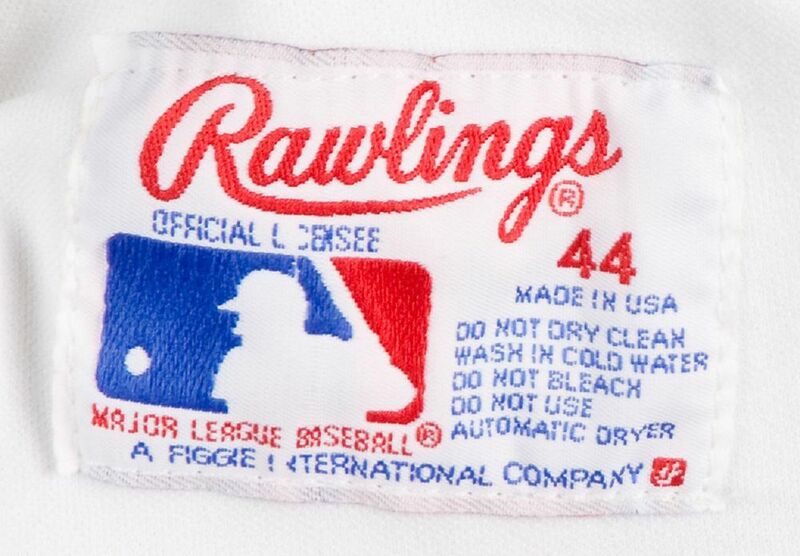 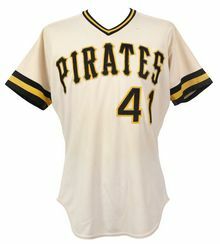 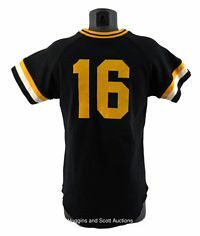 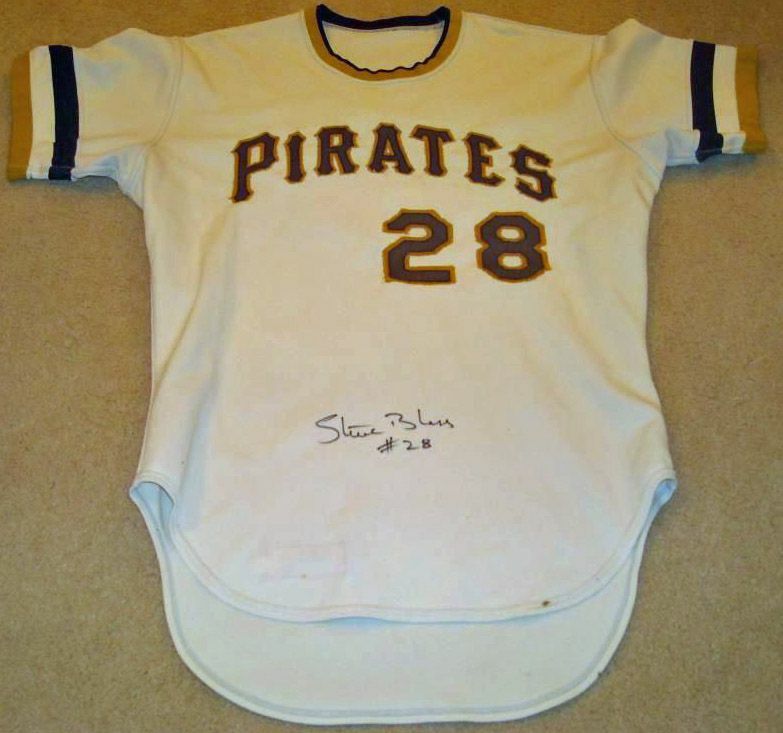 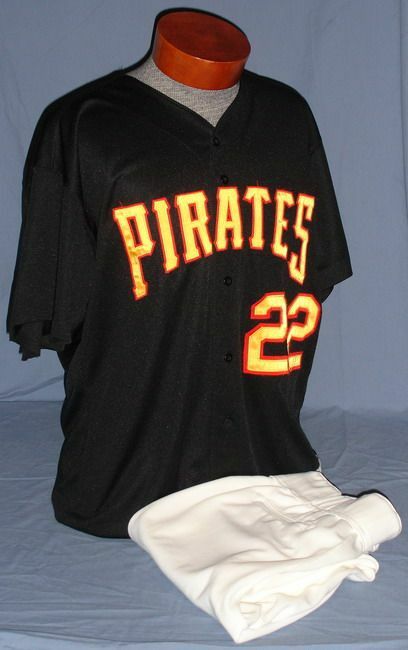 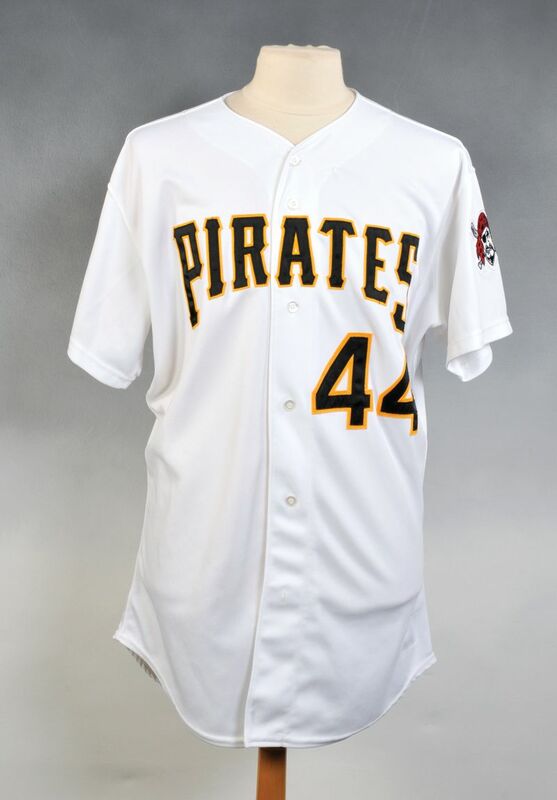 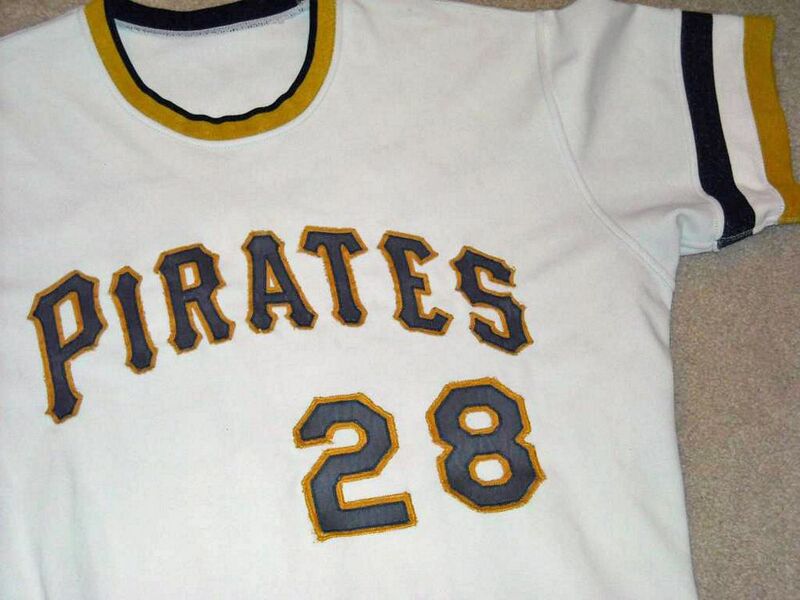 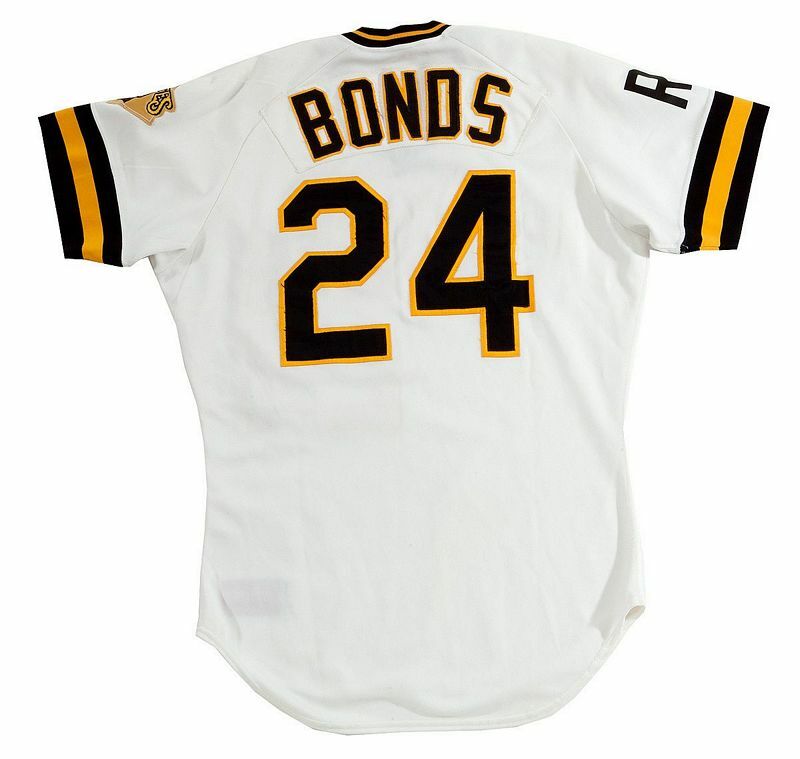 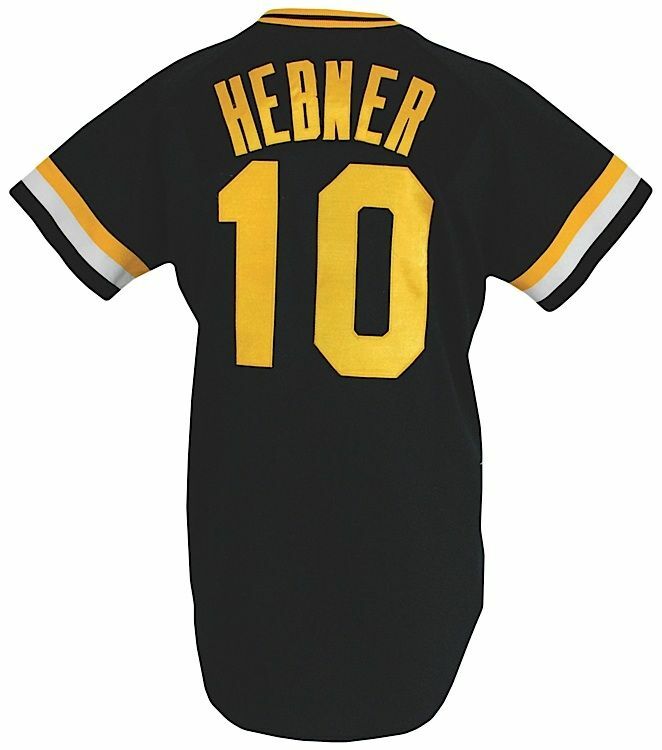 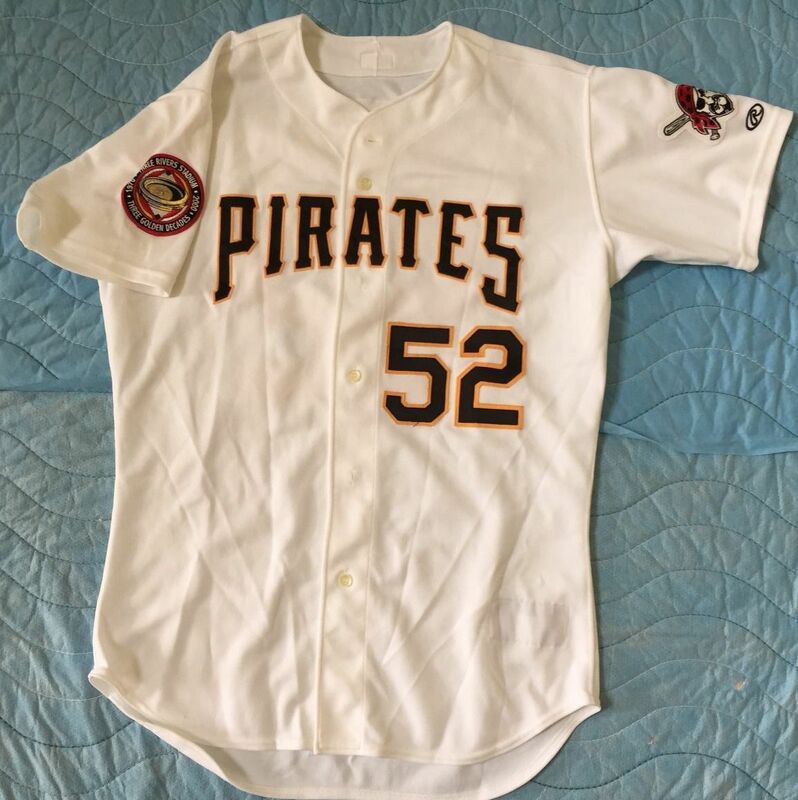 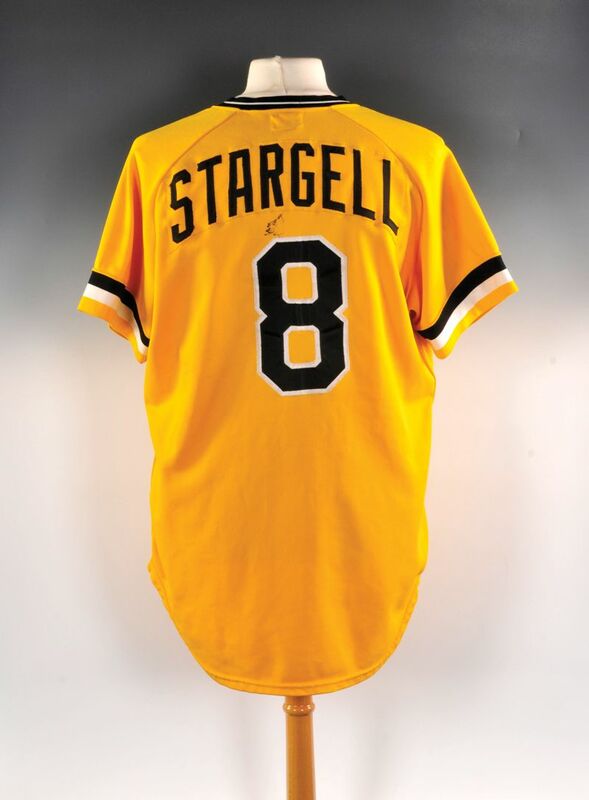 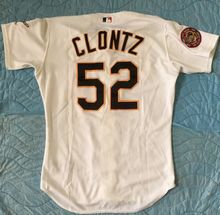 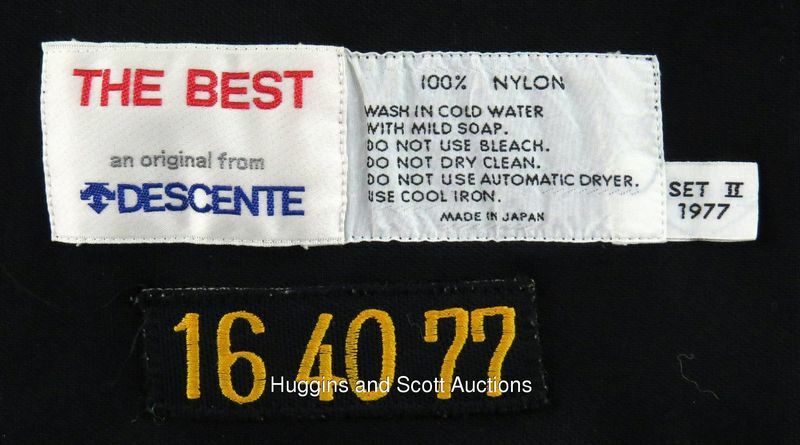 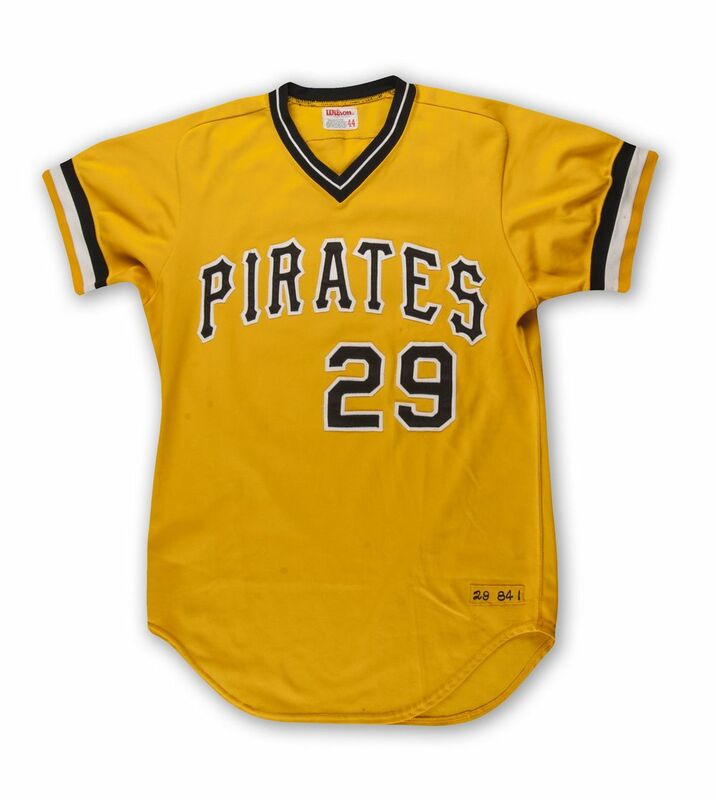 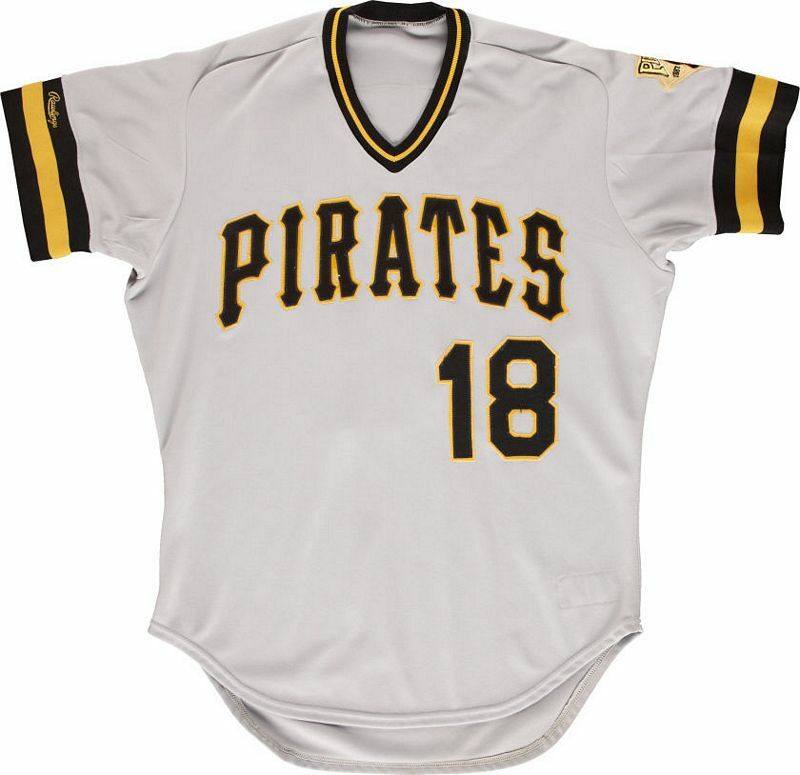 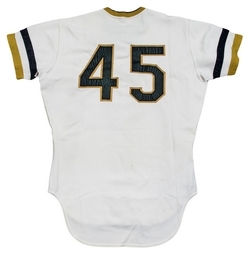 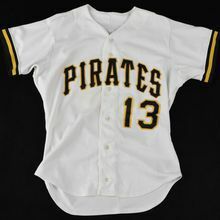 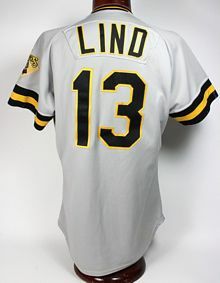 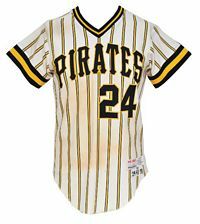 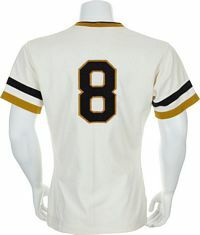 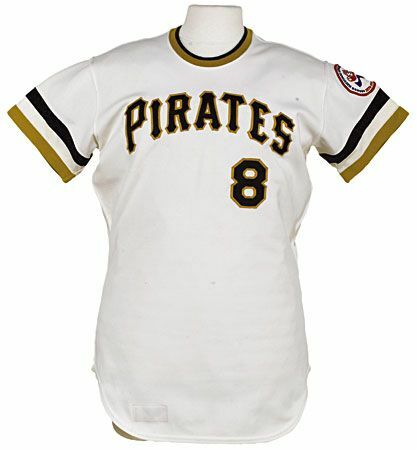 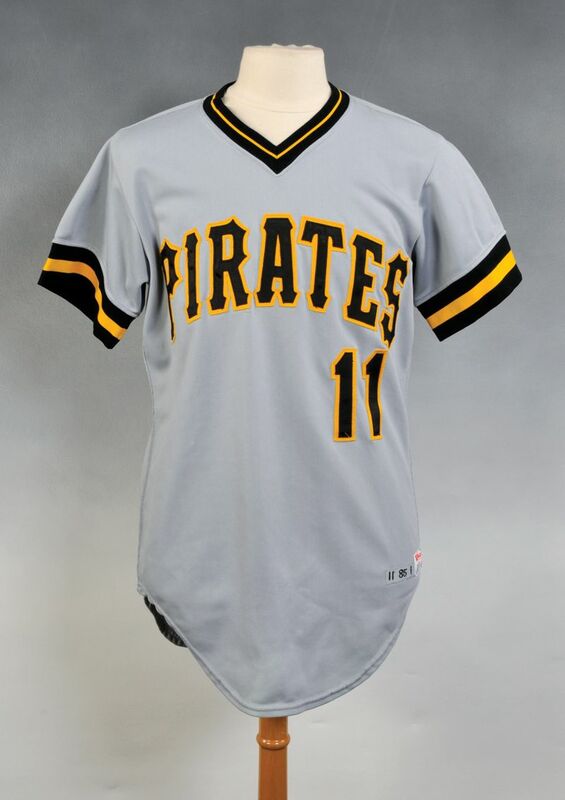 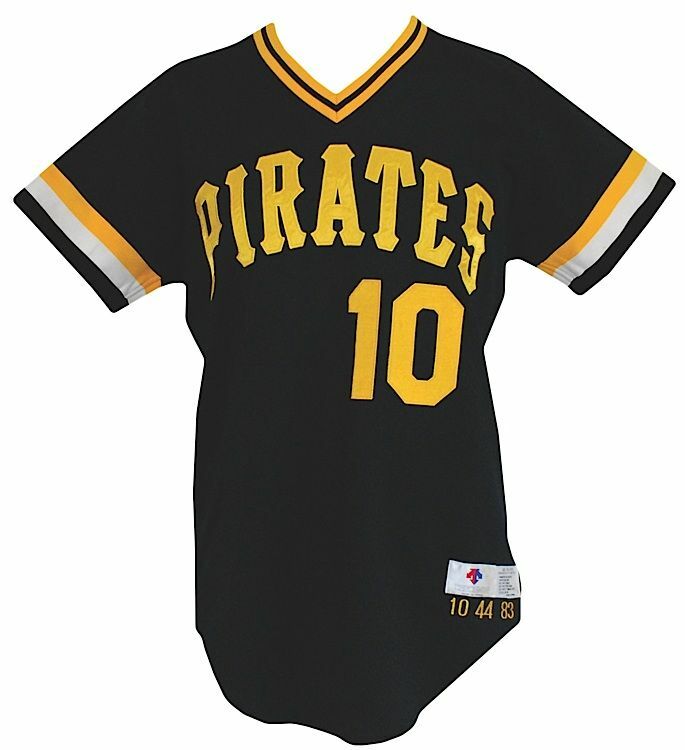 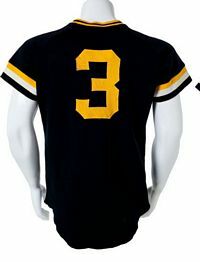 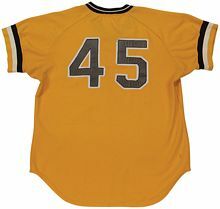 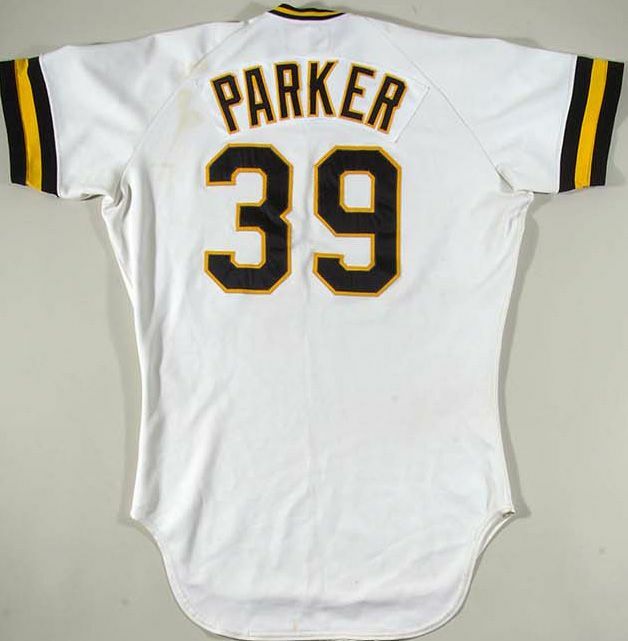 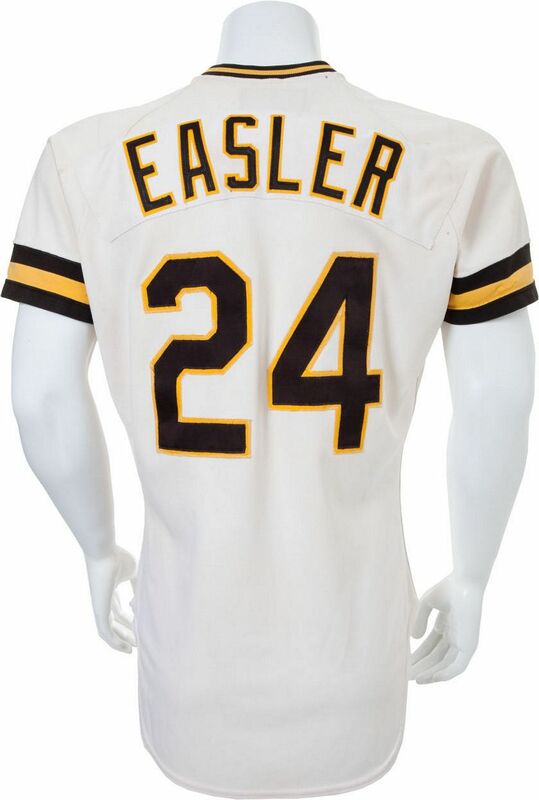 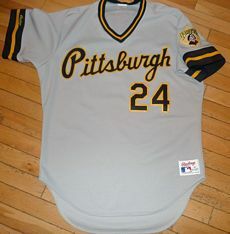 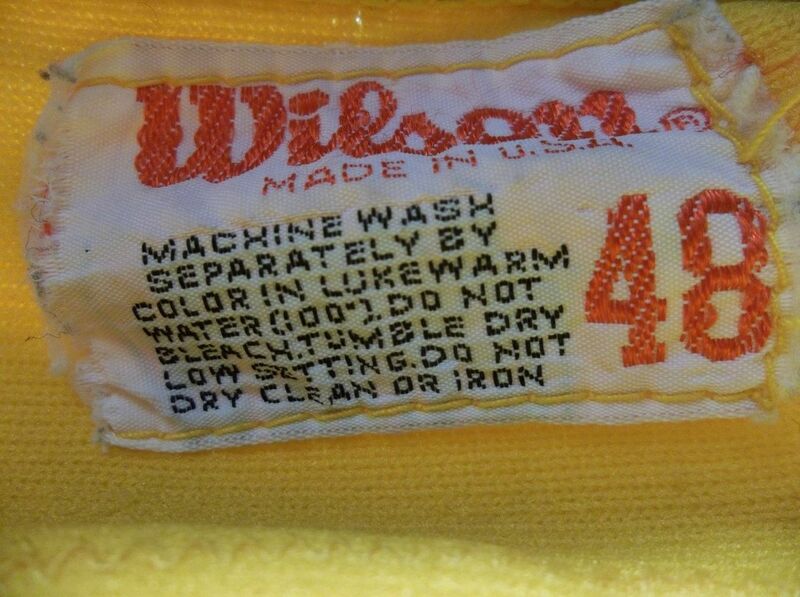 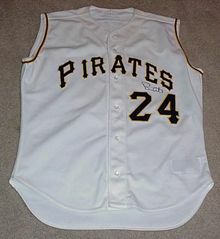 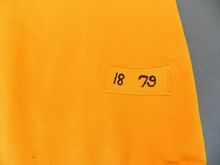 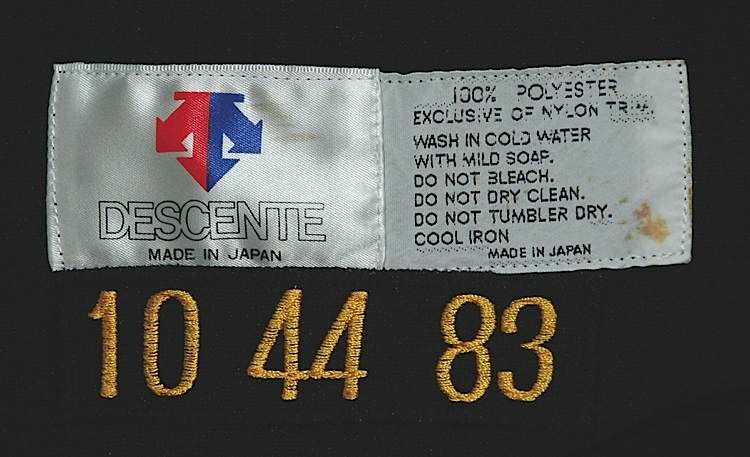 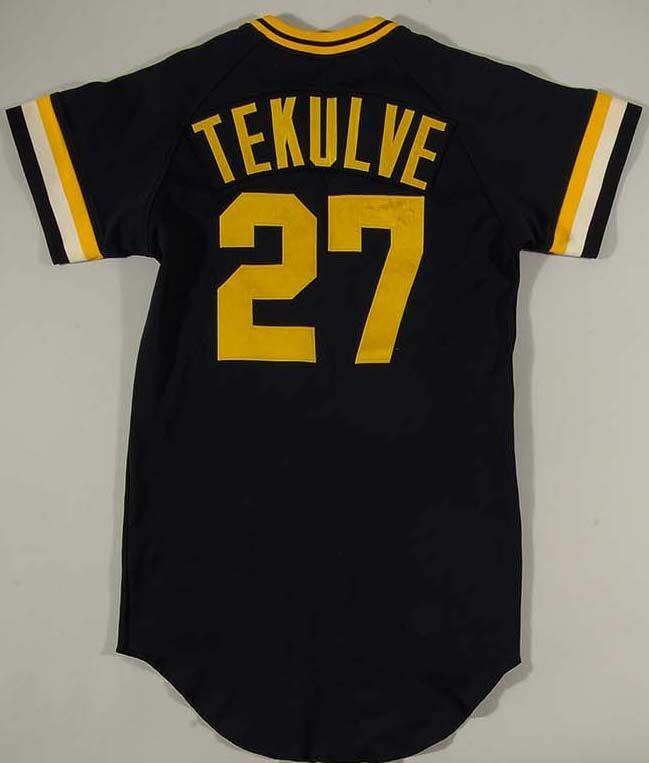 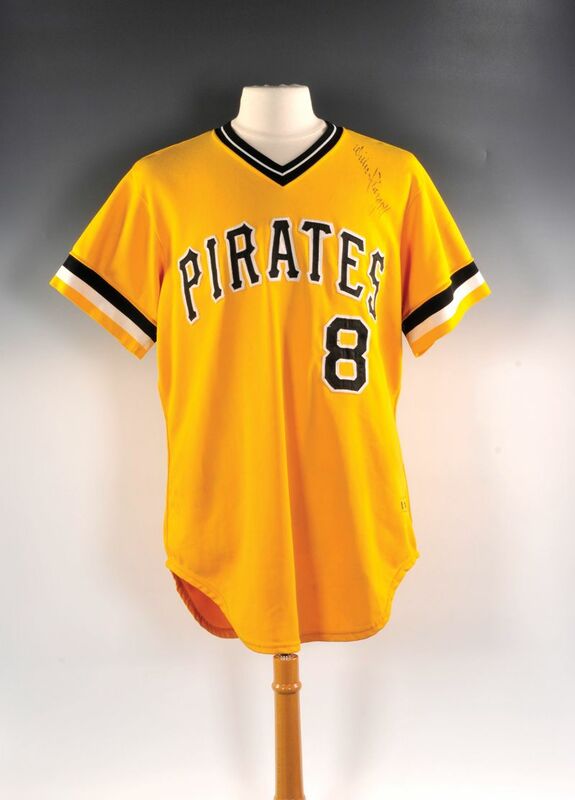 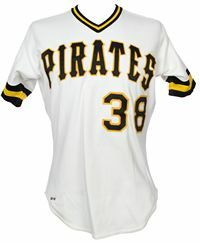 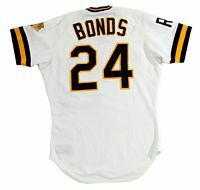 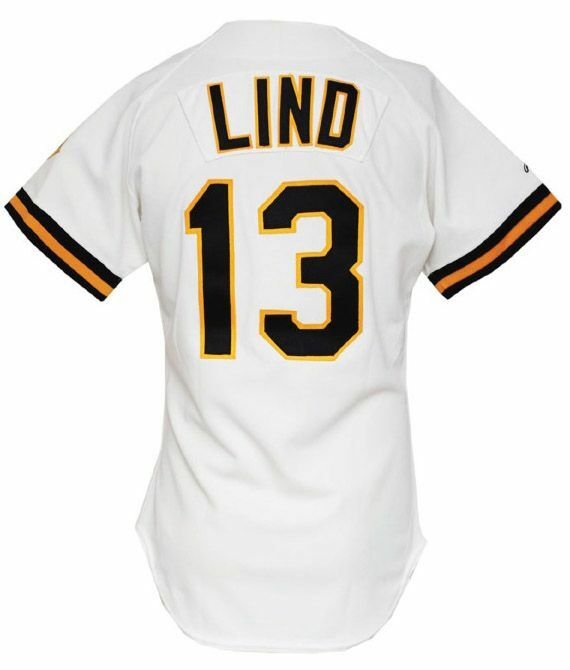 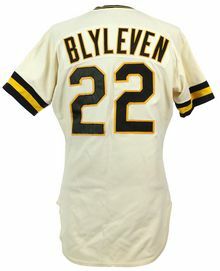 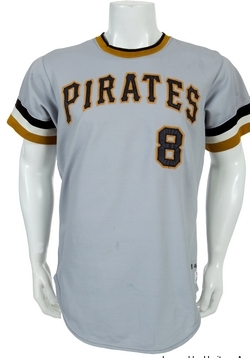 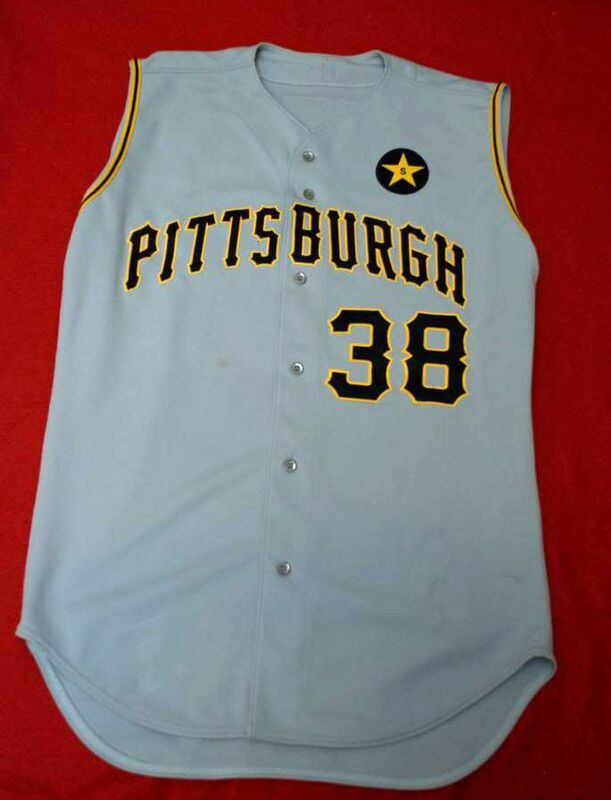 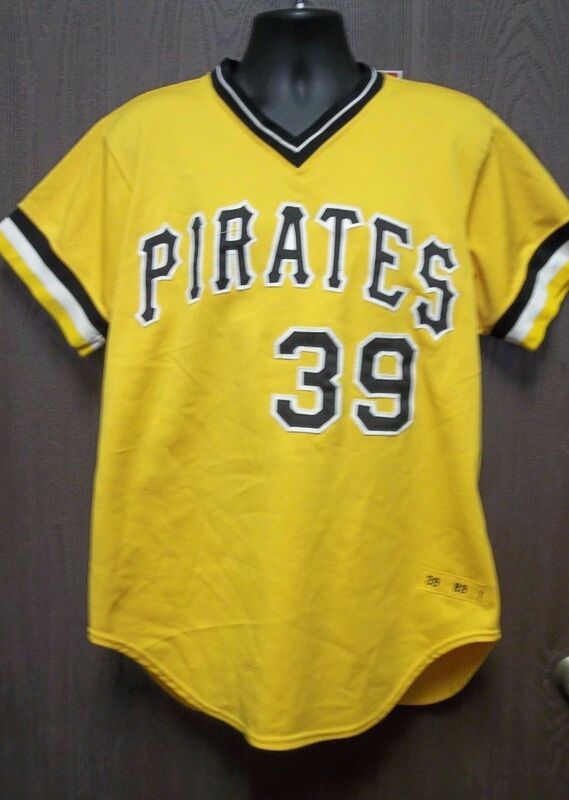 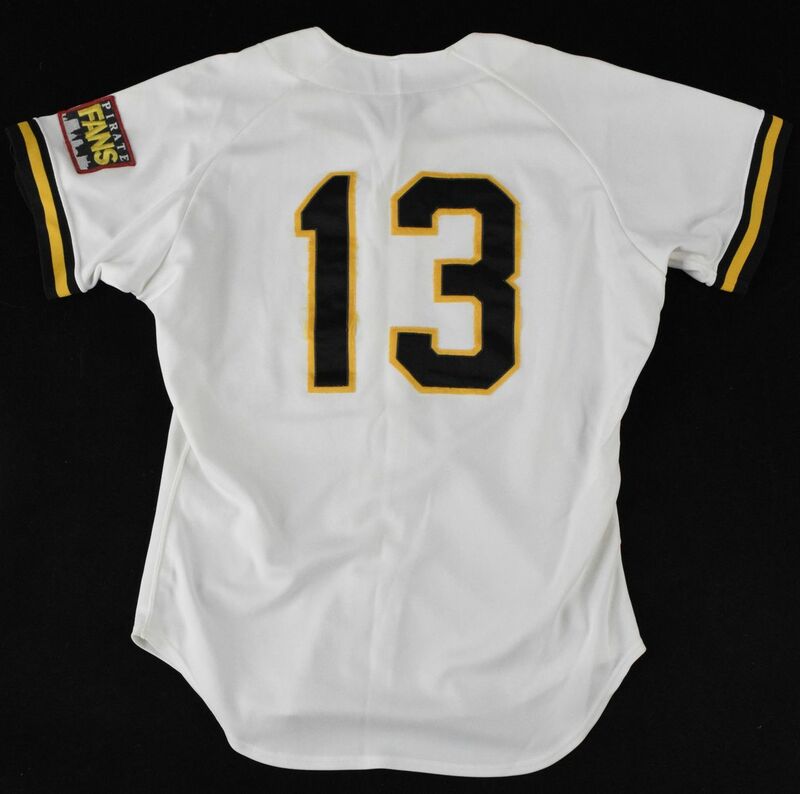 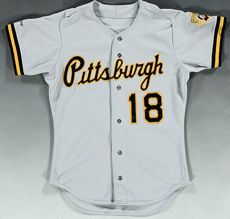 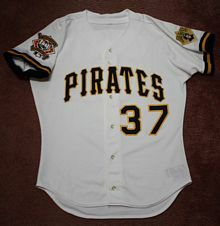 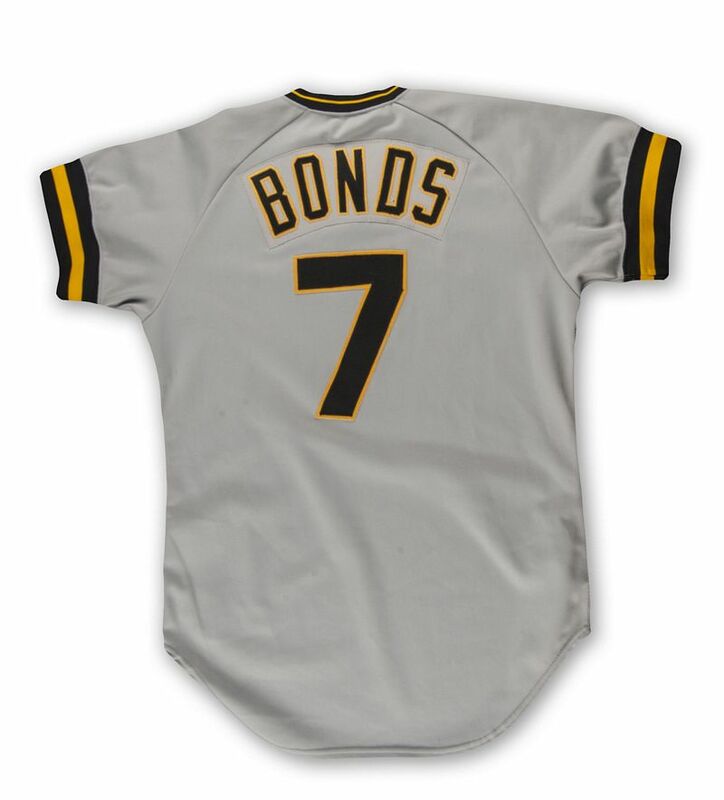 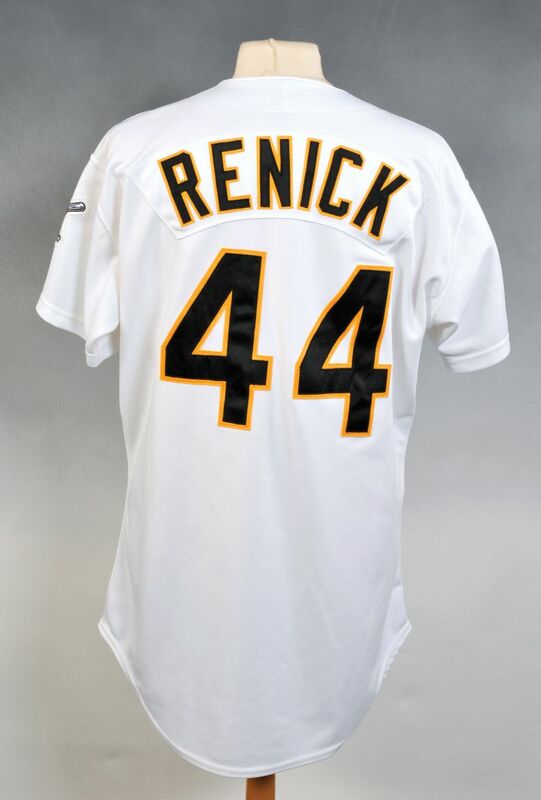 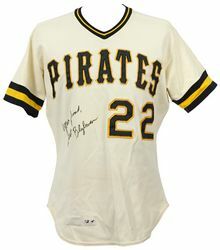 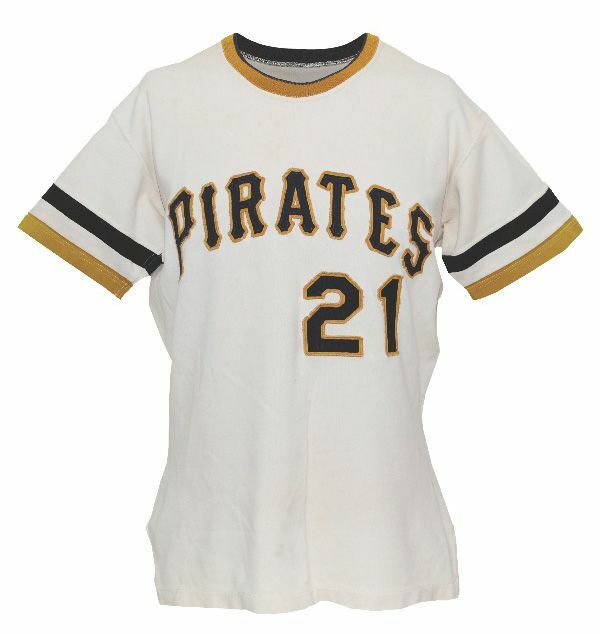 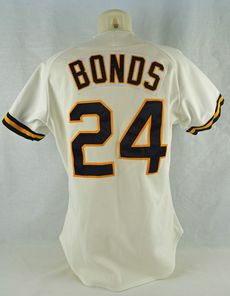 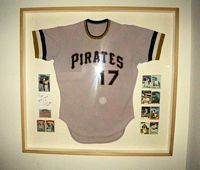 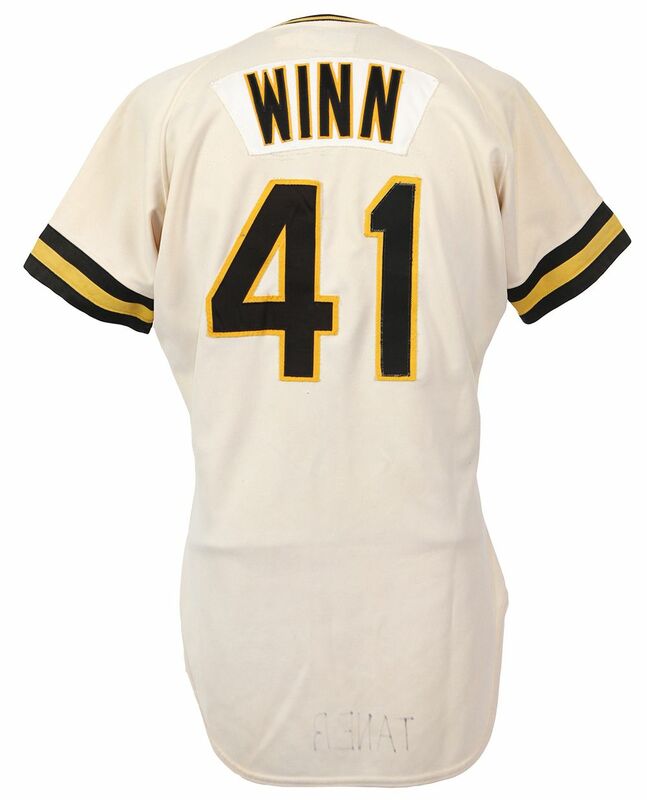 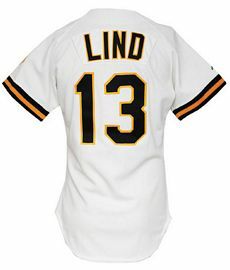 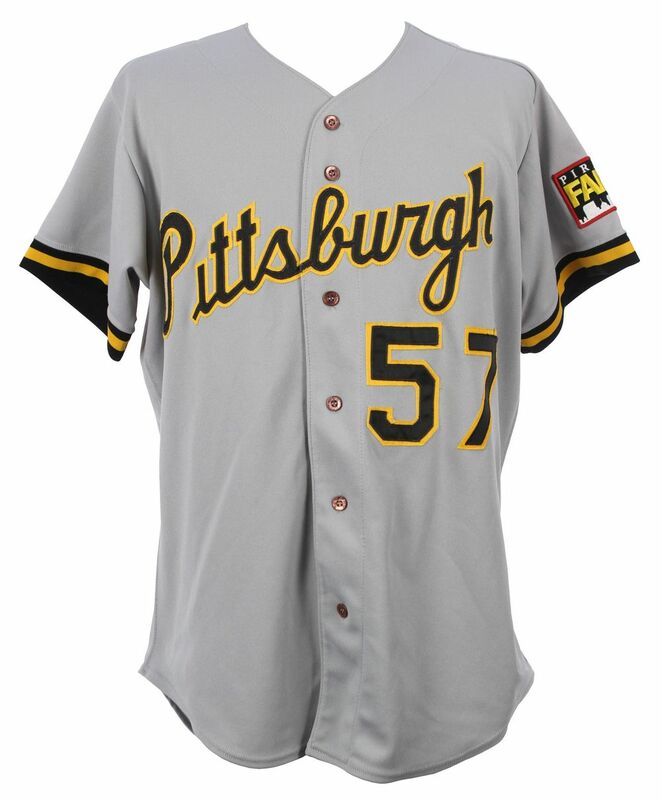 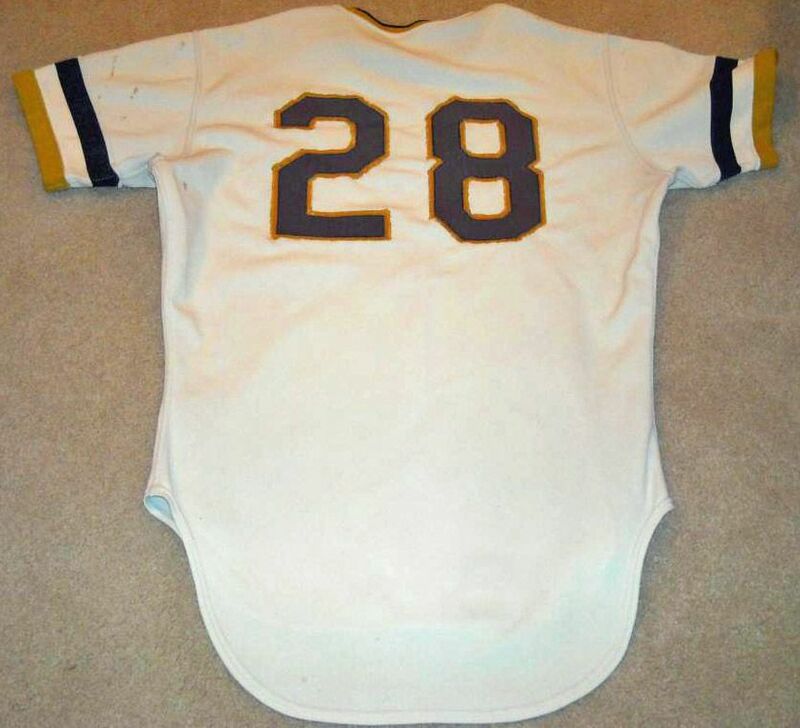 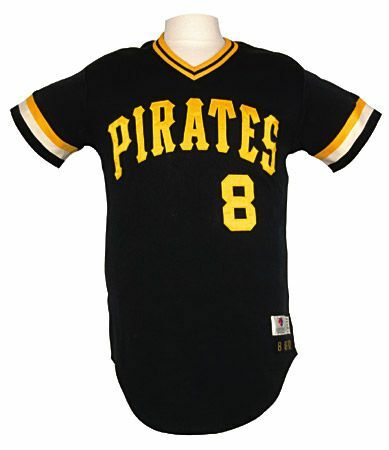 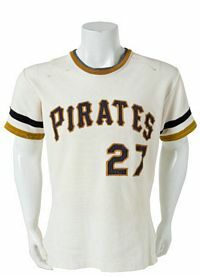 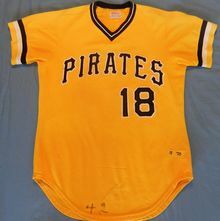 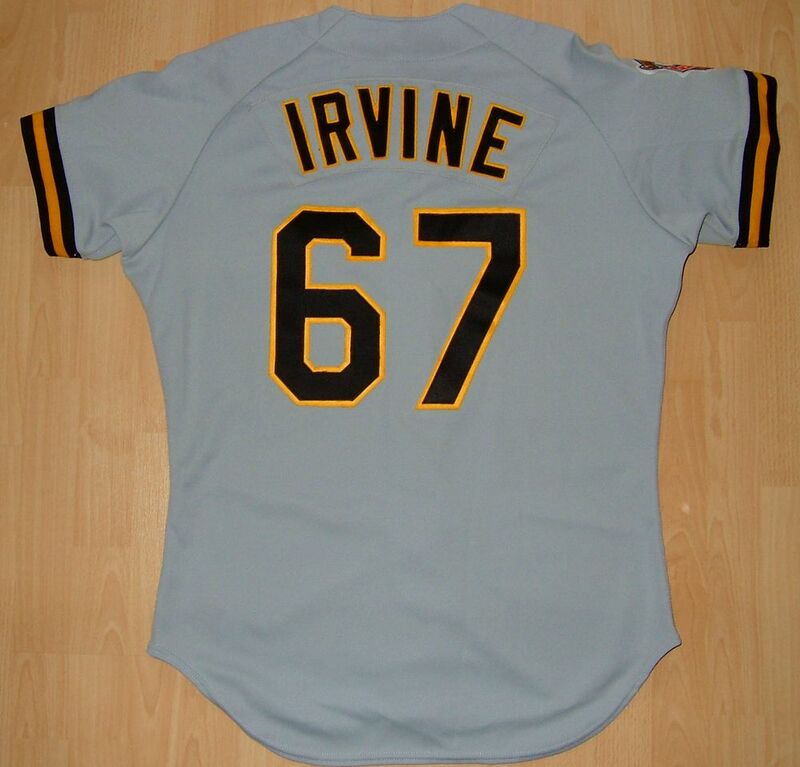 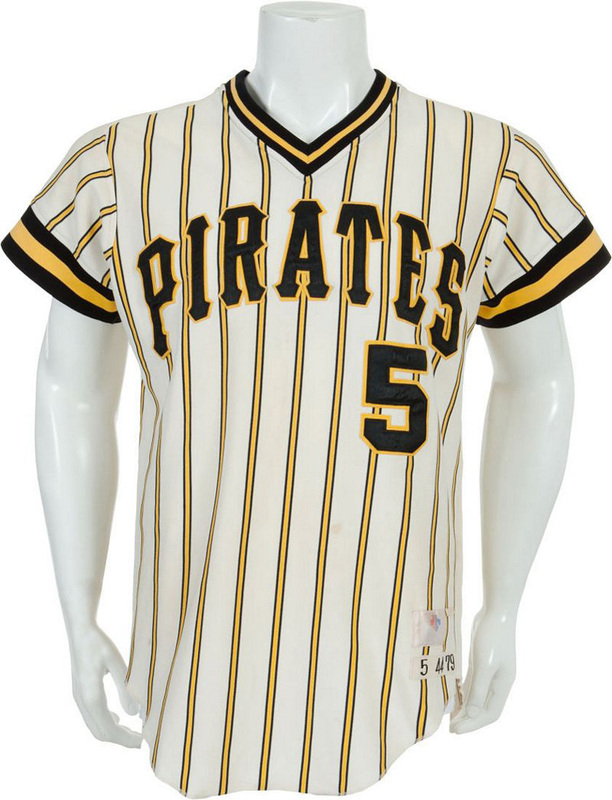 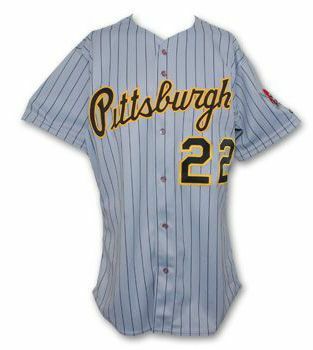 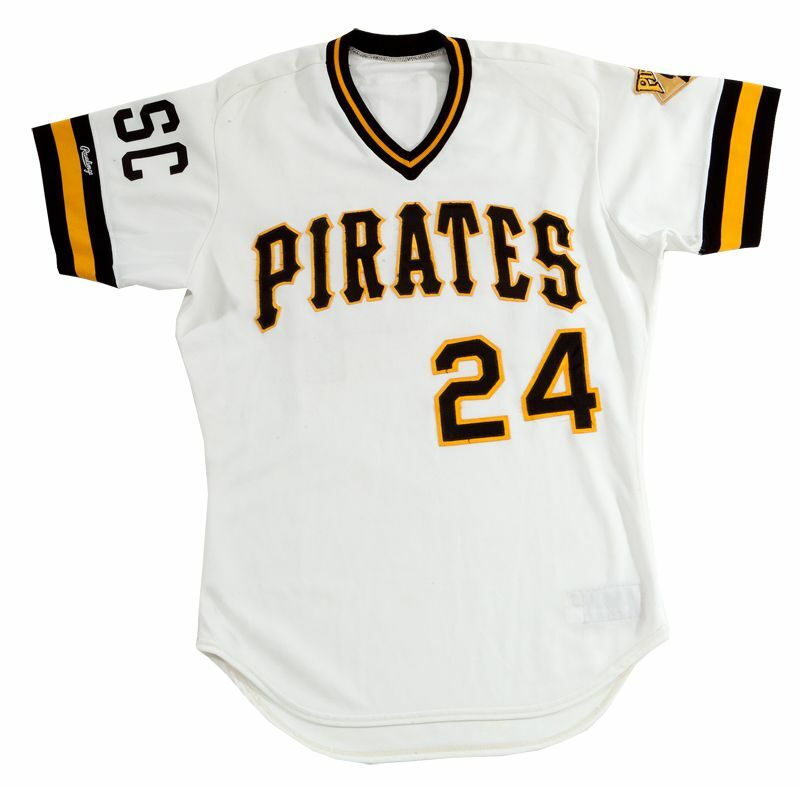 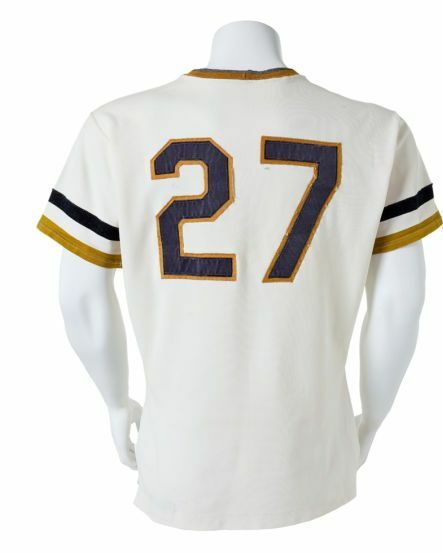 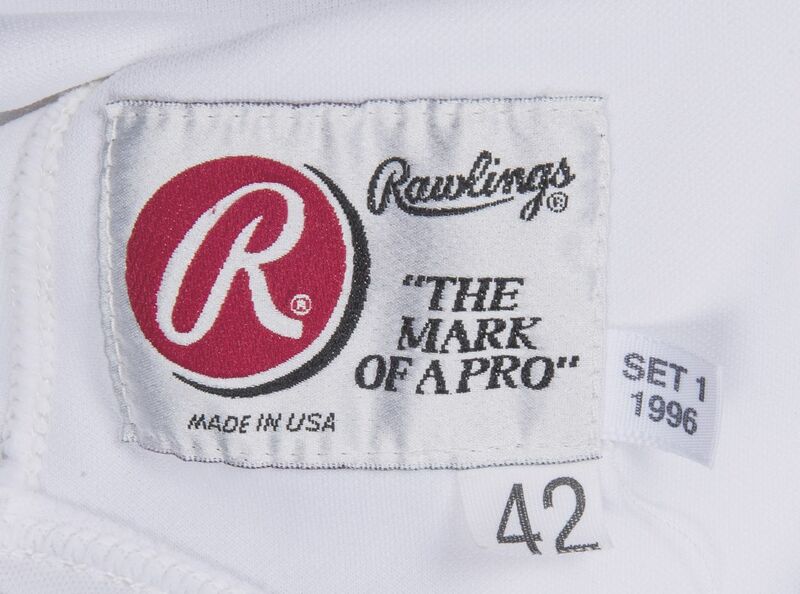 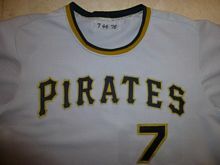 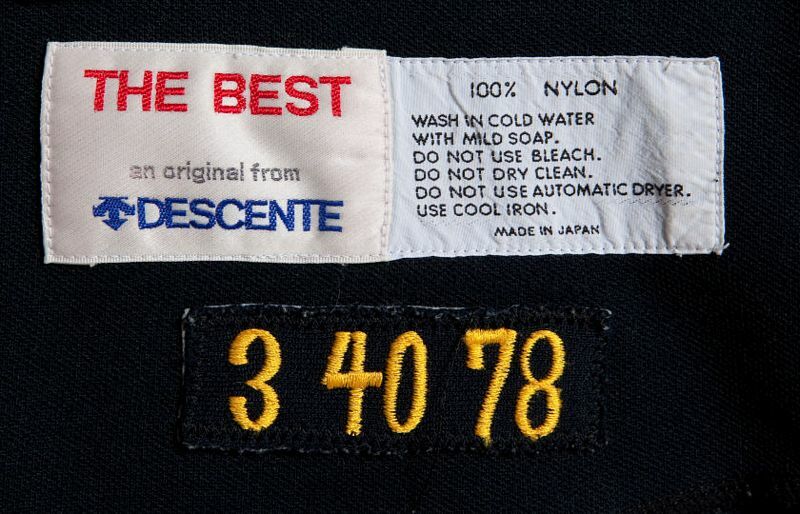 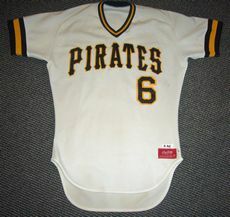 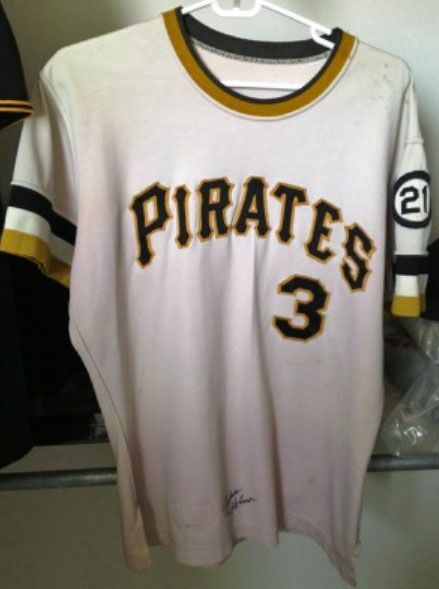 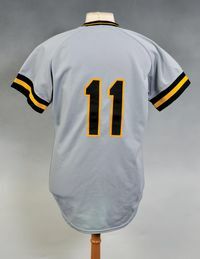 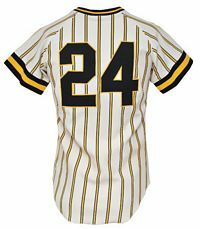 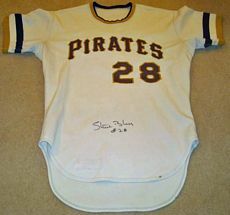 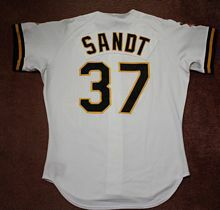 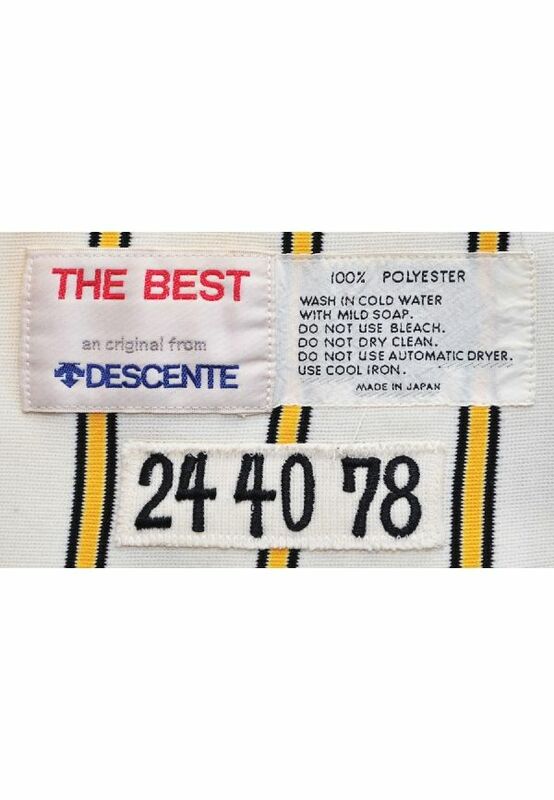 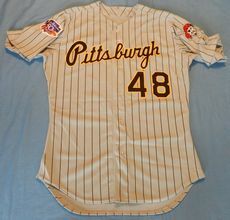 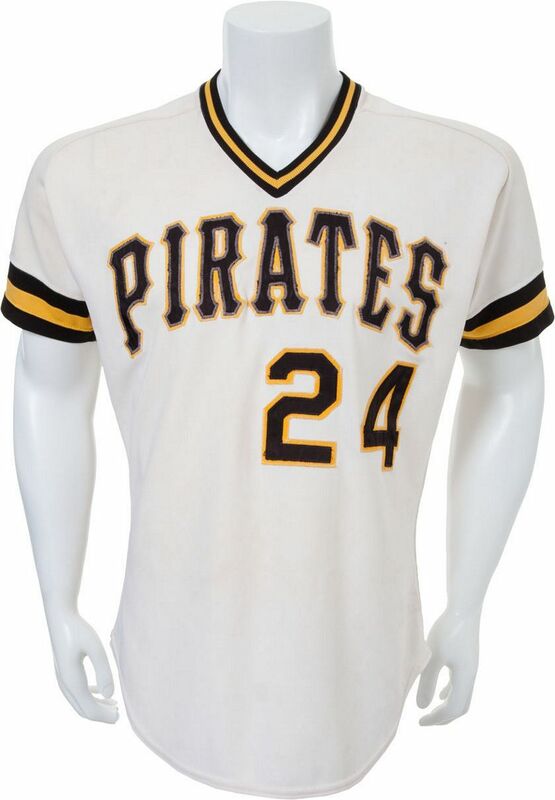 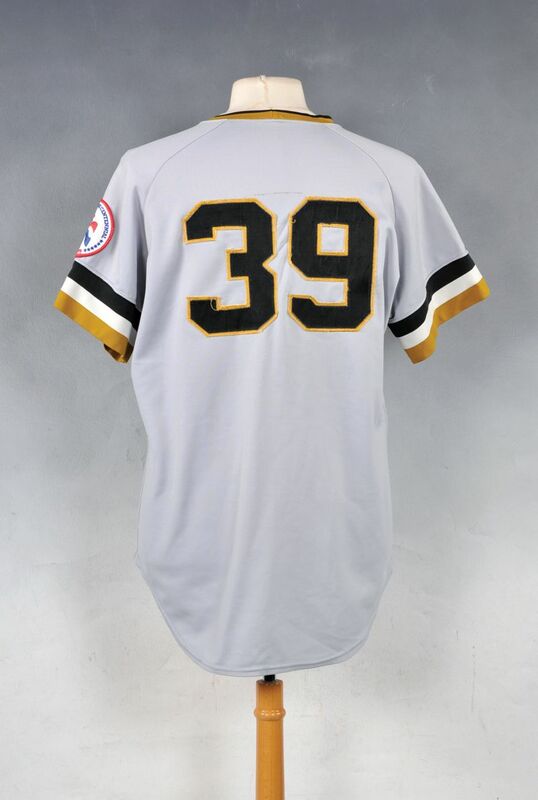 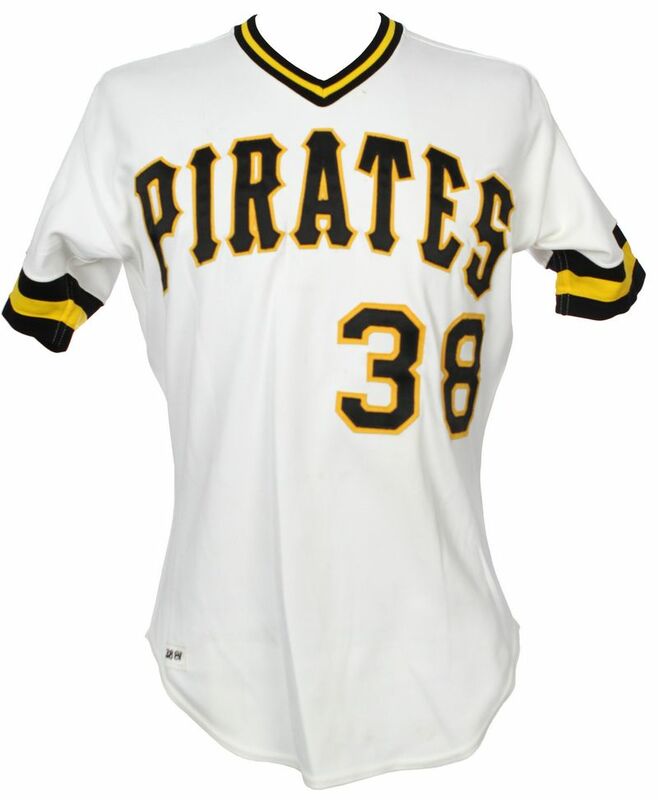 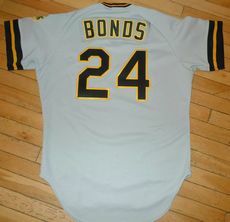 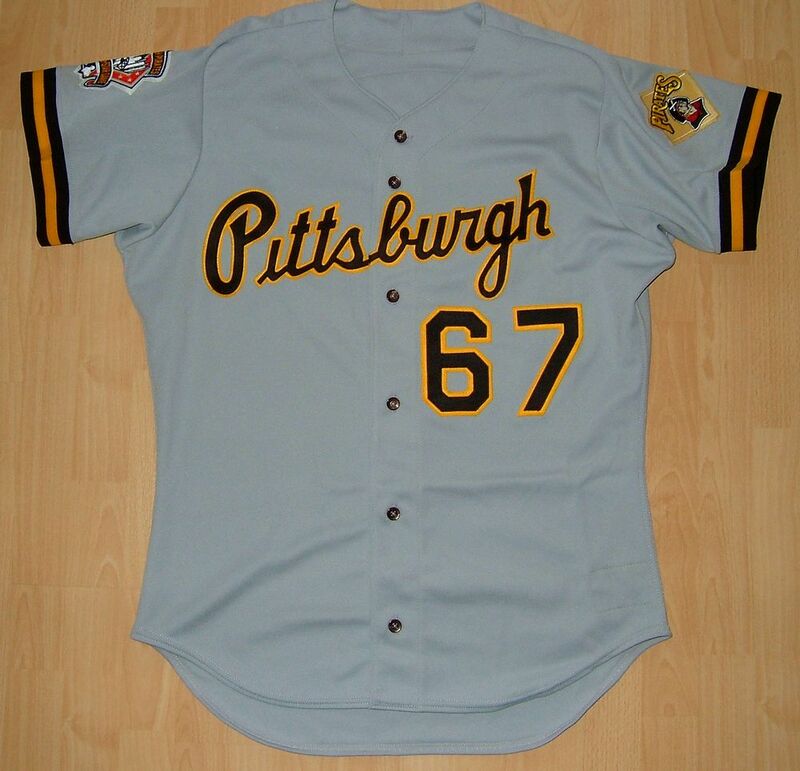 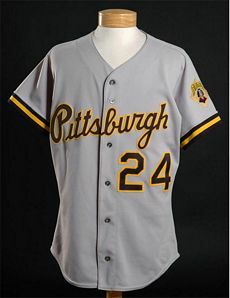 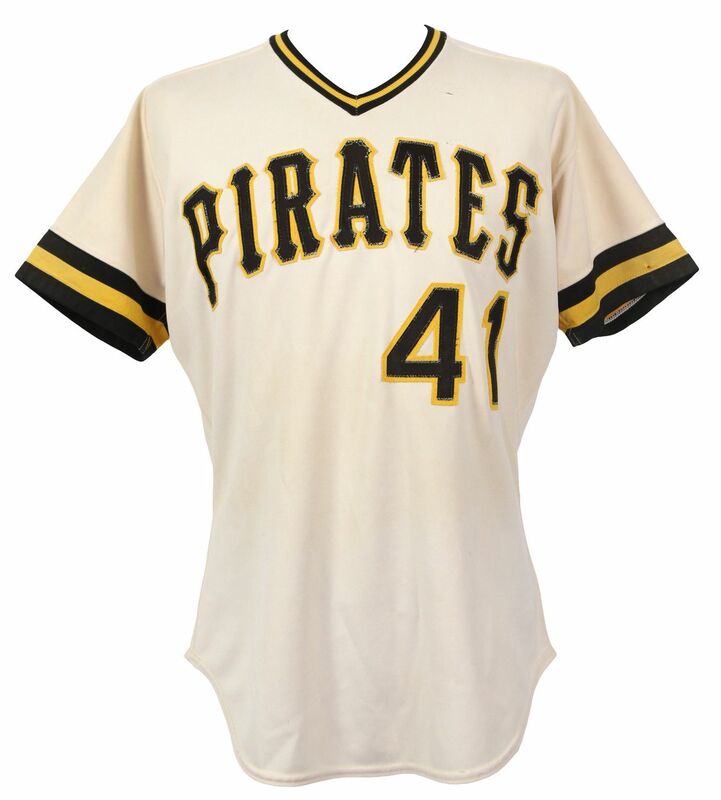 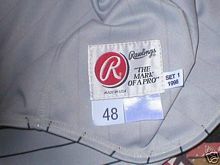 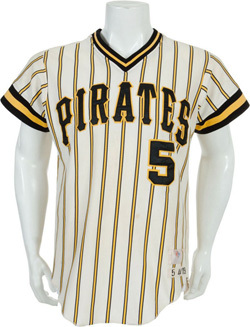 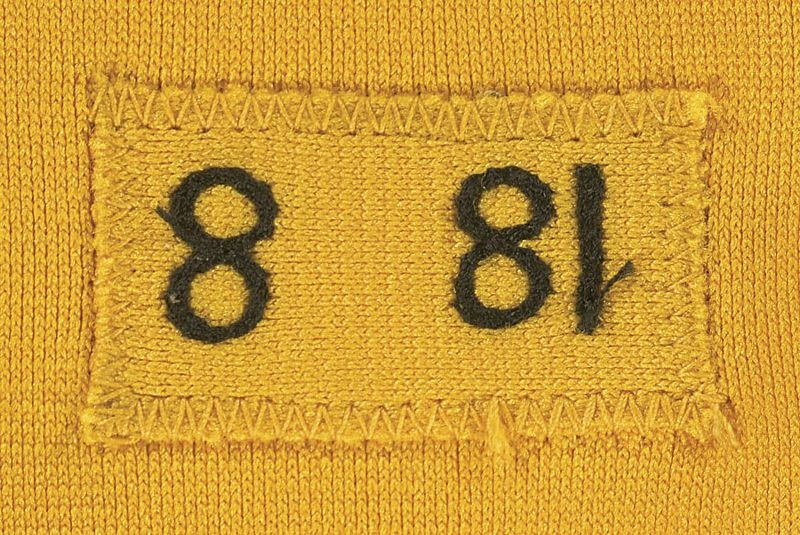 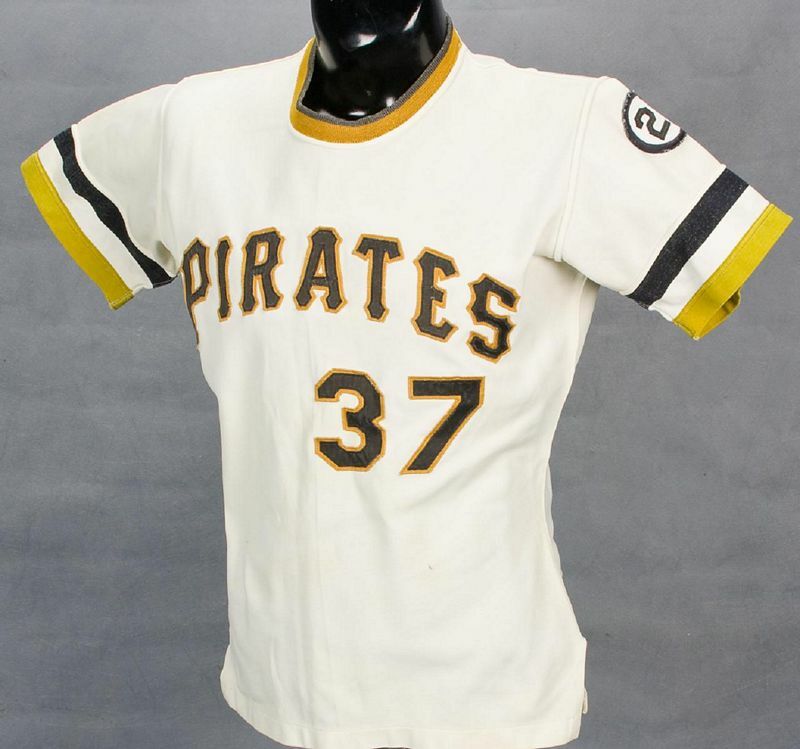 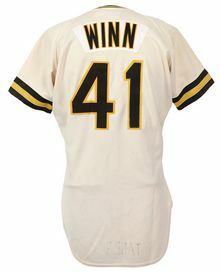 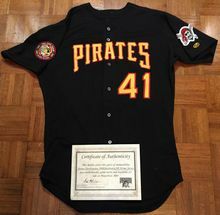 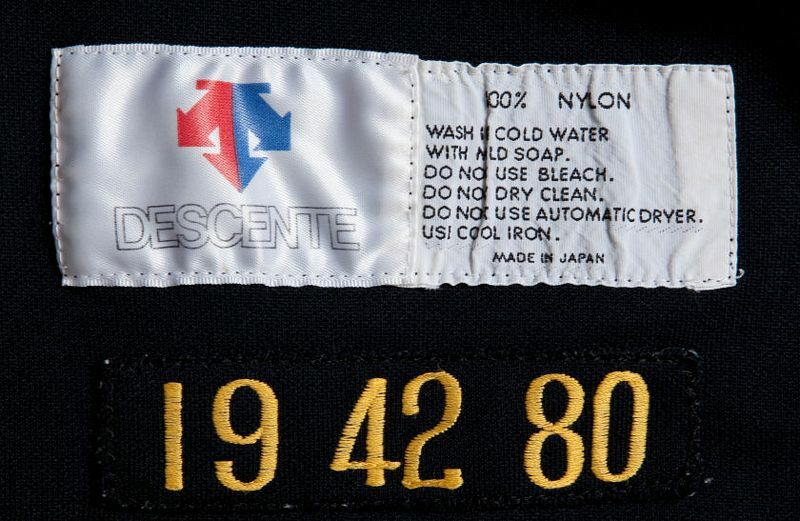 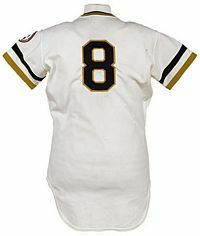 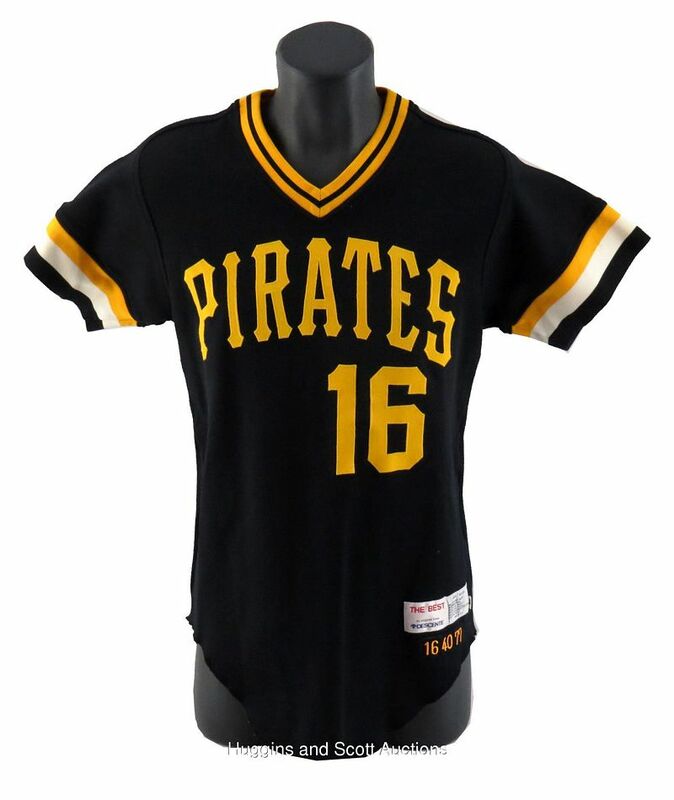 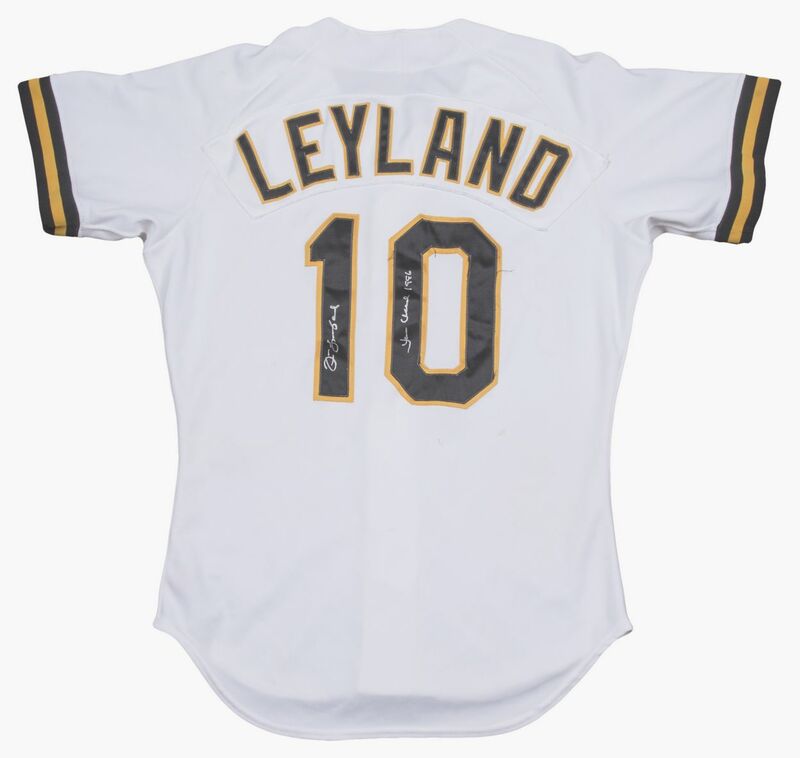 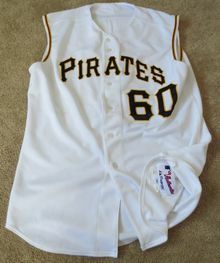 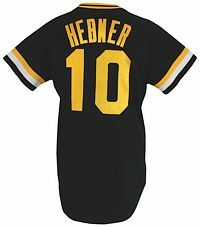 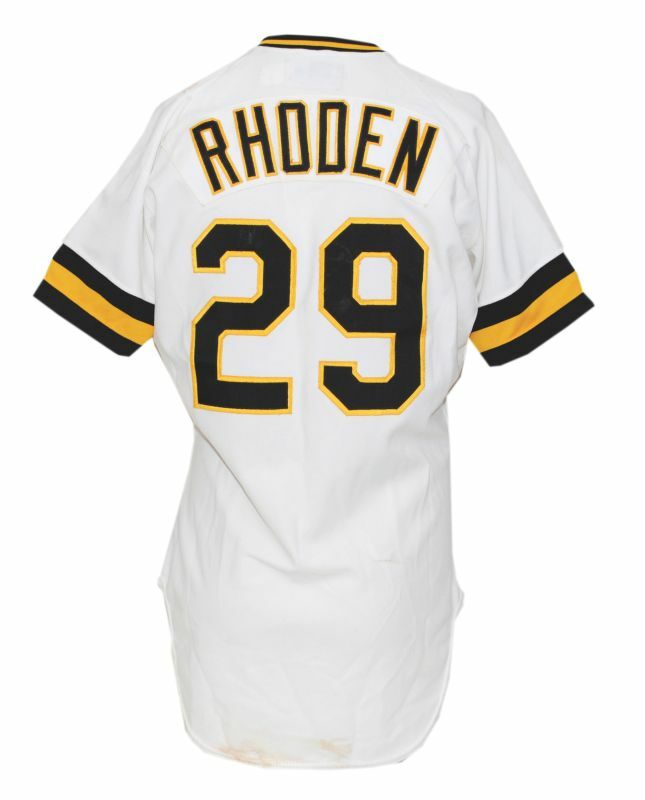 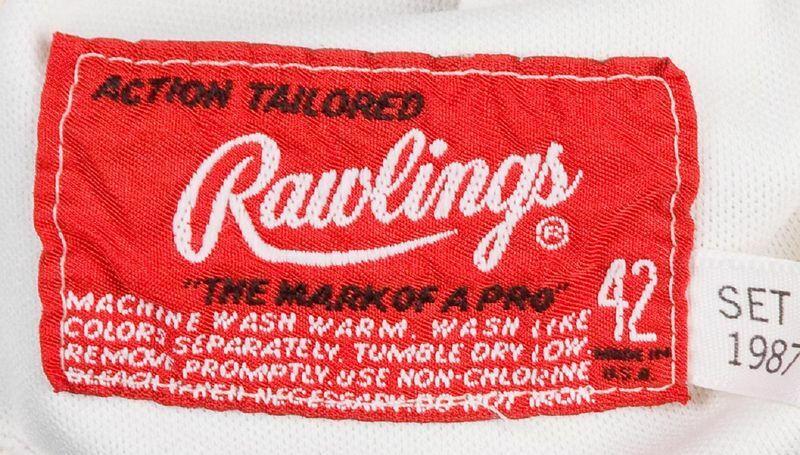 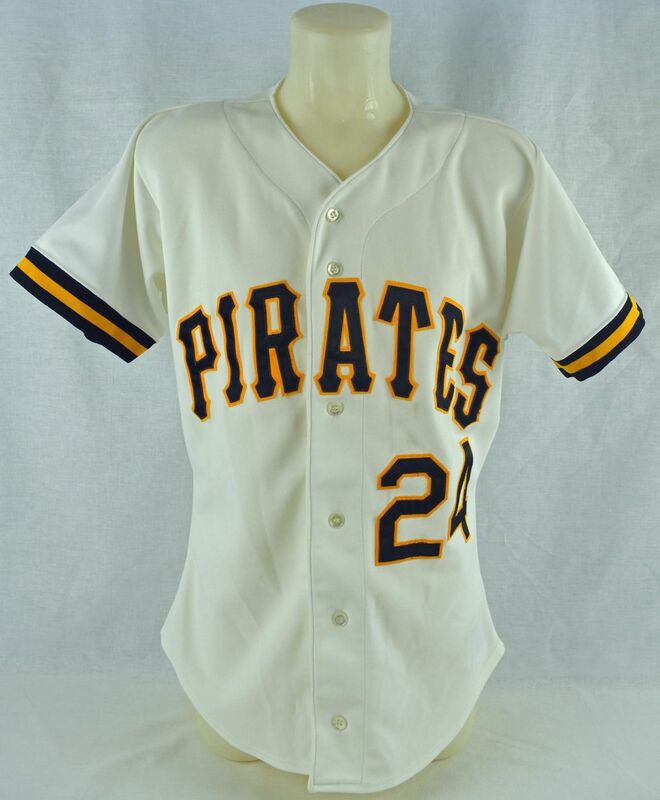 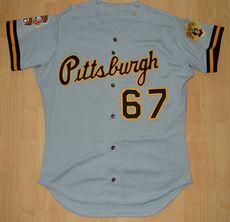 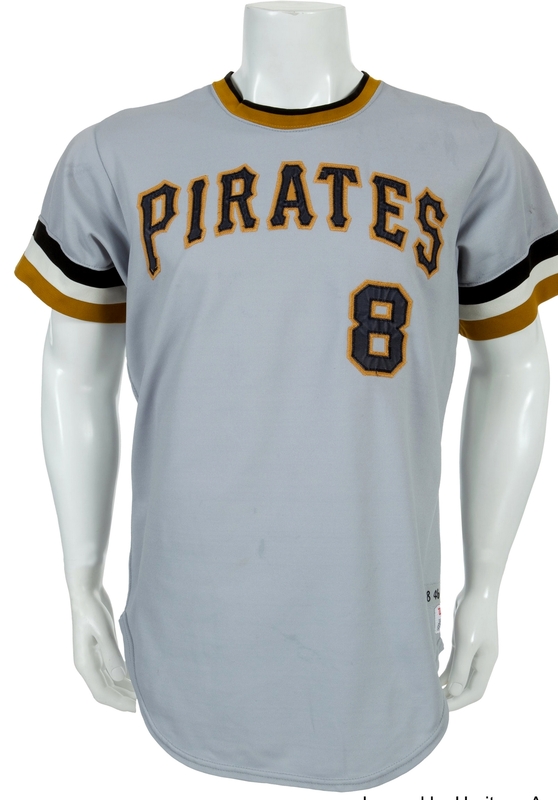 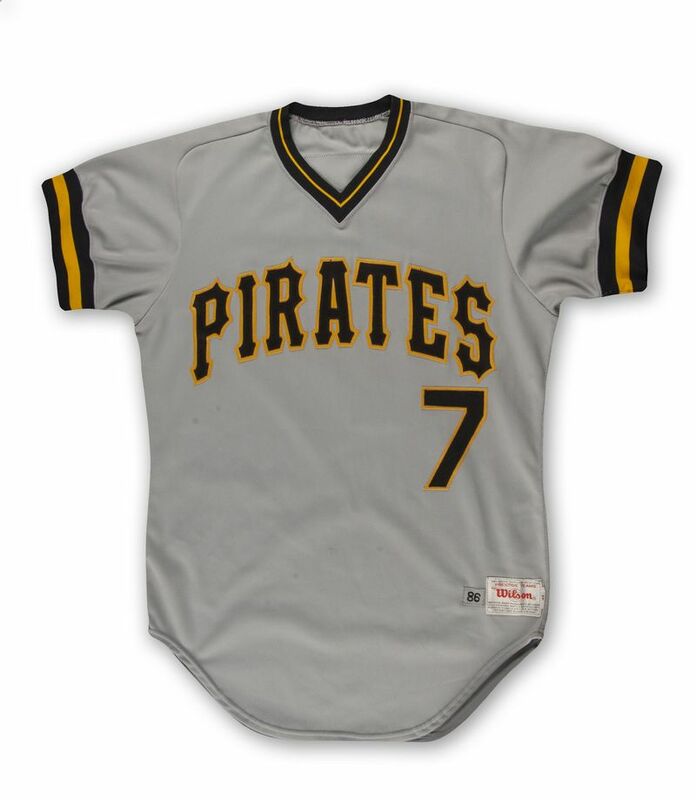 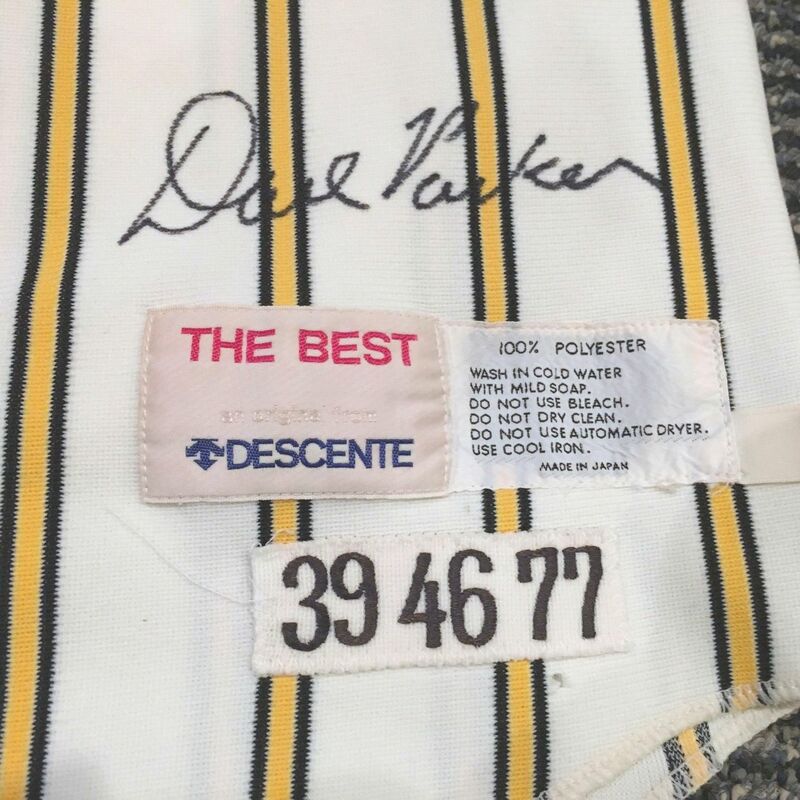 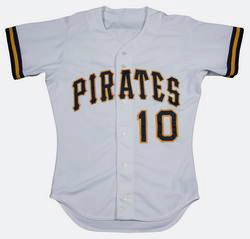 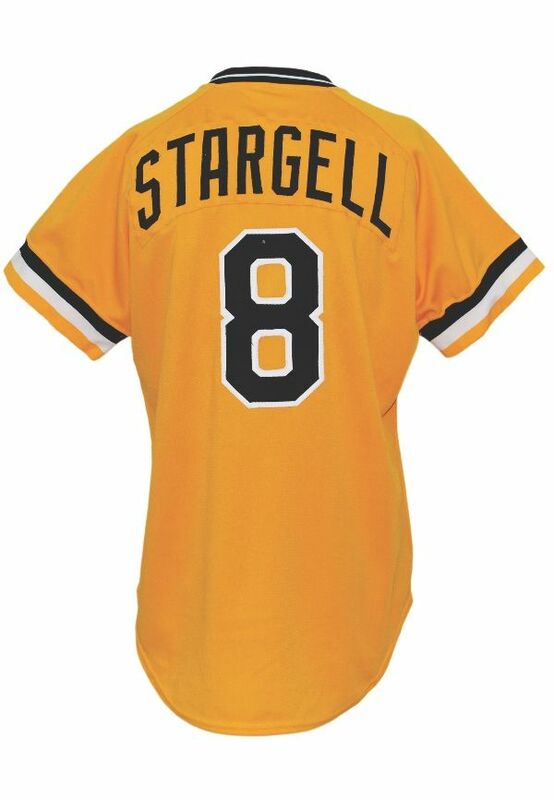 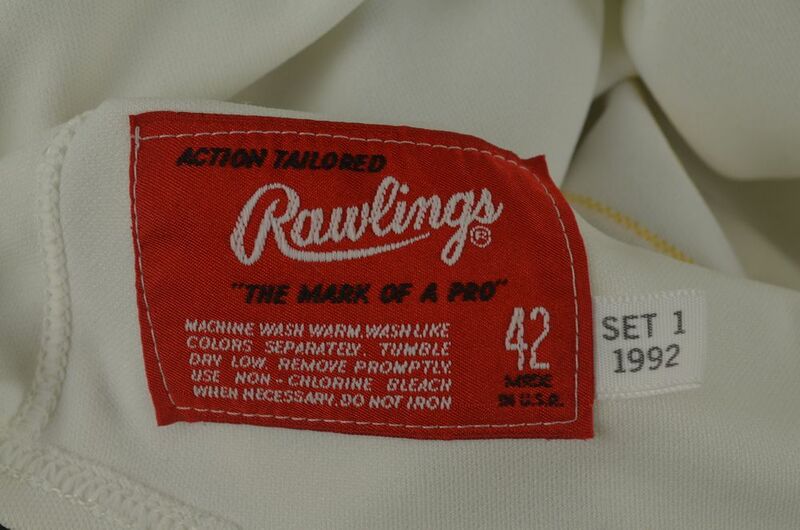 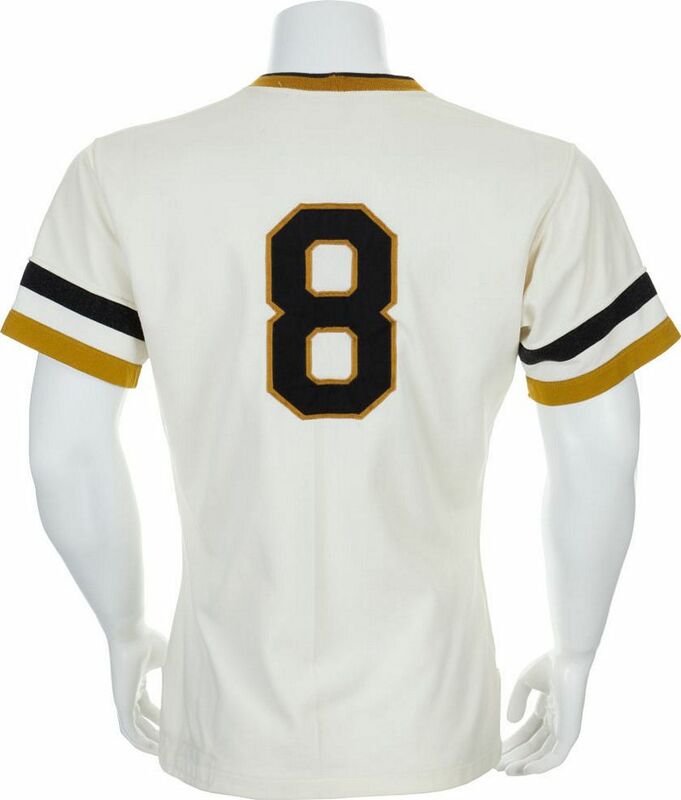 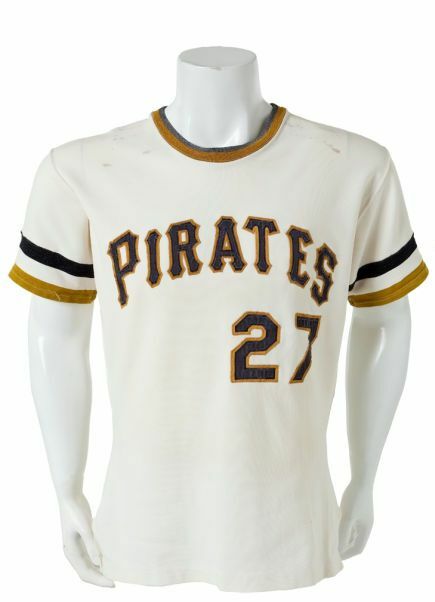 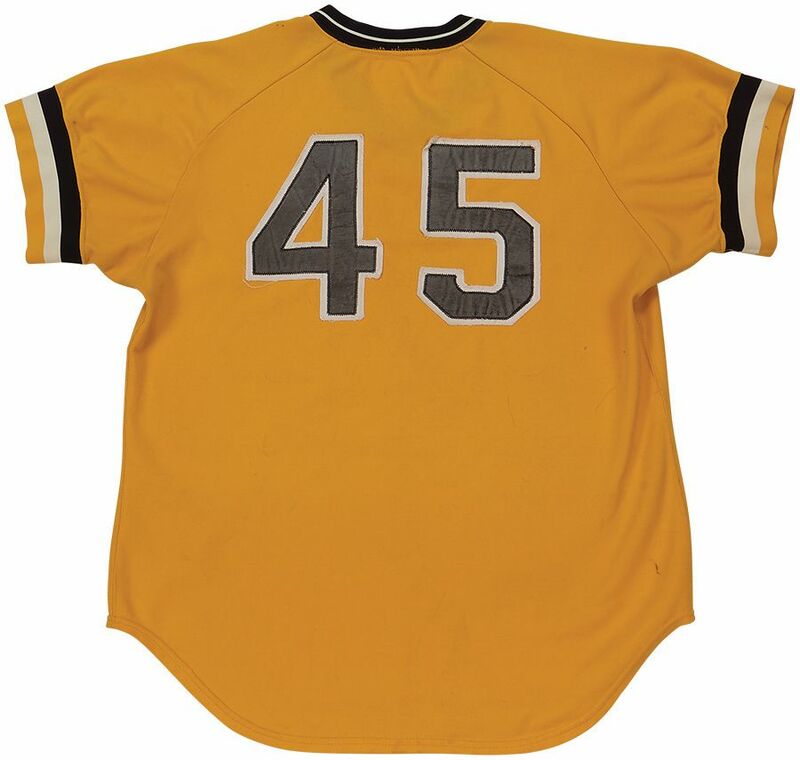 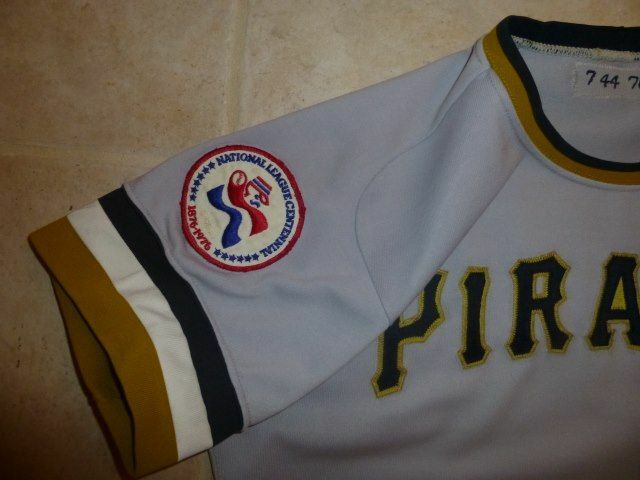 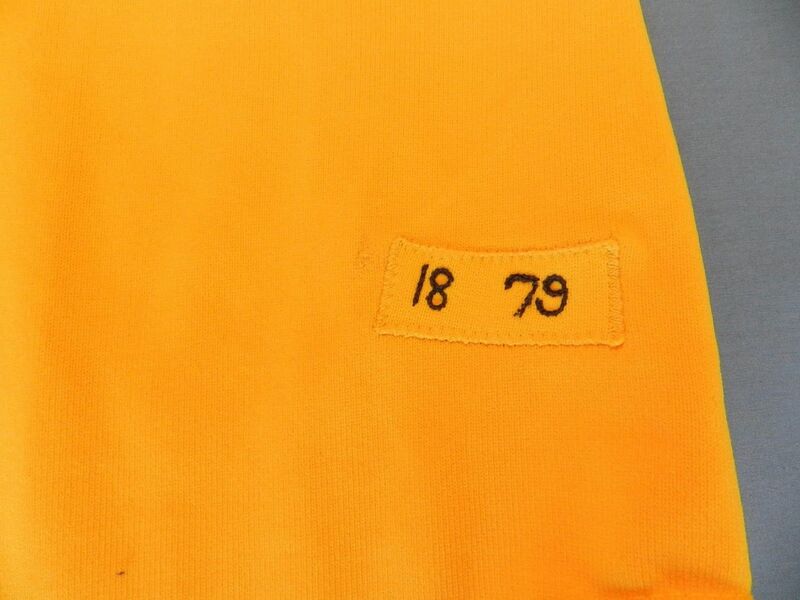 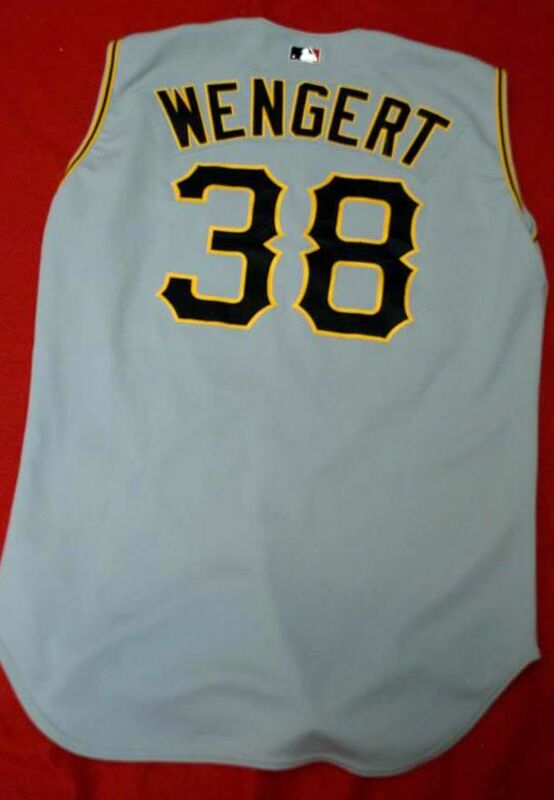 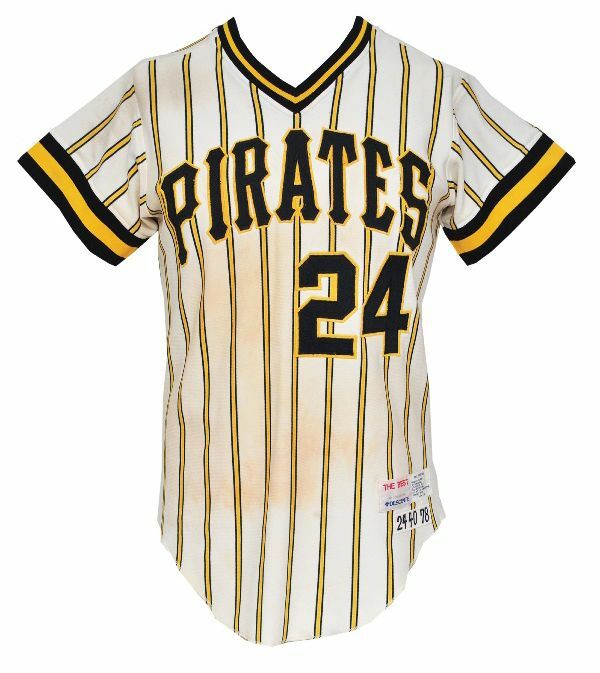 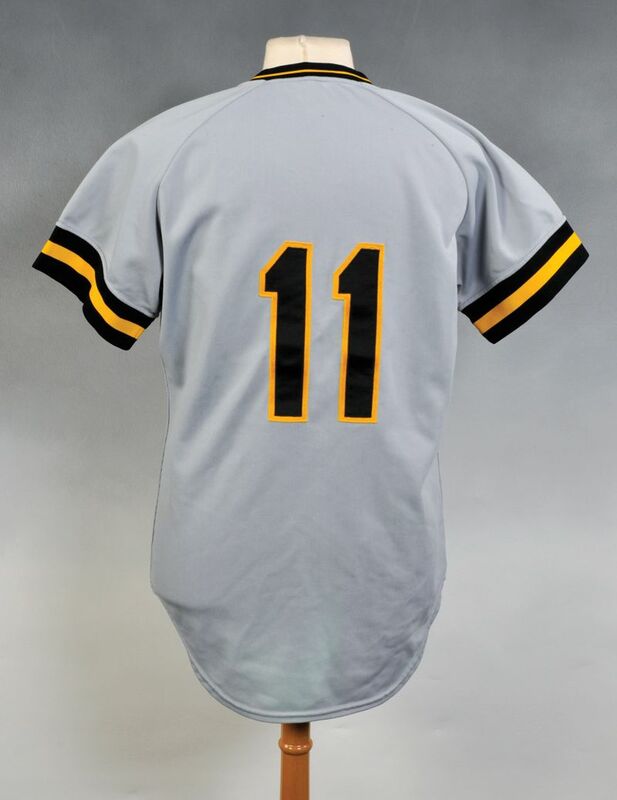 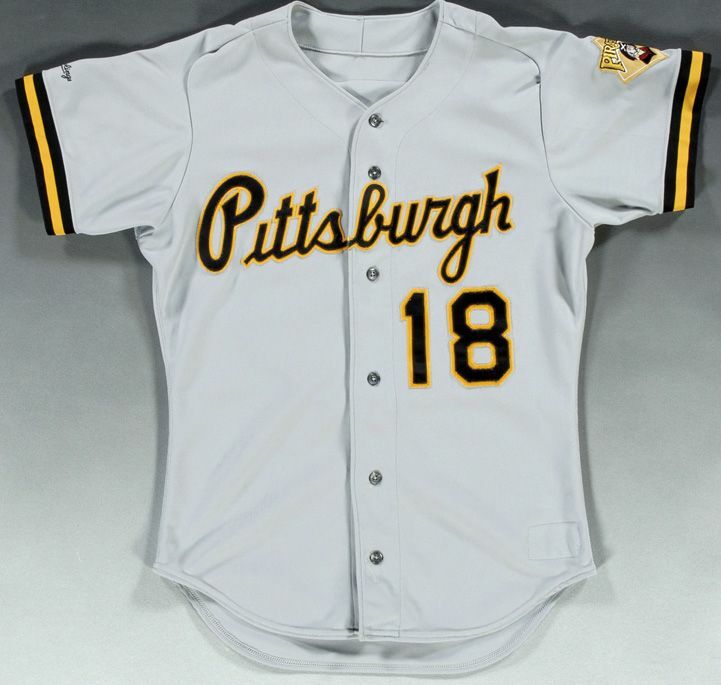 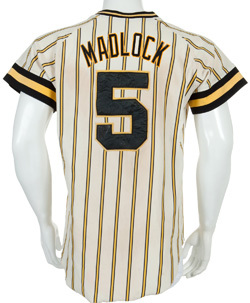 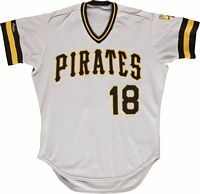 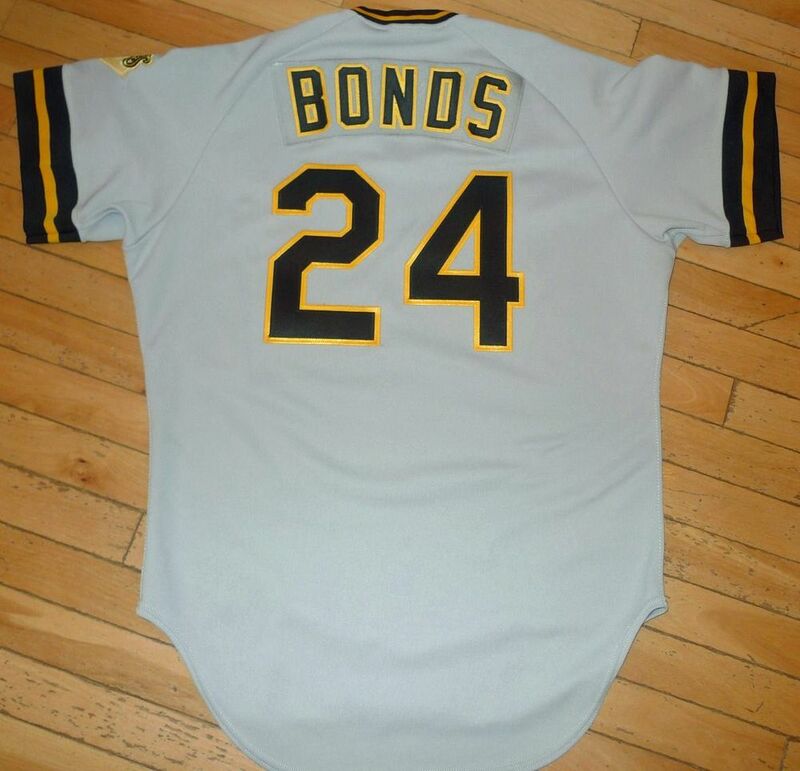 The Clemente patch was added to this 1972 jersey for reuse in 1973. 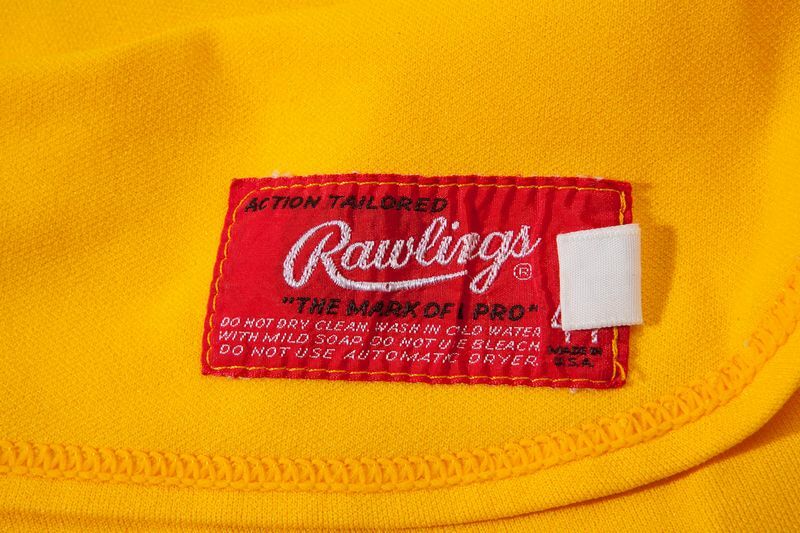 Shirts are no longer straight cut. 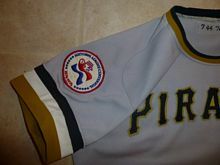 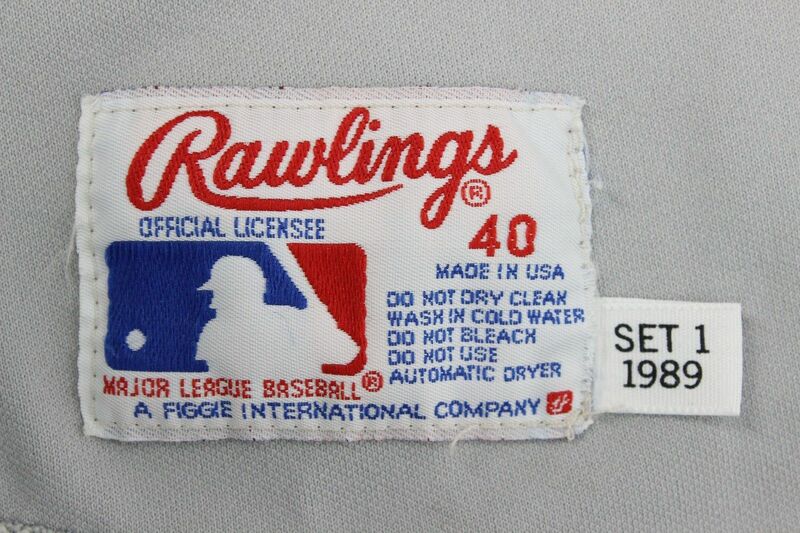 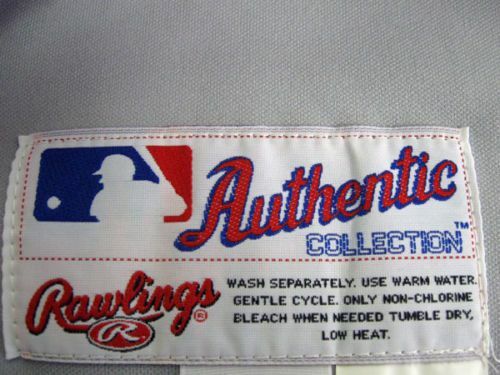 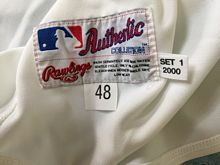 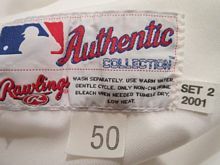 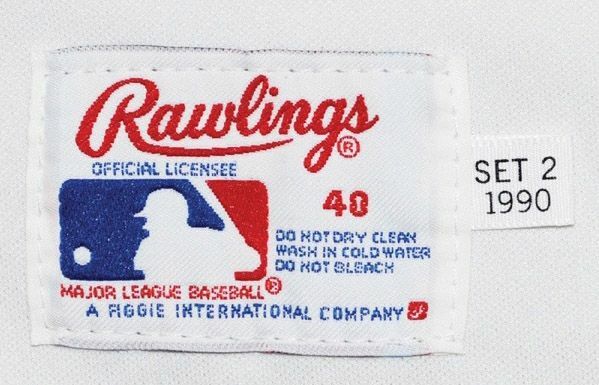 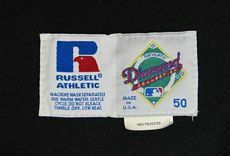 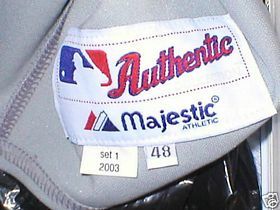 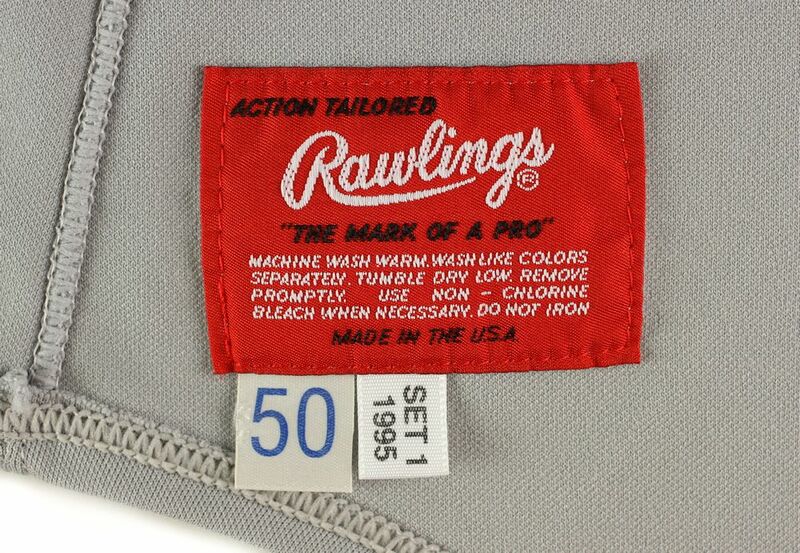 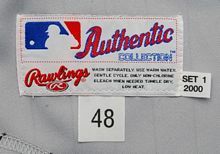 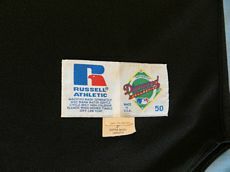 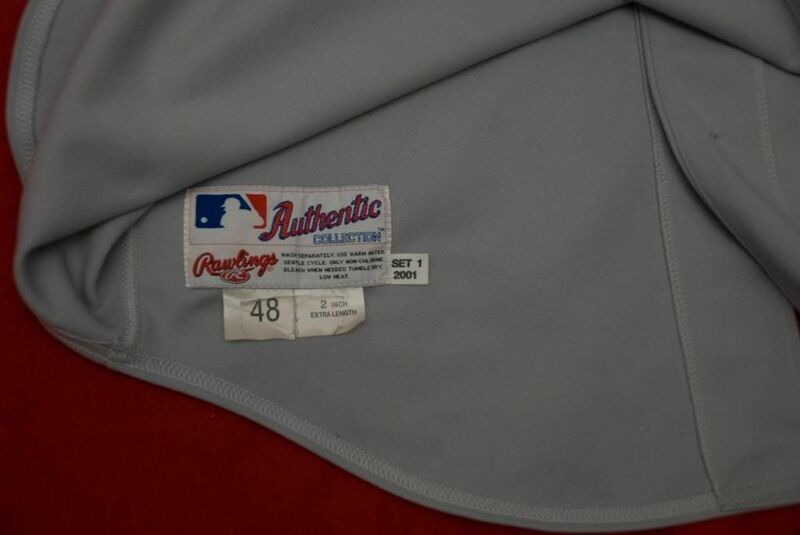 NL Centennial sleeve patch added in 1976. 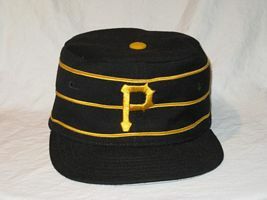 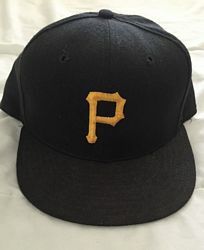 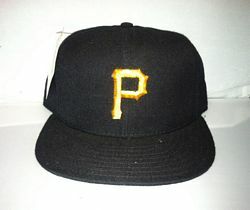 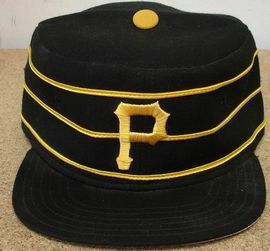 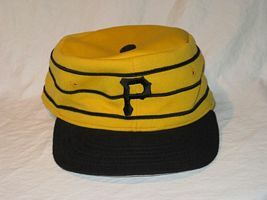 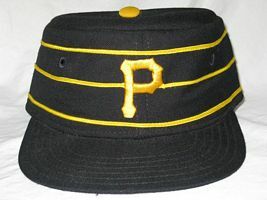 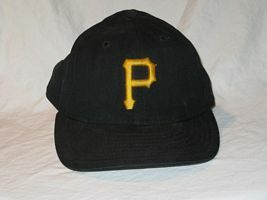 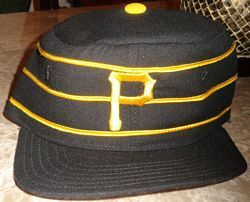 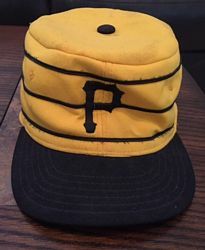 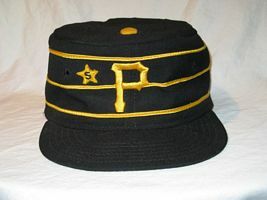 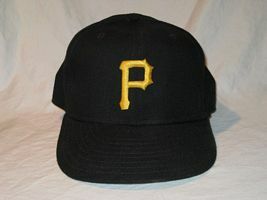 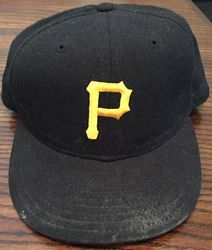 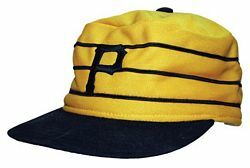 The Pirates, like a number of other clubs, use the pillbox cap to celebrate the NL's 100th year. 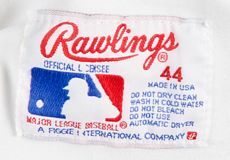 Except they use it every game. 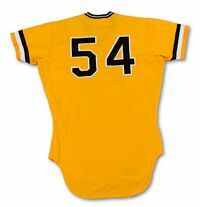 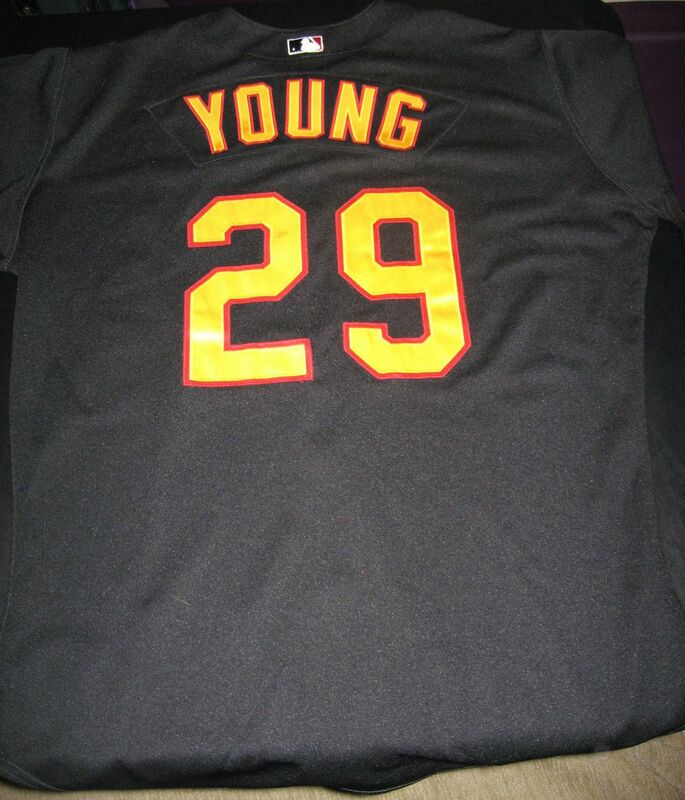 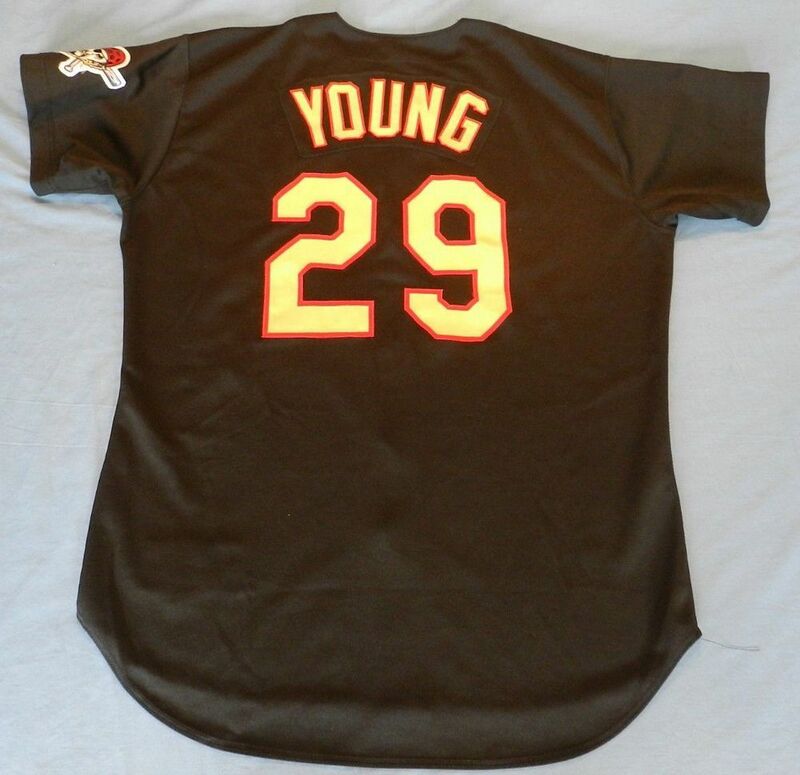 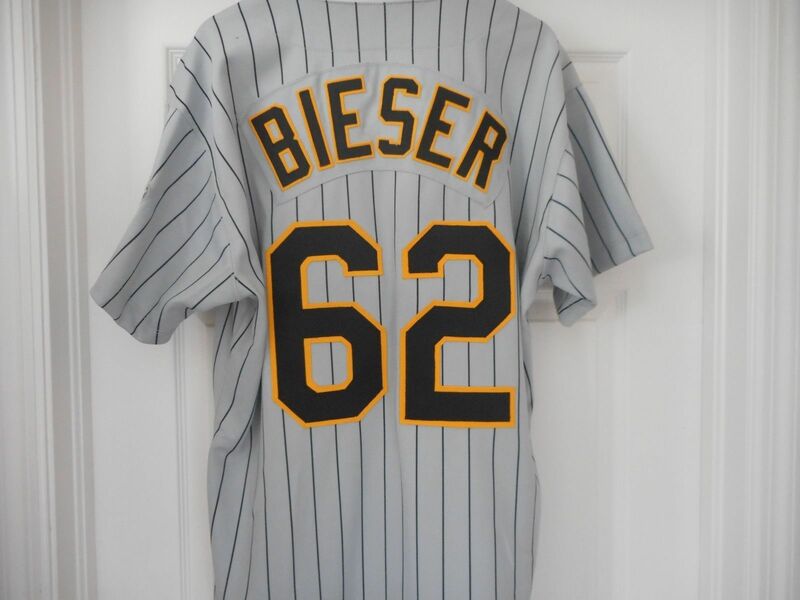 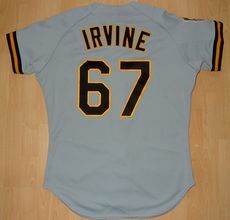 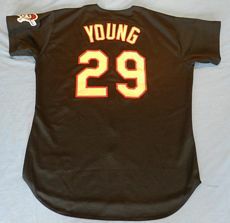 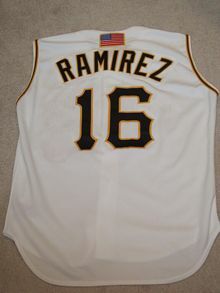 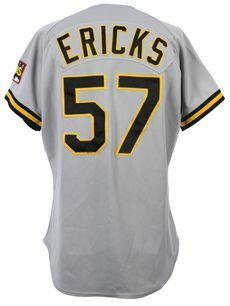 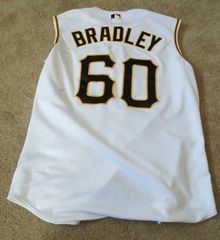 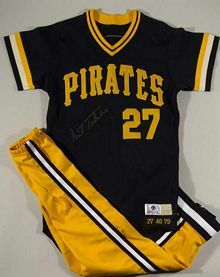 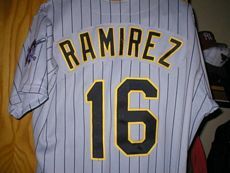 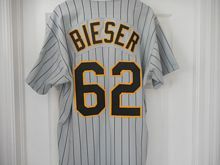 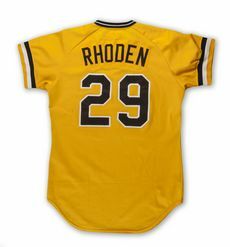 The team enters their “Bumblebee” period where a dizzying array of jersey, pant, and cap styles allows for seven possible uniform combinations which the club varies on a nightly basis. 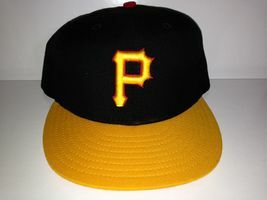 The gold cap changes to yellow and a black one debuts. 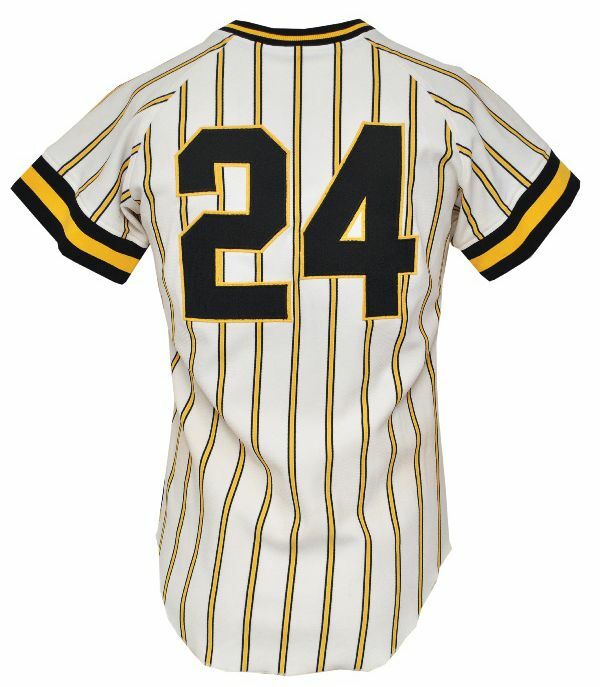 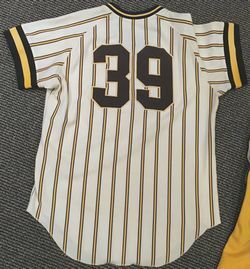 Any combination of gold, black, and striped white are used both home and on the road. 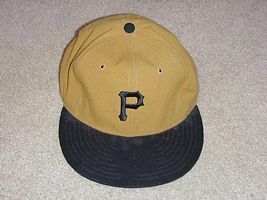 With maybe one exception the cap never matched a black or gold jersey. 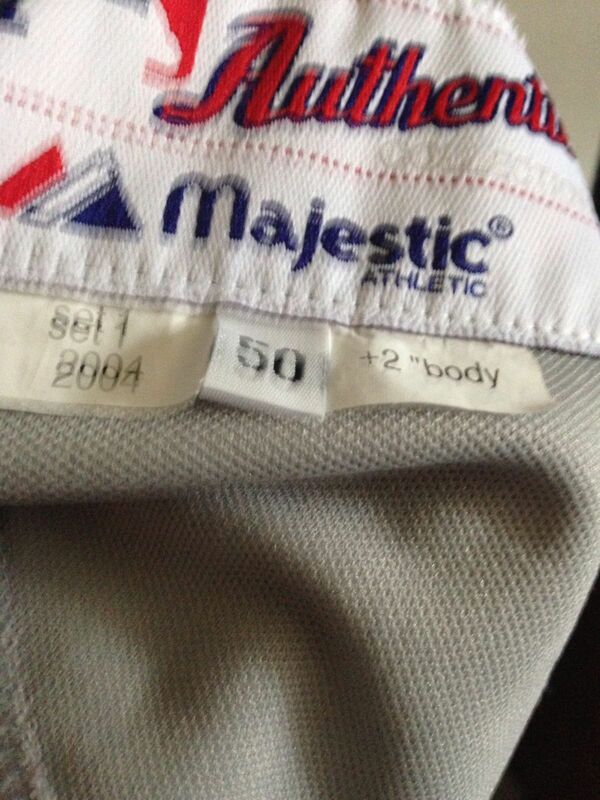 Either color cap was worn with the white jersey or pants. 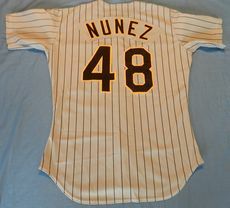 NOB added. 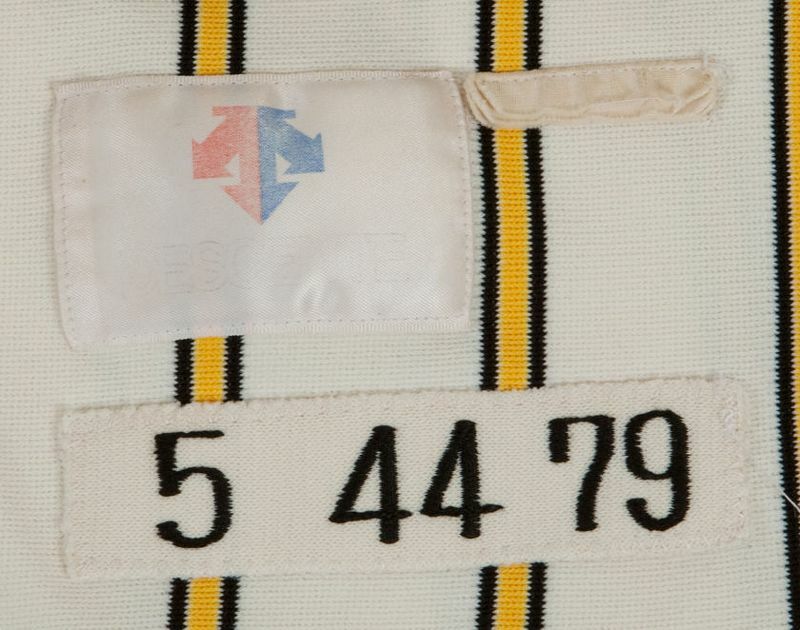 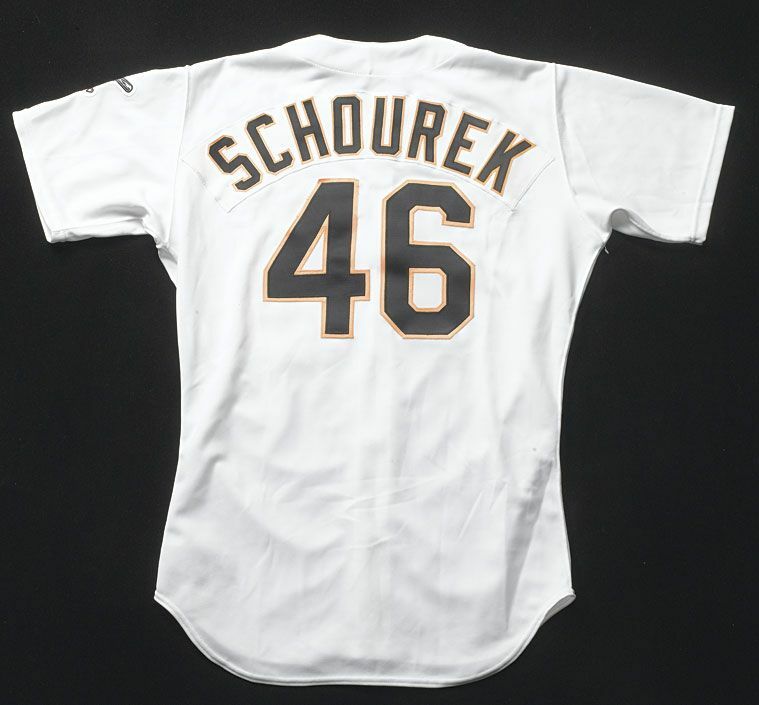 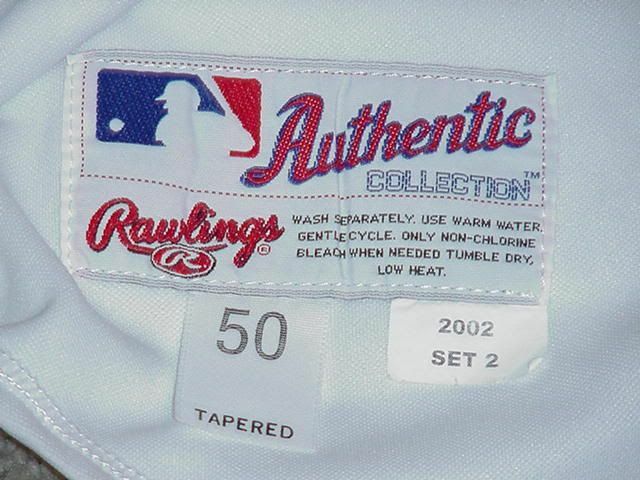 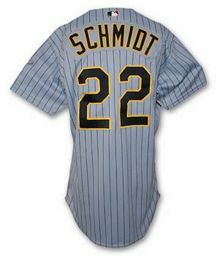 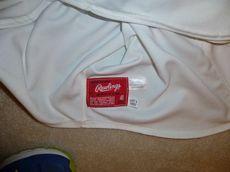 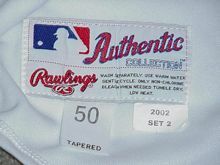 The striped white jersey and pants are only worn with each other, and only at home. 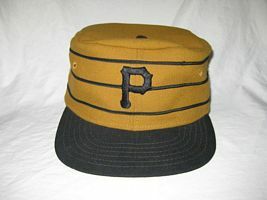 Except for one game only black caps are worn with stripes. 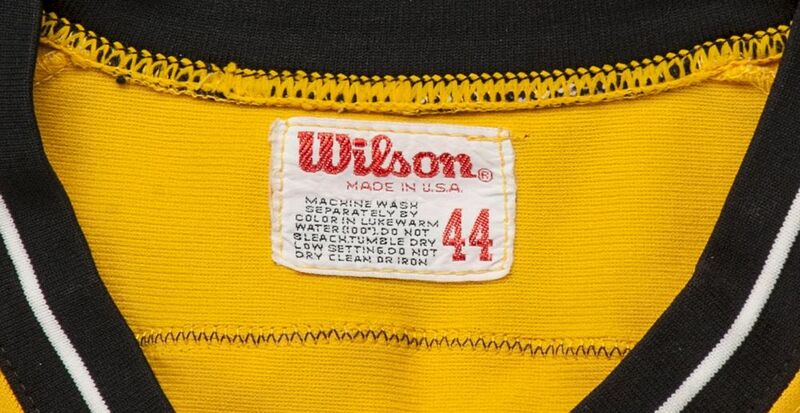 Black and gold are still mixed and matched, both at home and on the road. 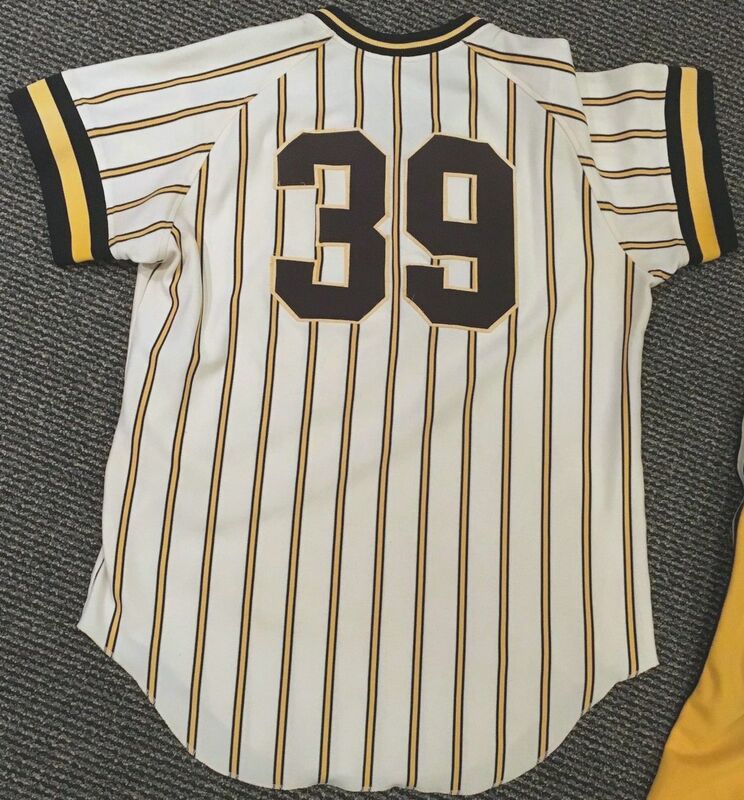 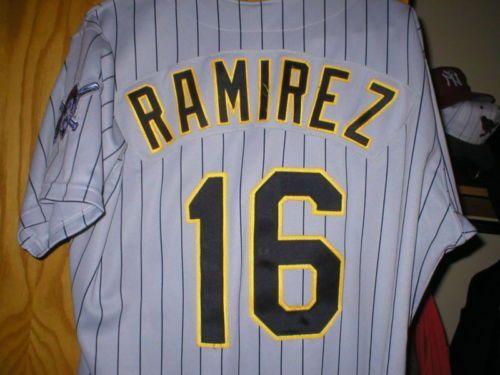 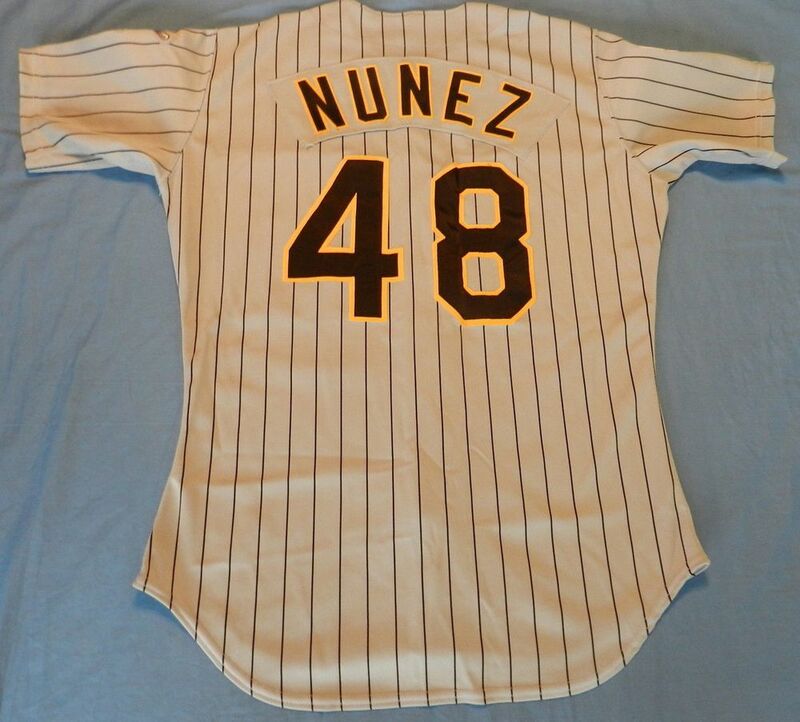 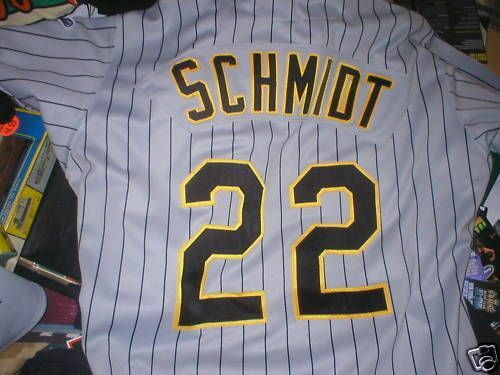 Pinstripe home jersey is replaced by solid white. With the exception of one game in 1980, white is worn at home with black caps. Black and gold are mixed & matched on the road. 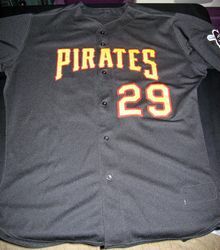 2 different jerseys to show NOB. 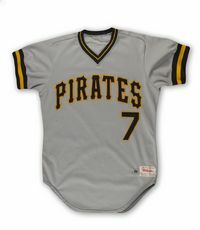 Black and gold jerseys are dropped in favor of a grey road jersey. 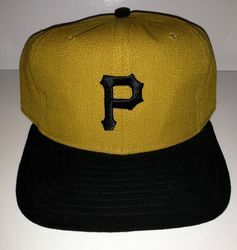 Gold cap dropped. 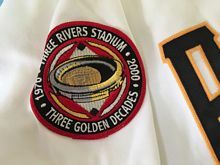 Team centennial patch added. 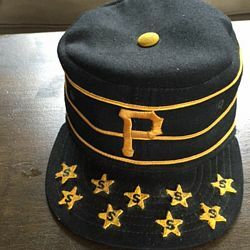 Cap returns to normal. 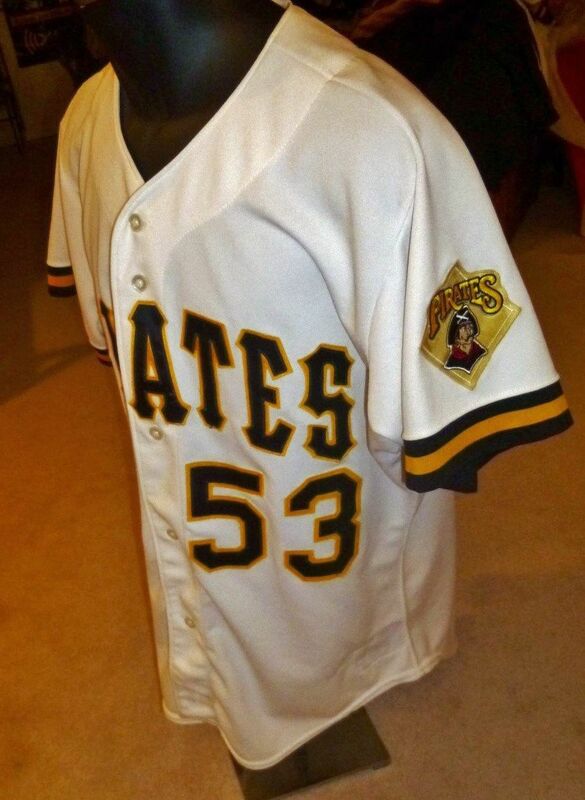 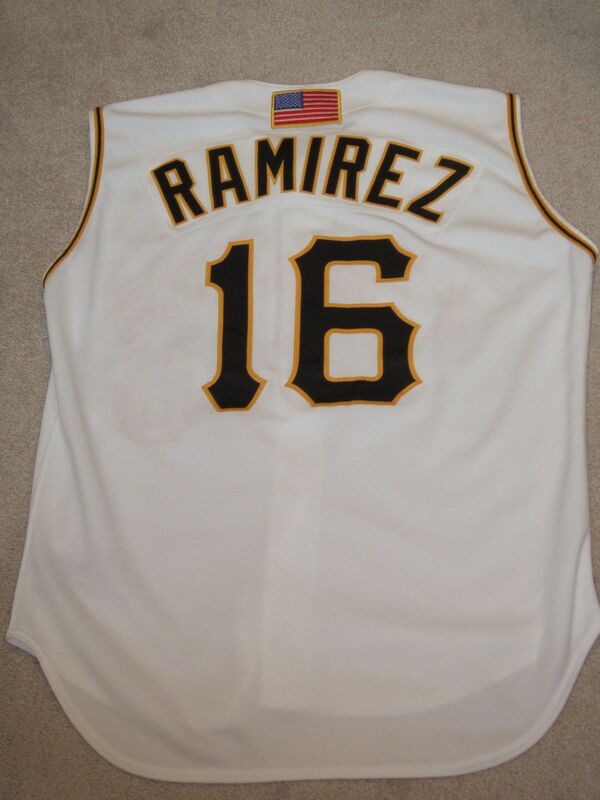 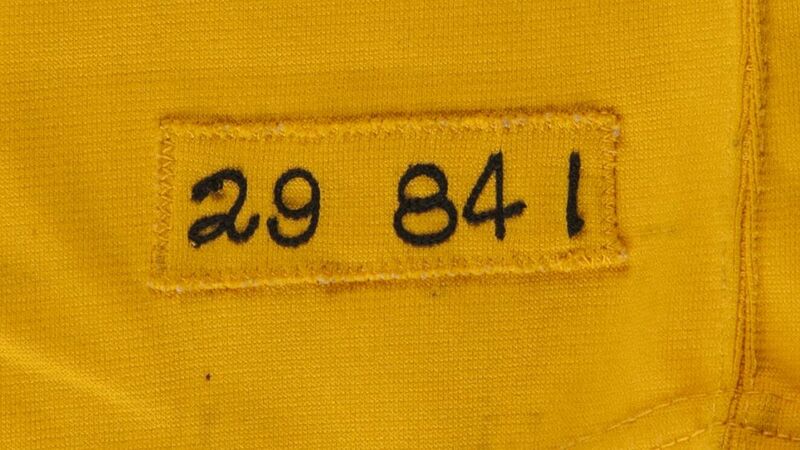 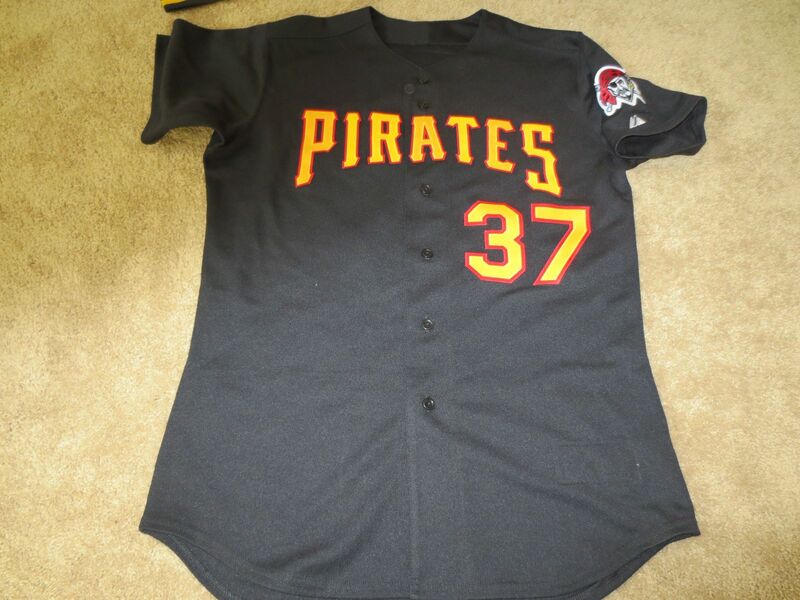 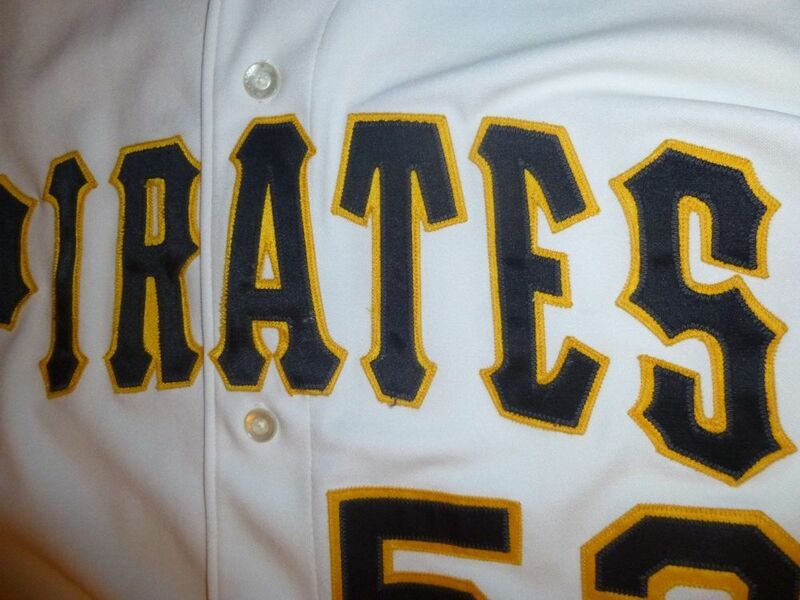 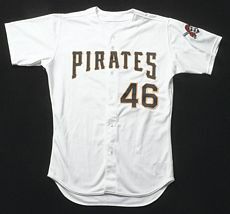 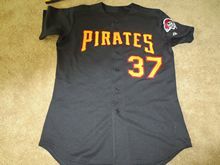 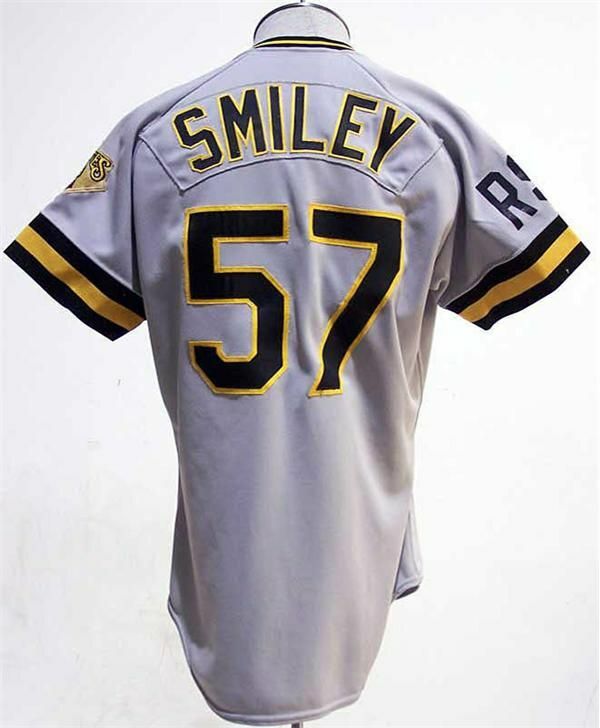 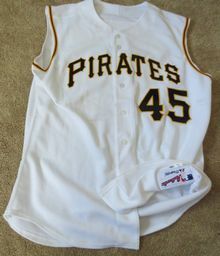 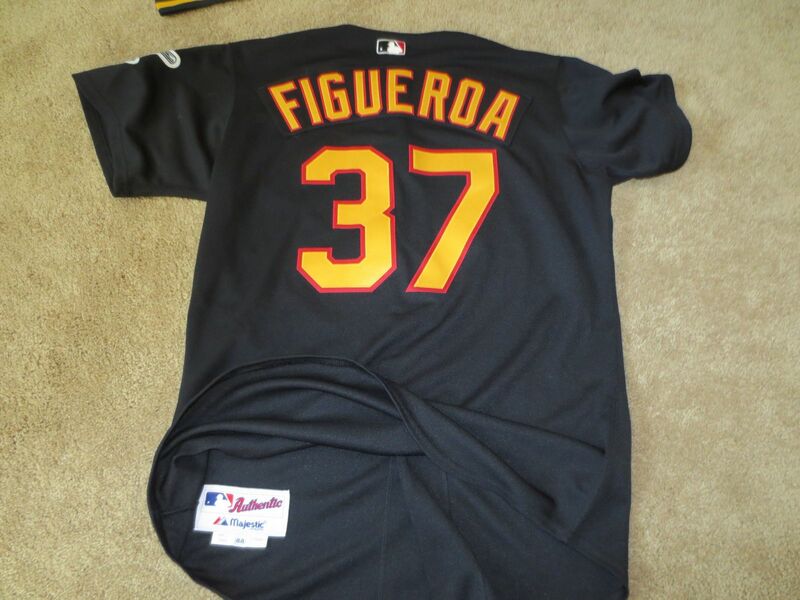 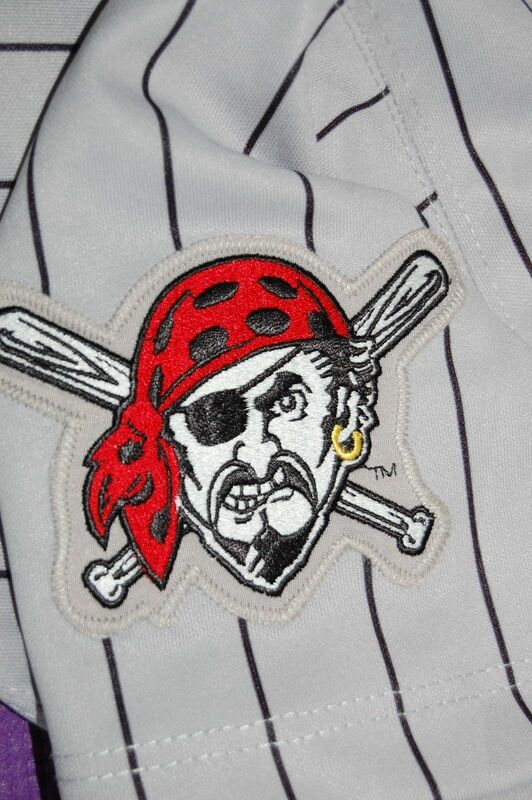 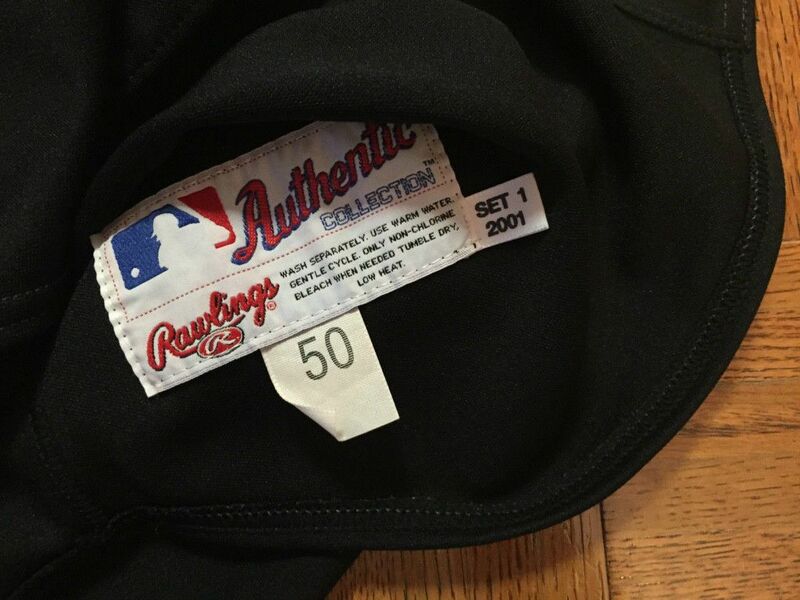 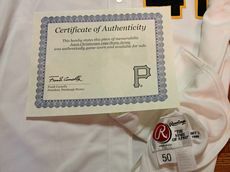 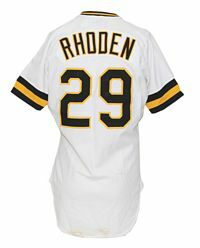 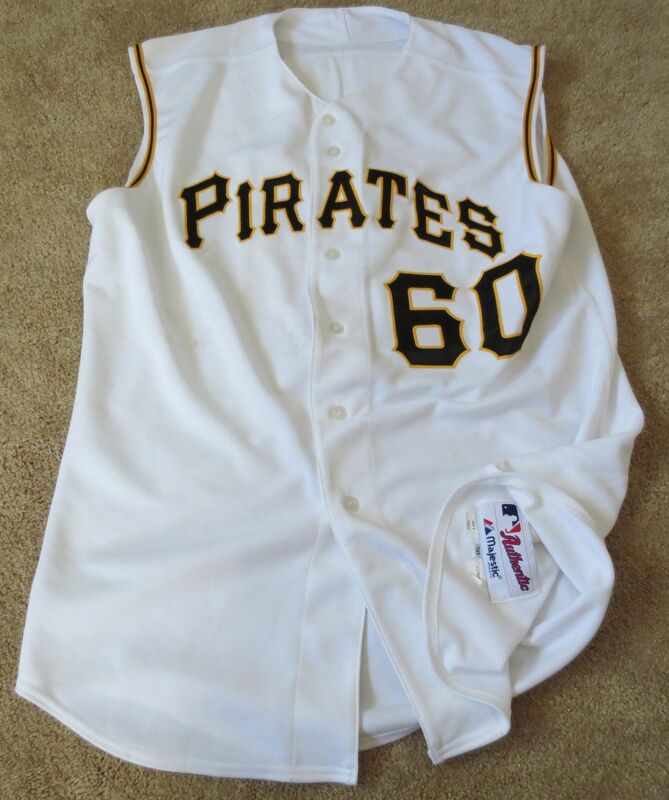 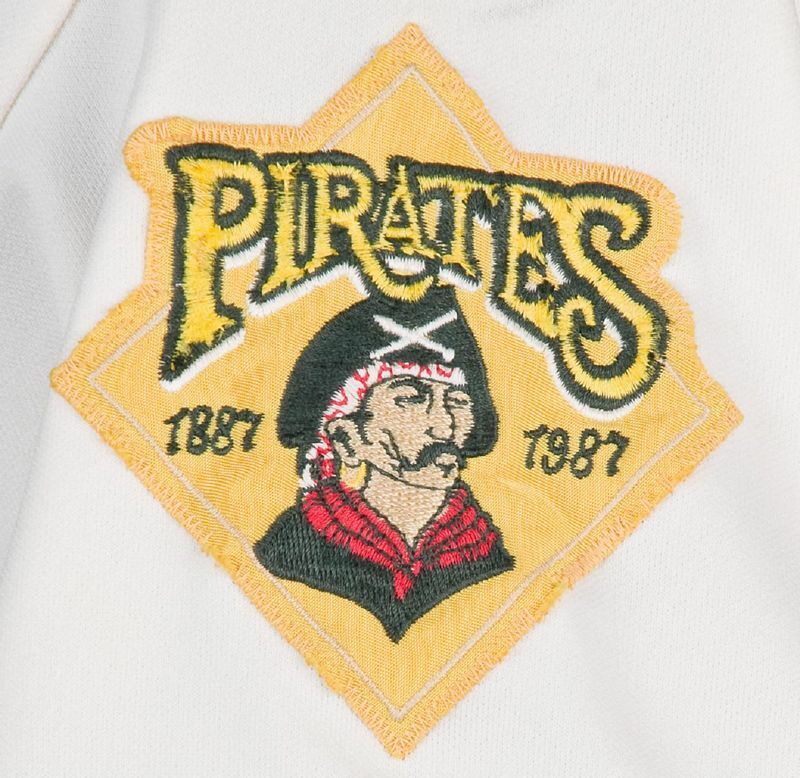 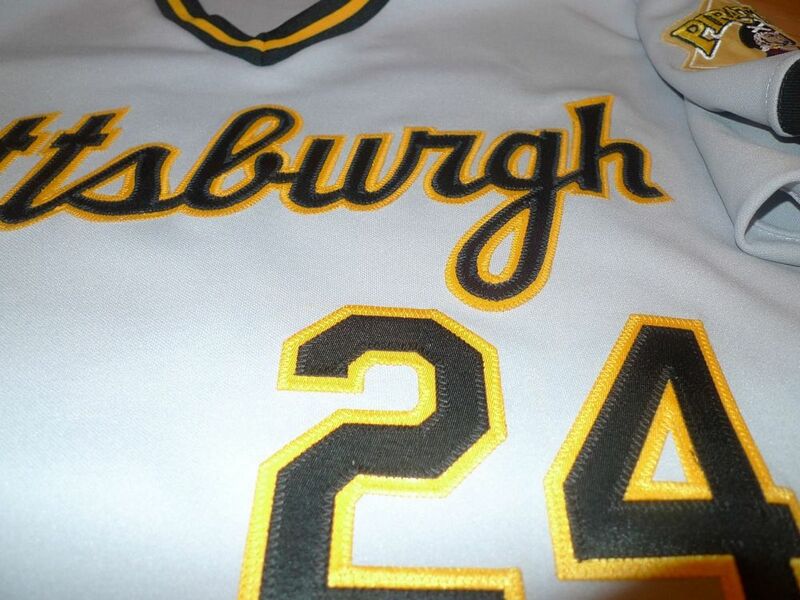 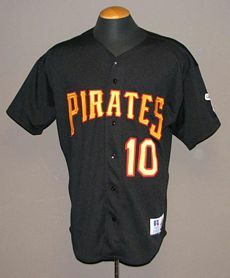 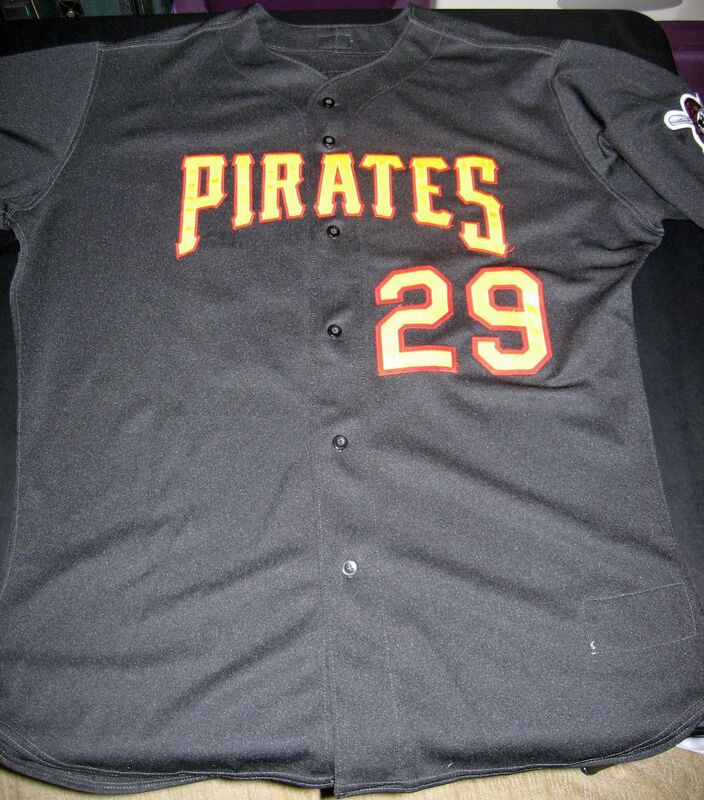 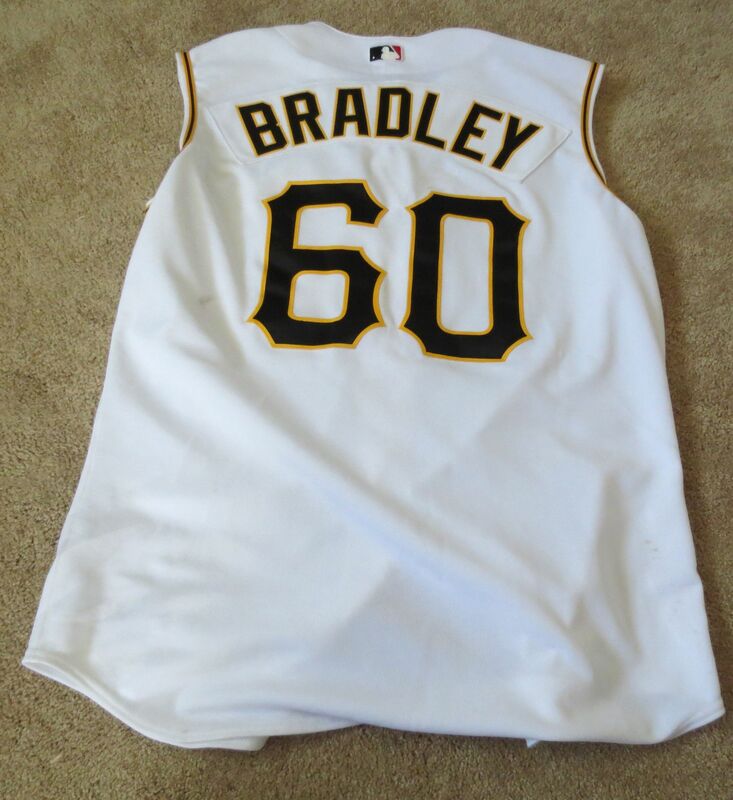 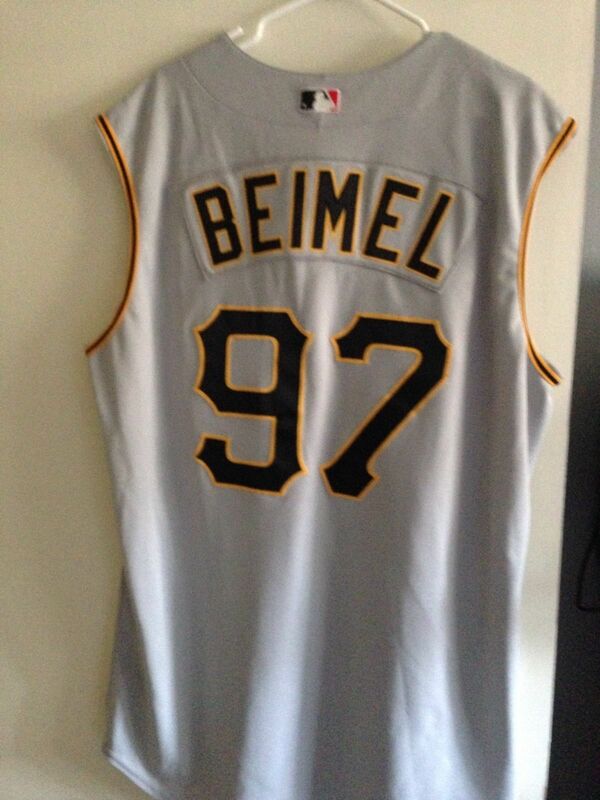 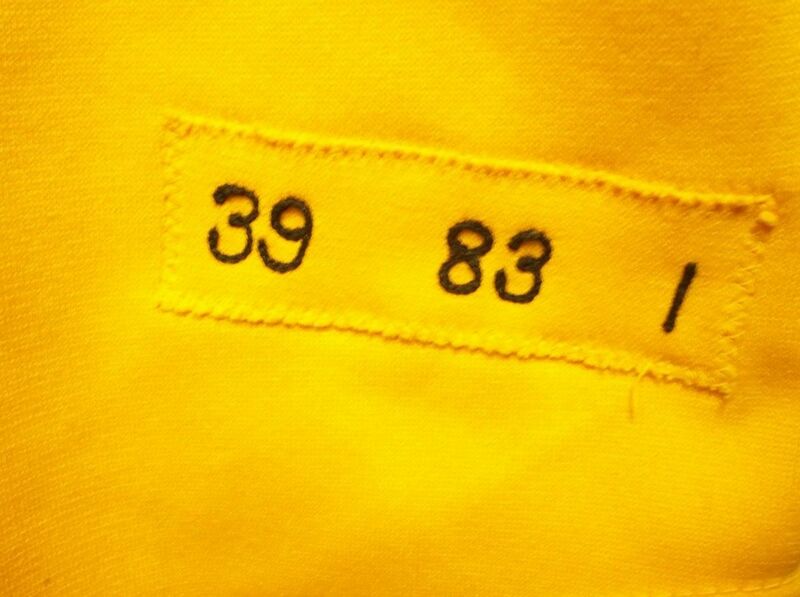 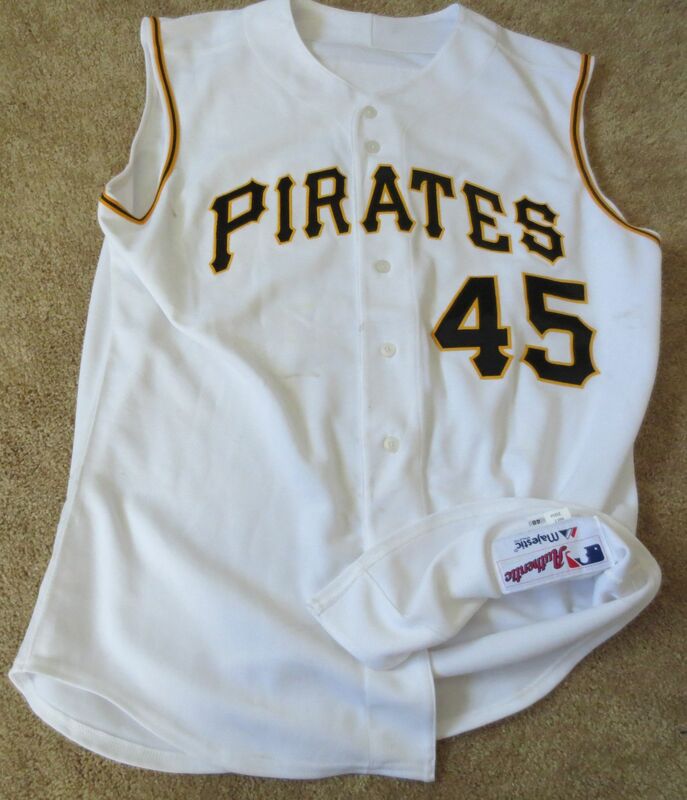 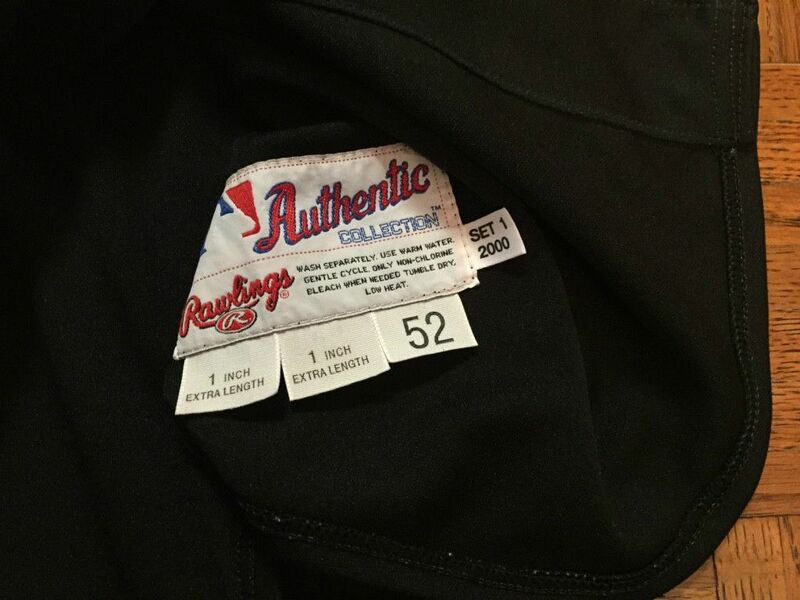 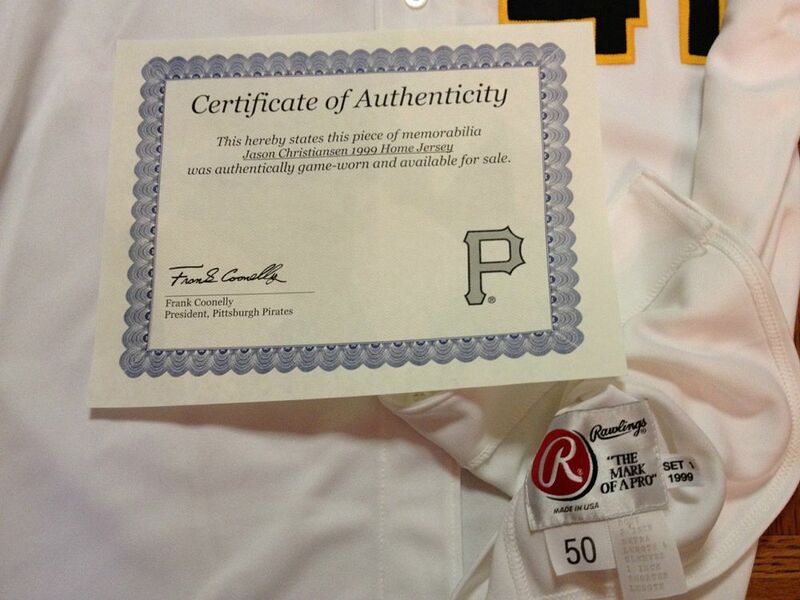 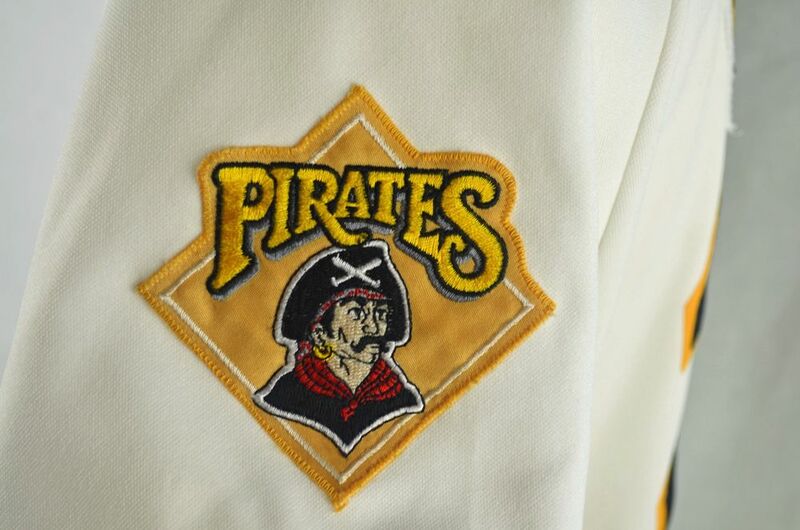 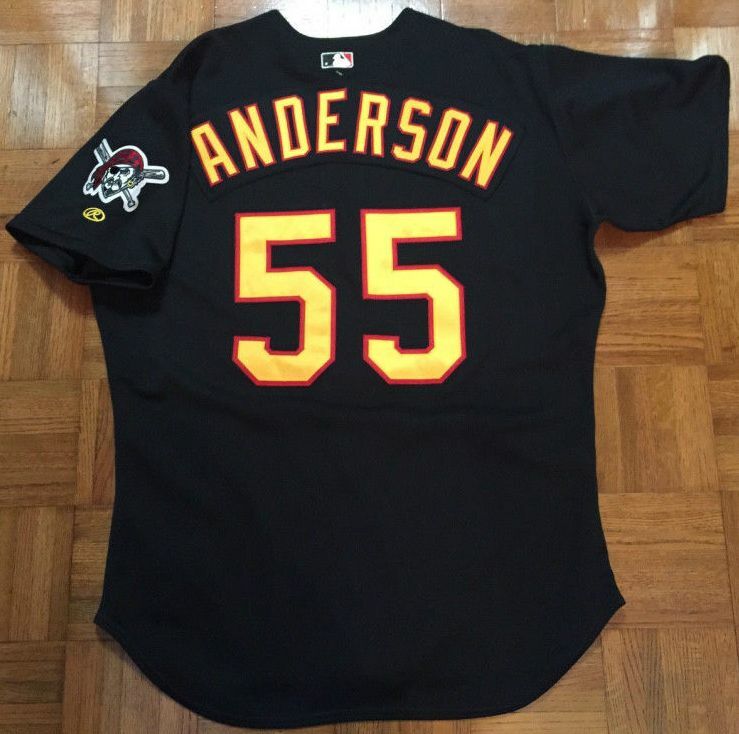 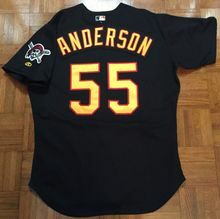 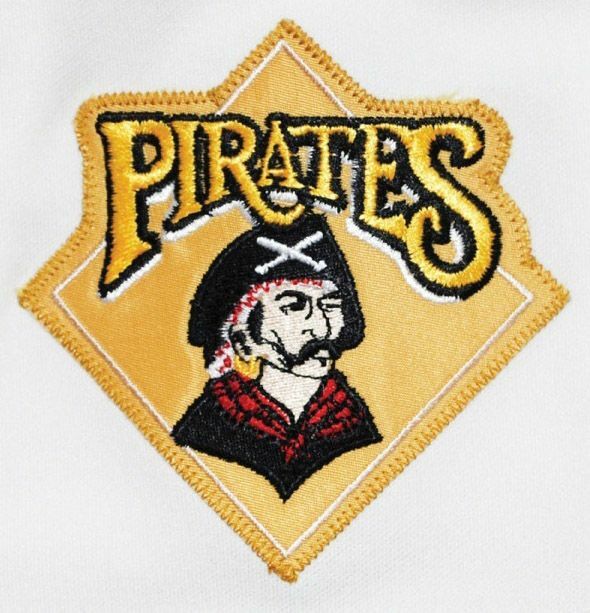 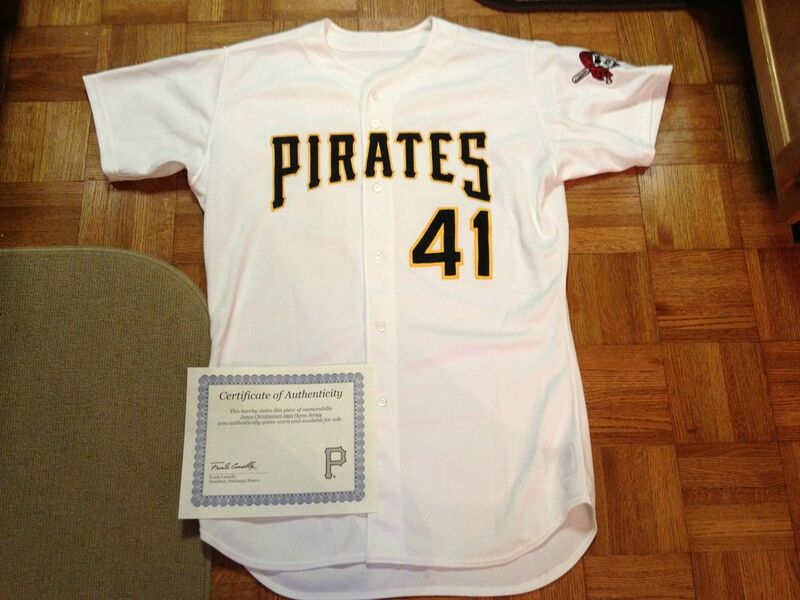 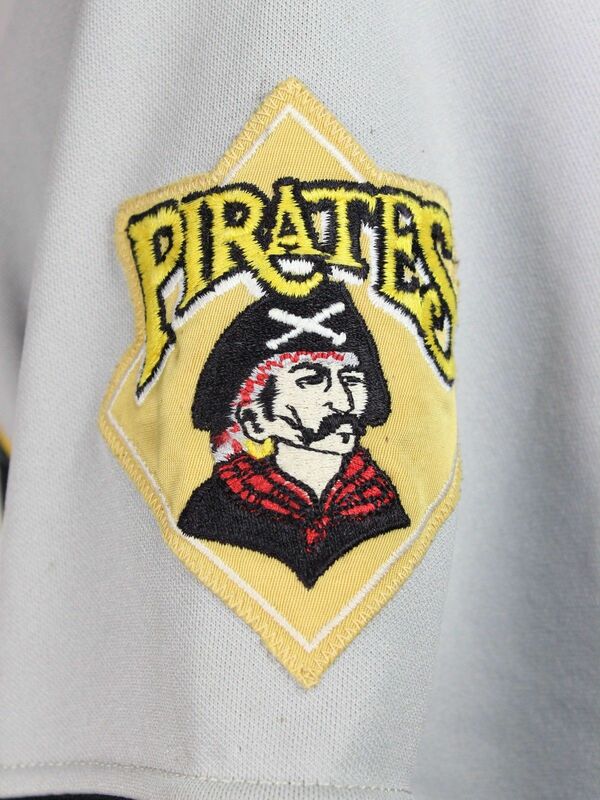 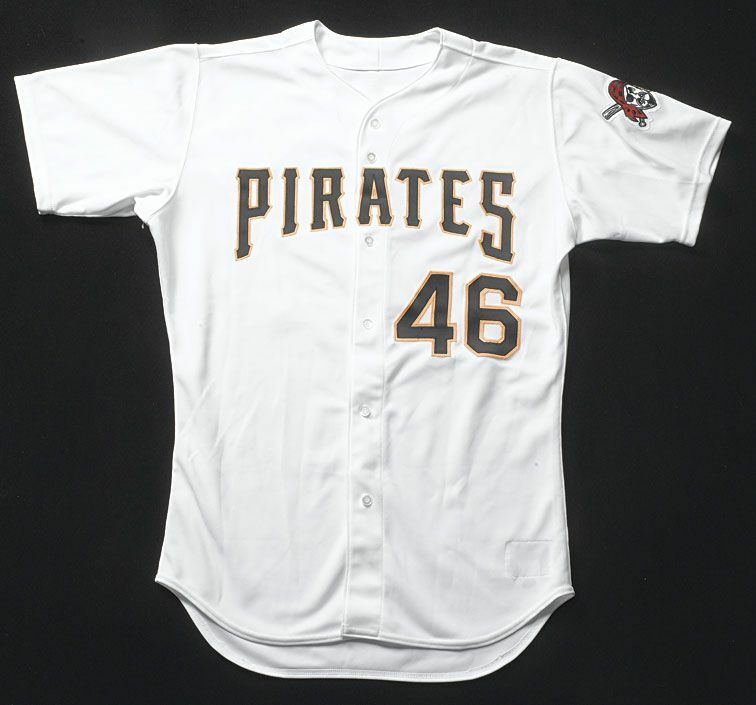 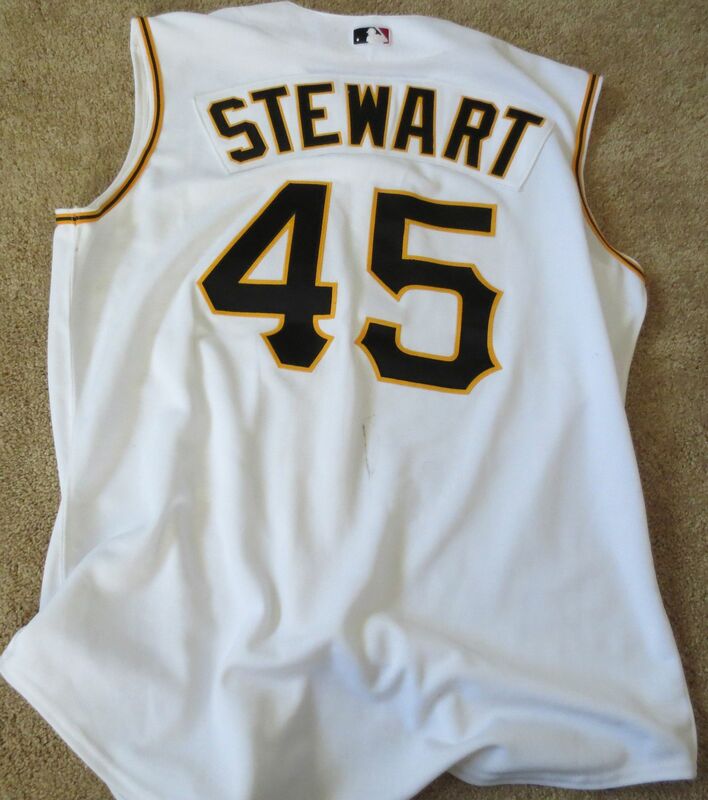 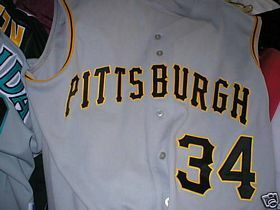 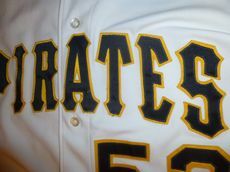 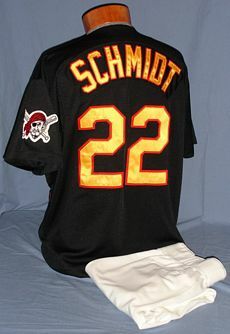 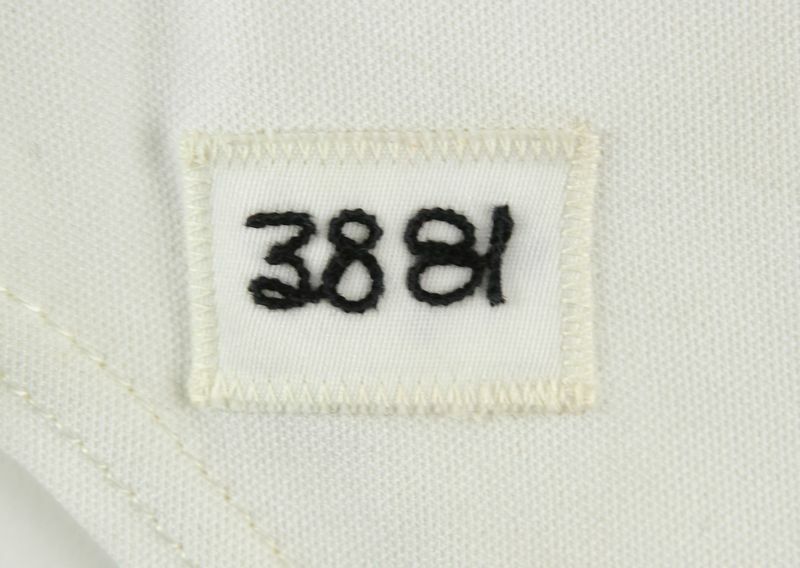 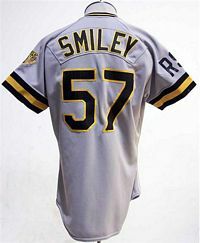 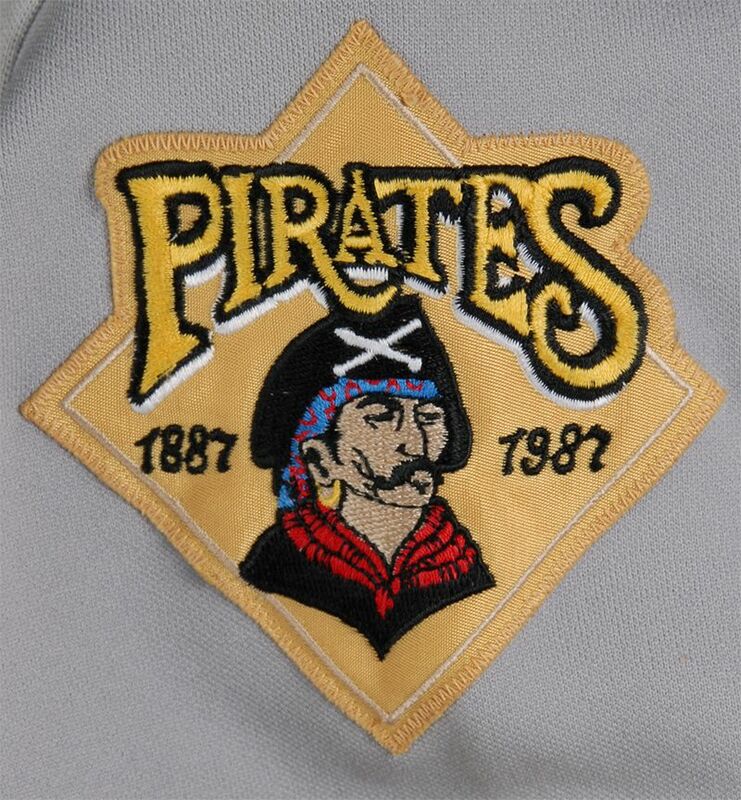 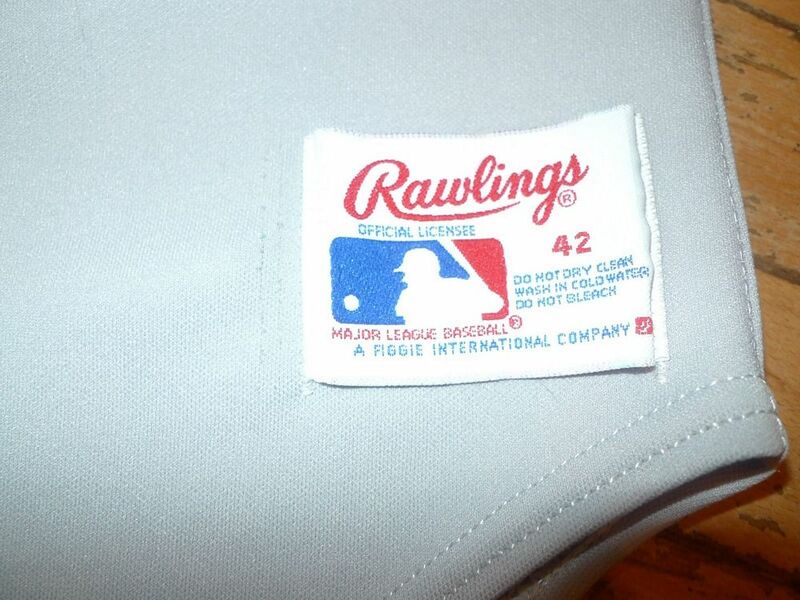 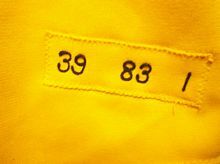 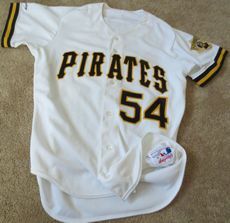 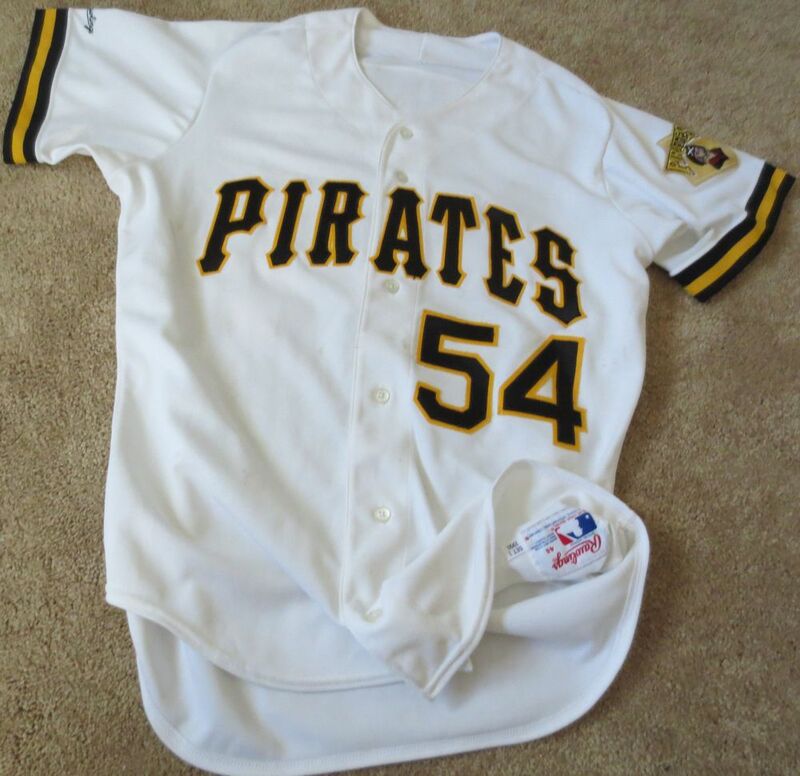 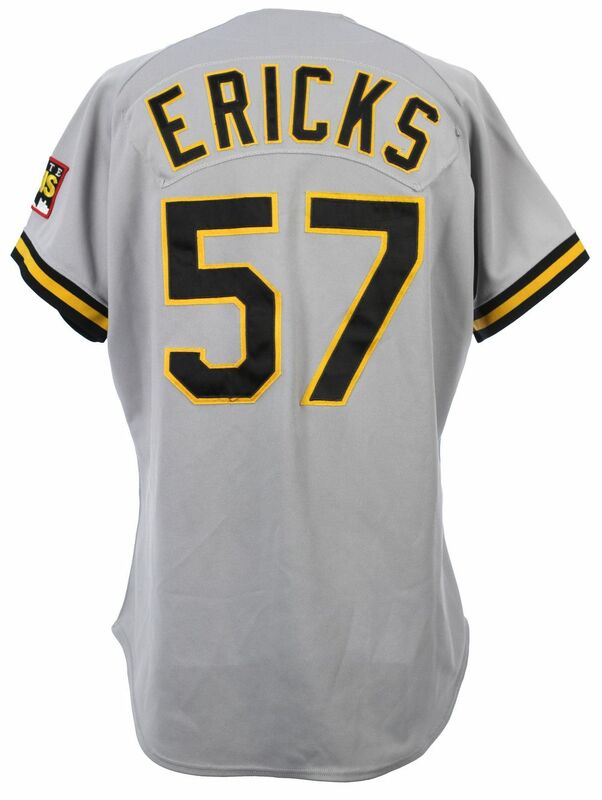 Pirates keep the sleeve patch, modifying it slightly by dropping the dates. 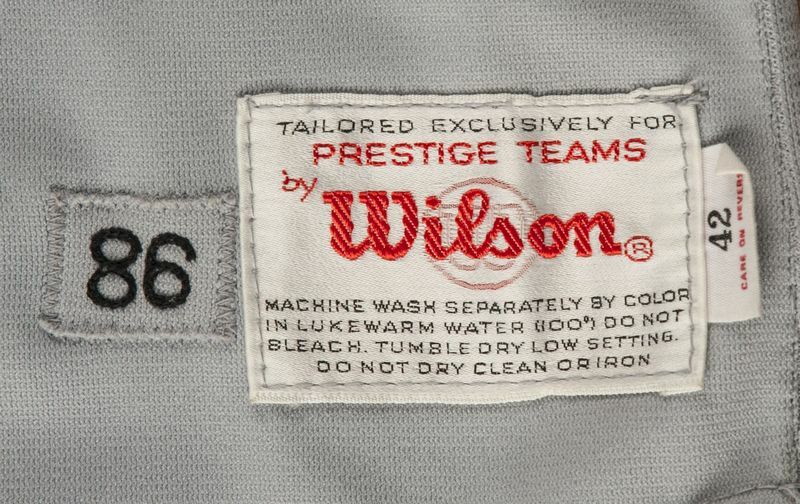 Home jersey becomes button-down. 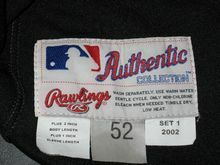 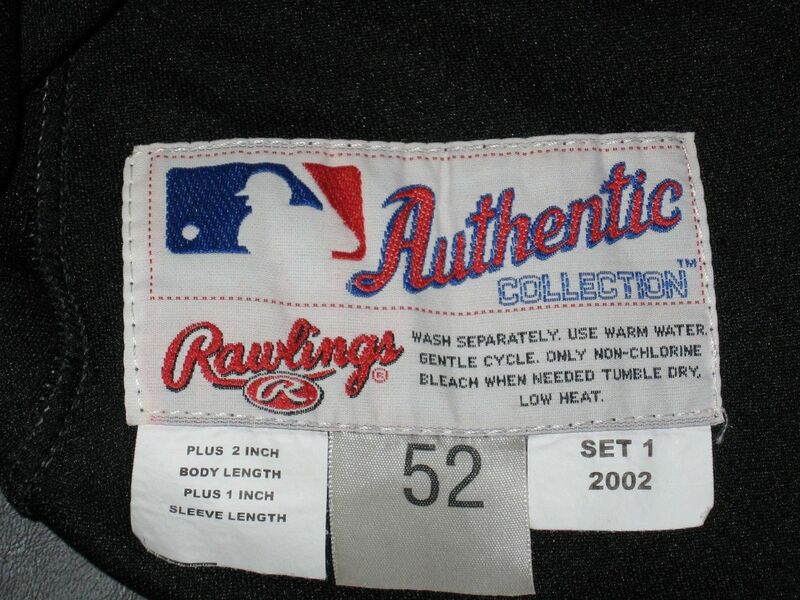 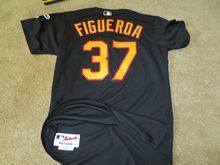 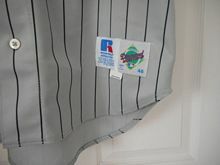 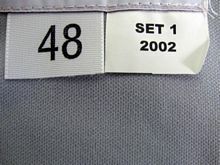 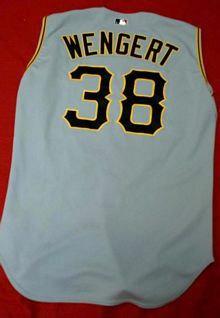 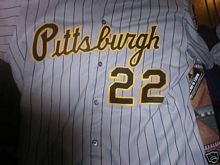 Roadie stays as a pullover, front is changed to "Pittsburgh" in script. 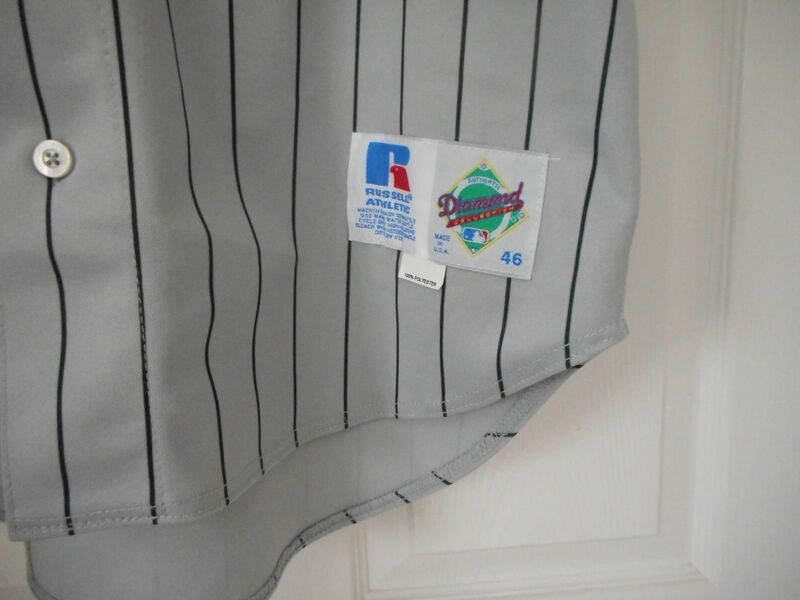 Sleeve cuff stripes get a bit smaller. 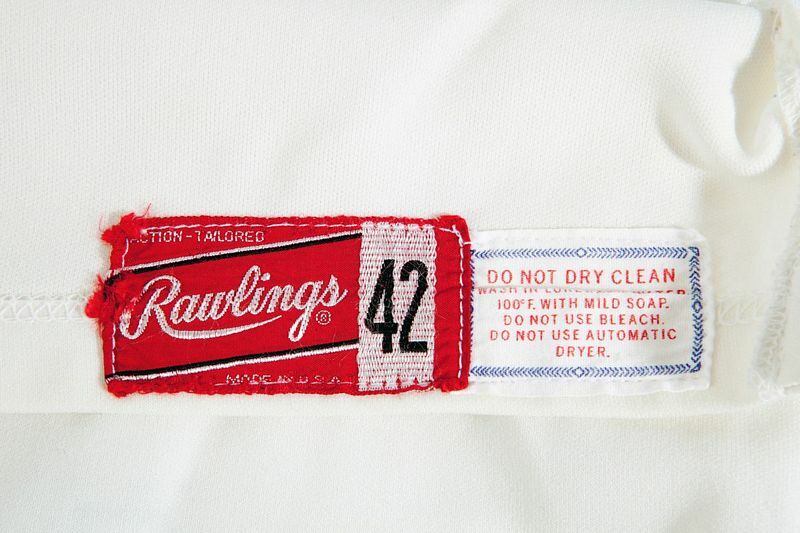 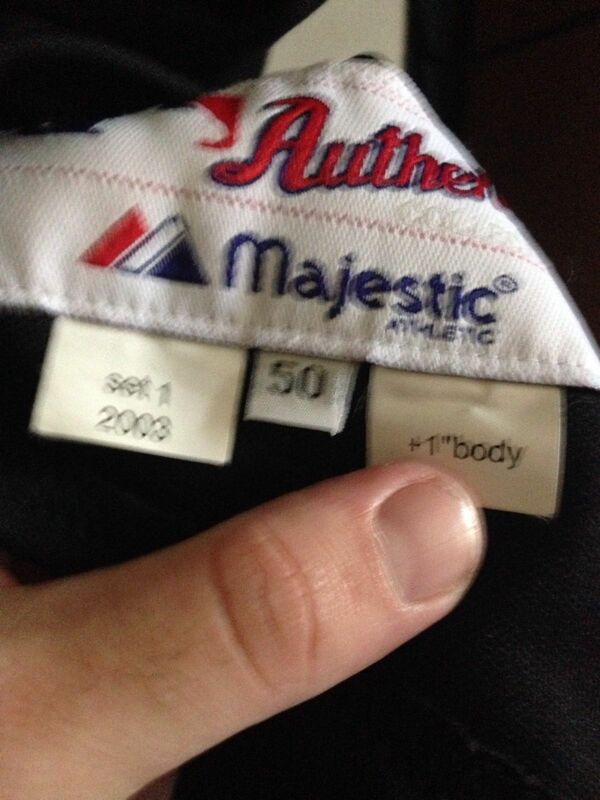 Road jersey also becomes a button-down. 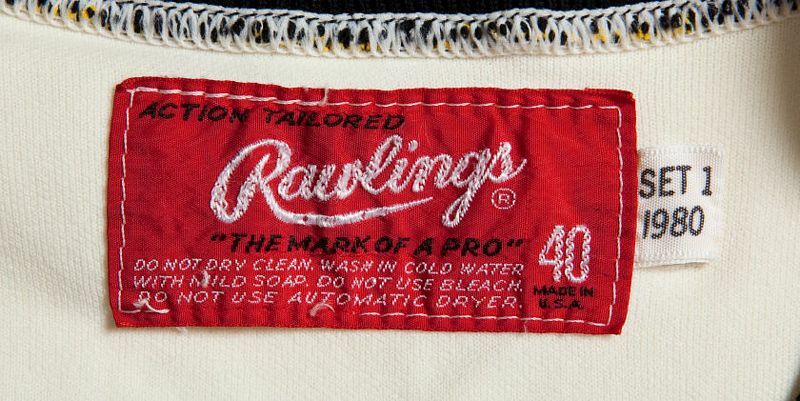 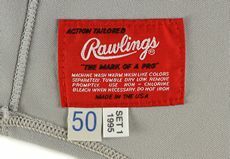 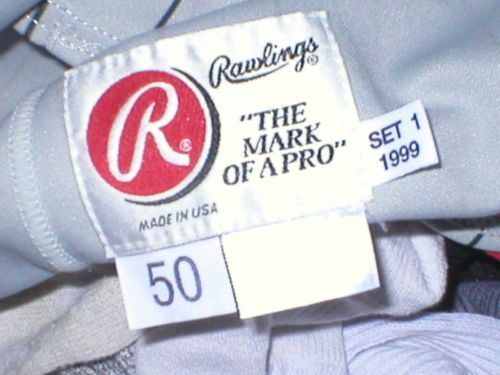 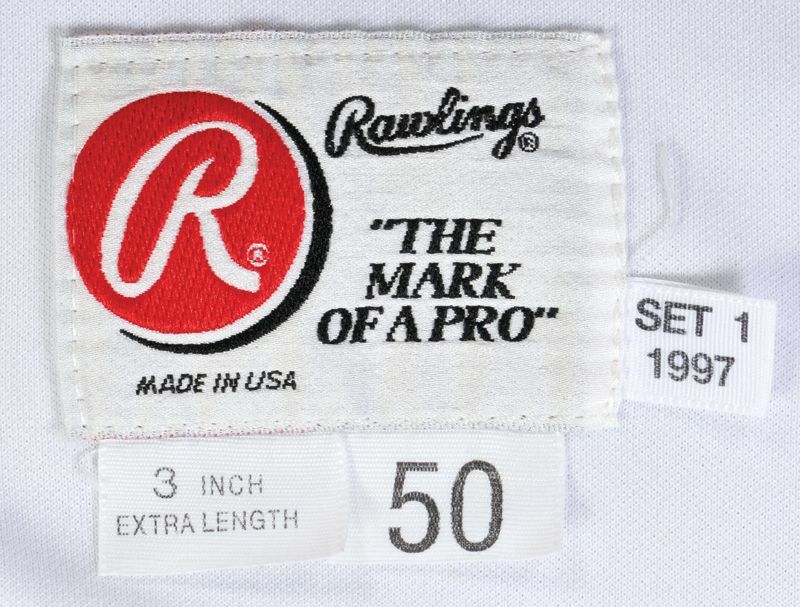 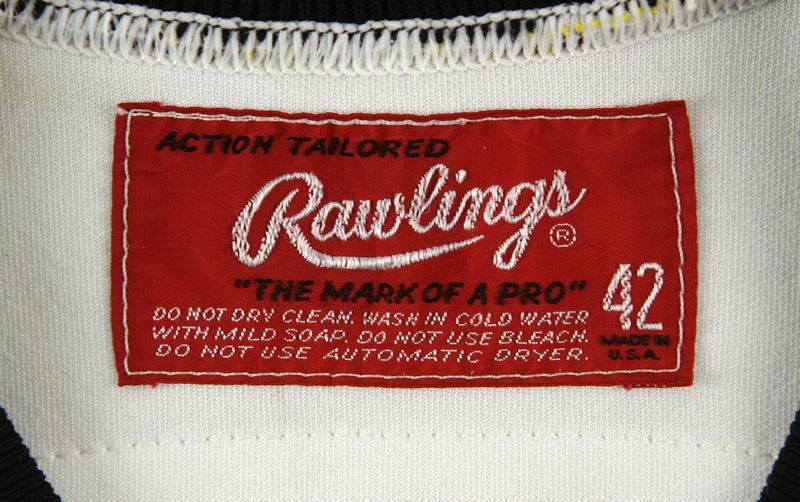 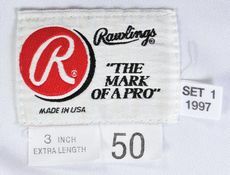 Both Rawlings and Russell are used. 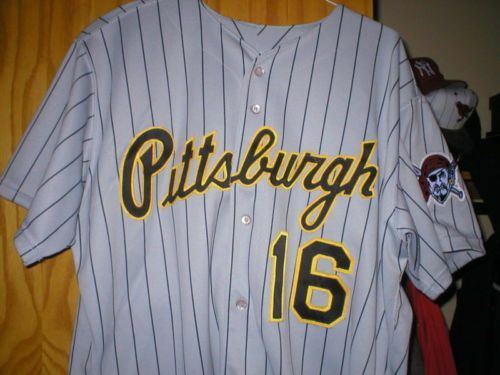 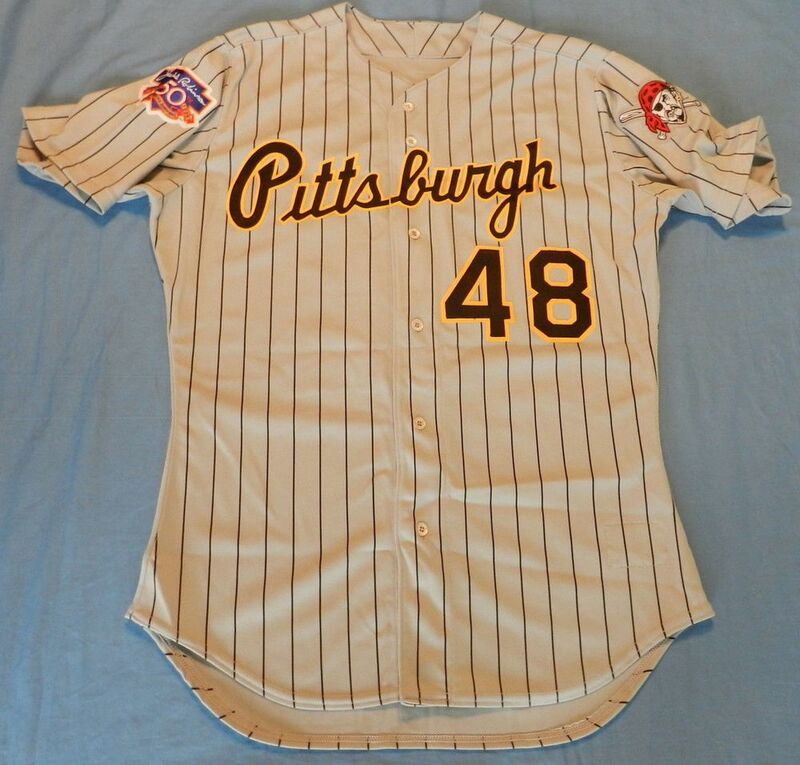 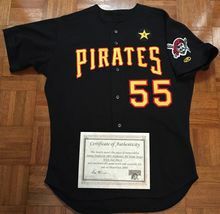 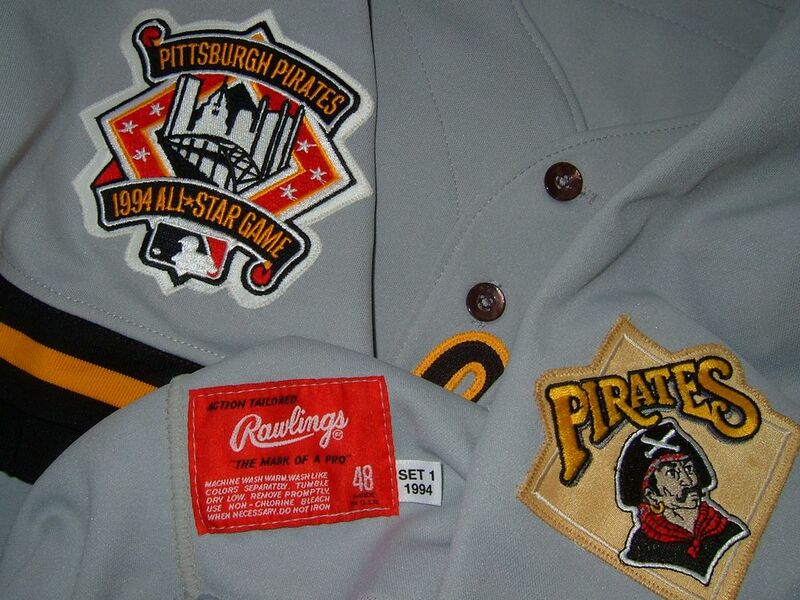 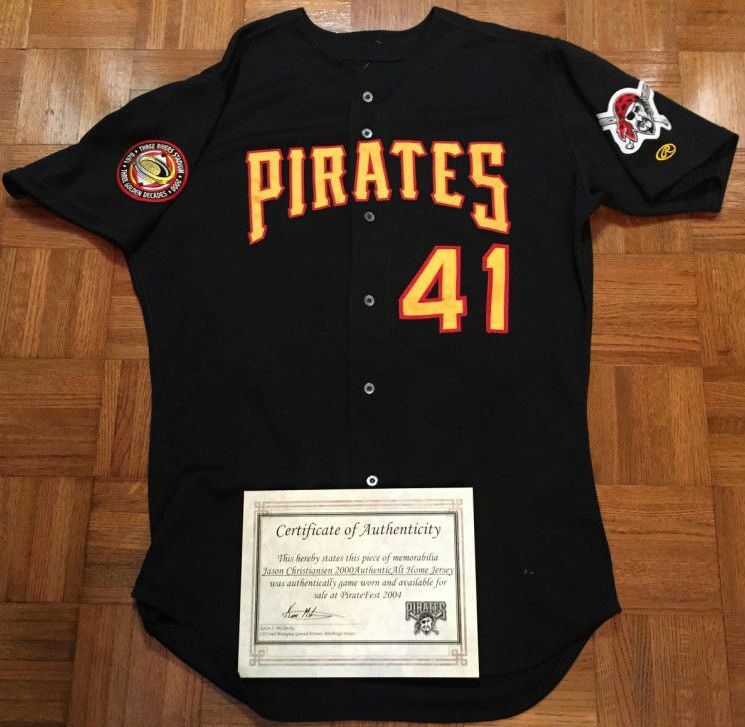 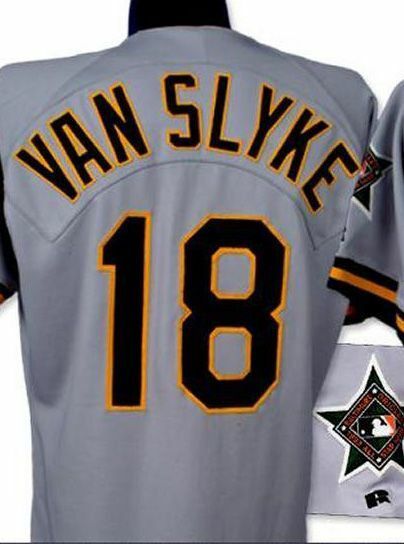 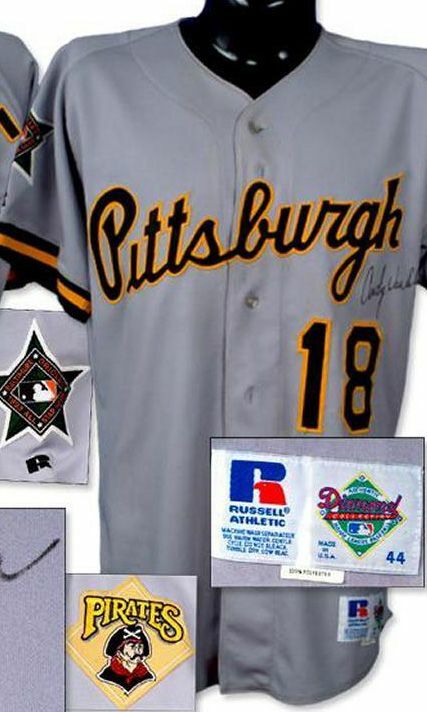 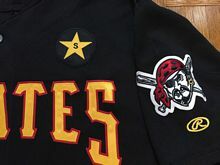 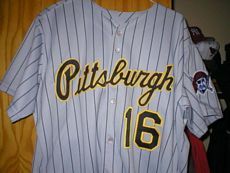 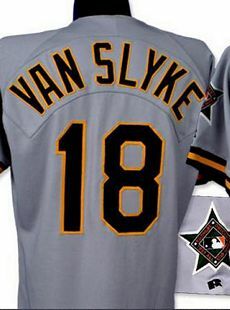 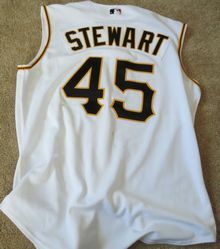 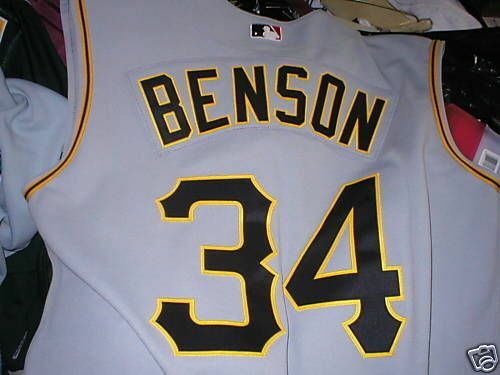 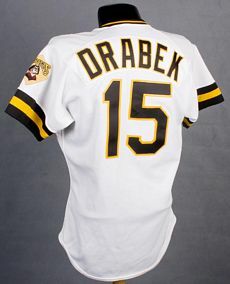 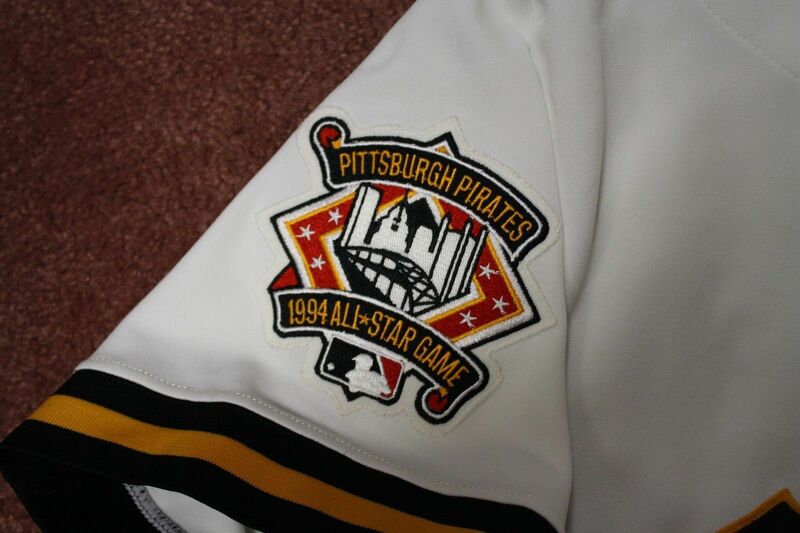 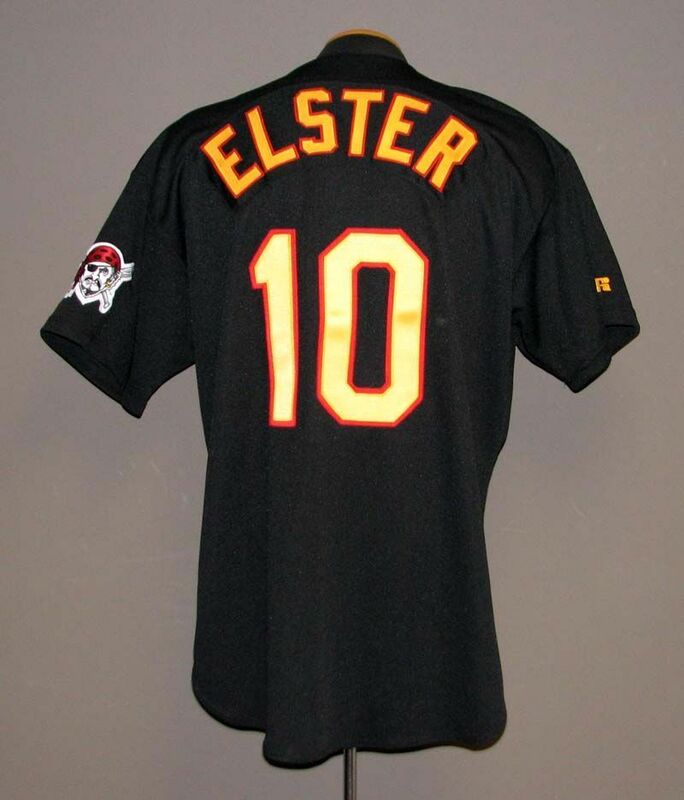 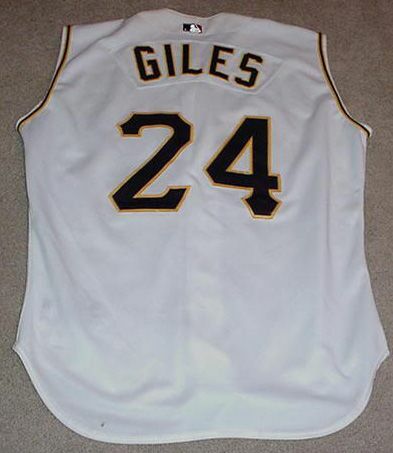 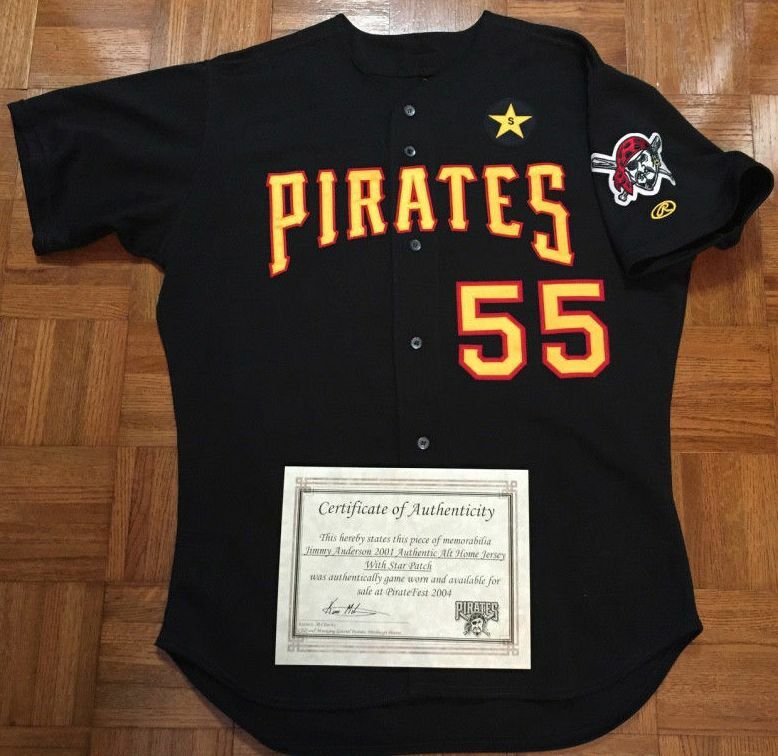 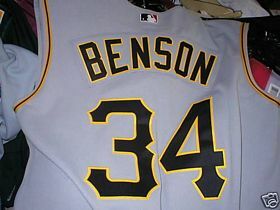 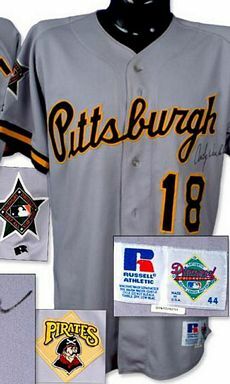 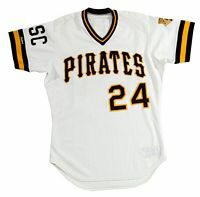 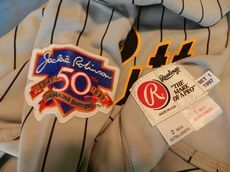 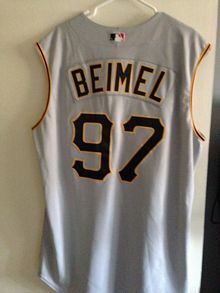 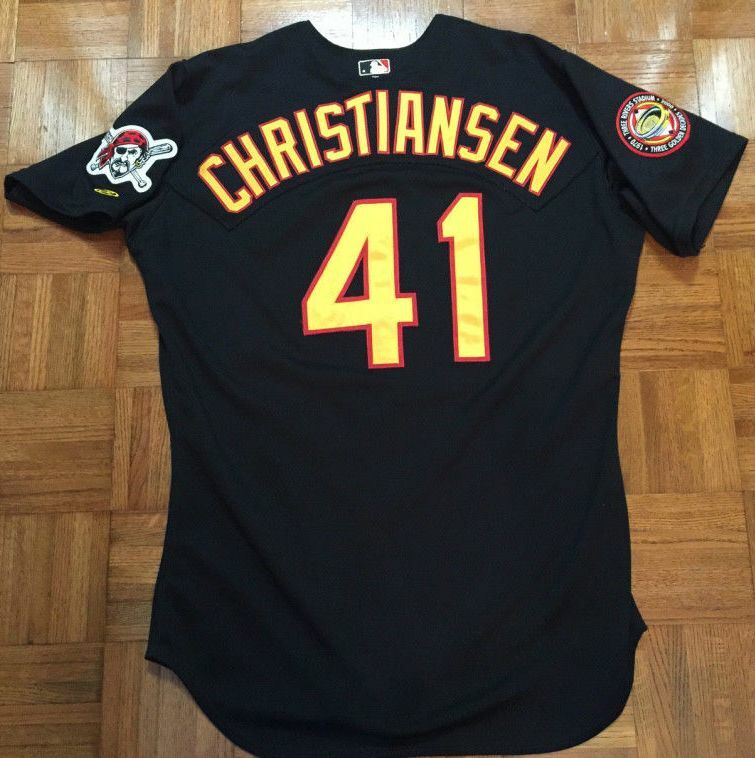 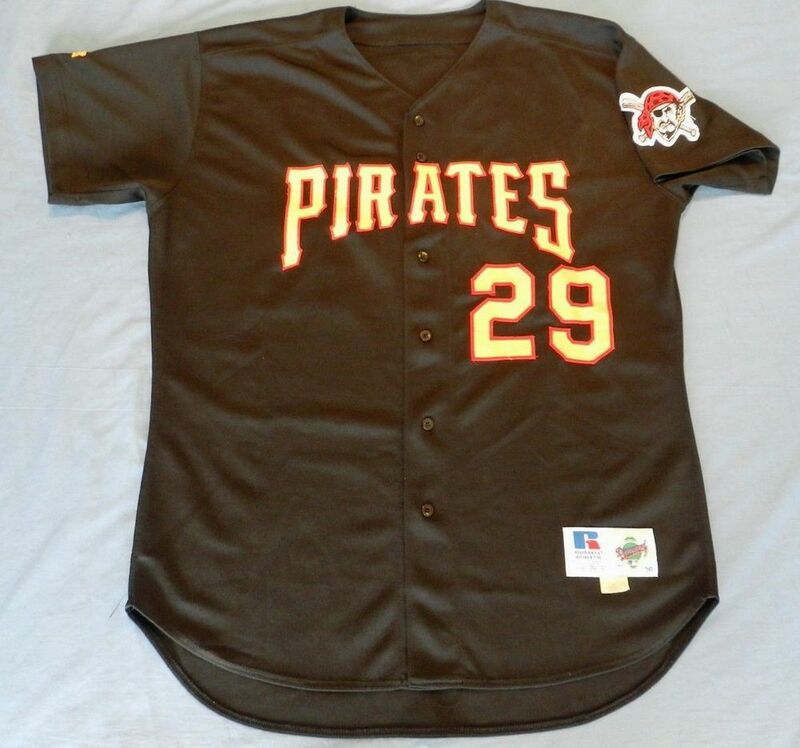 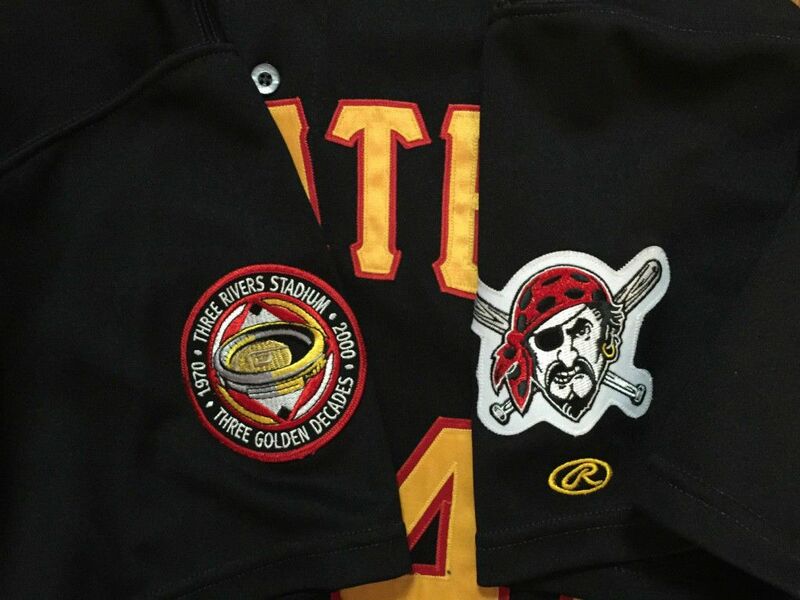 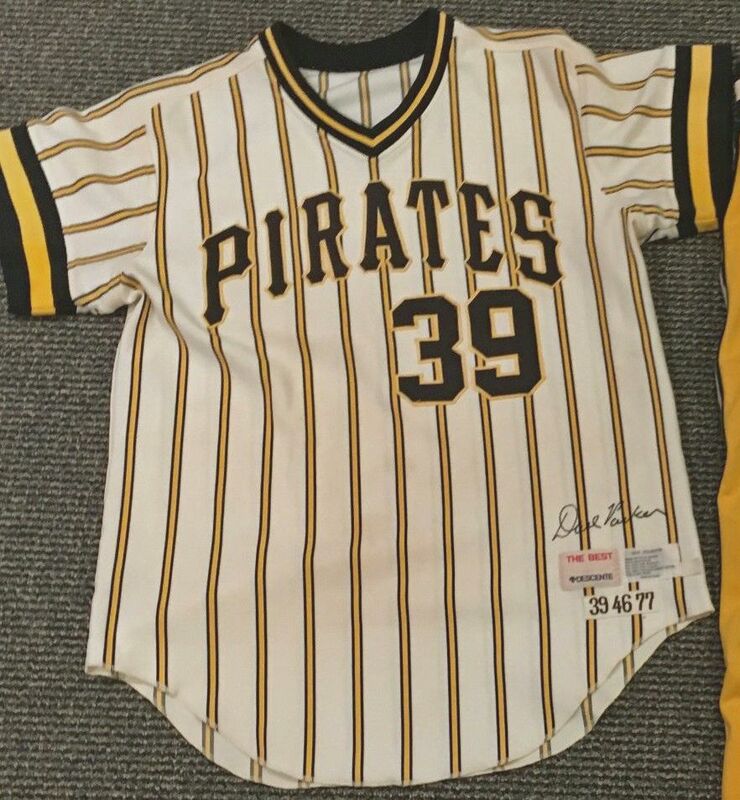 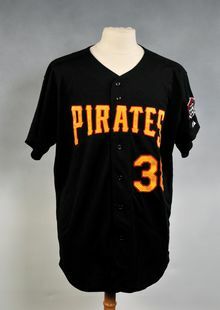 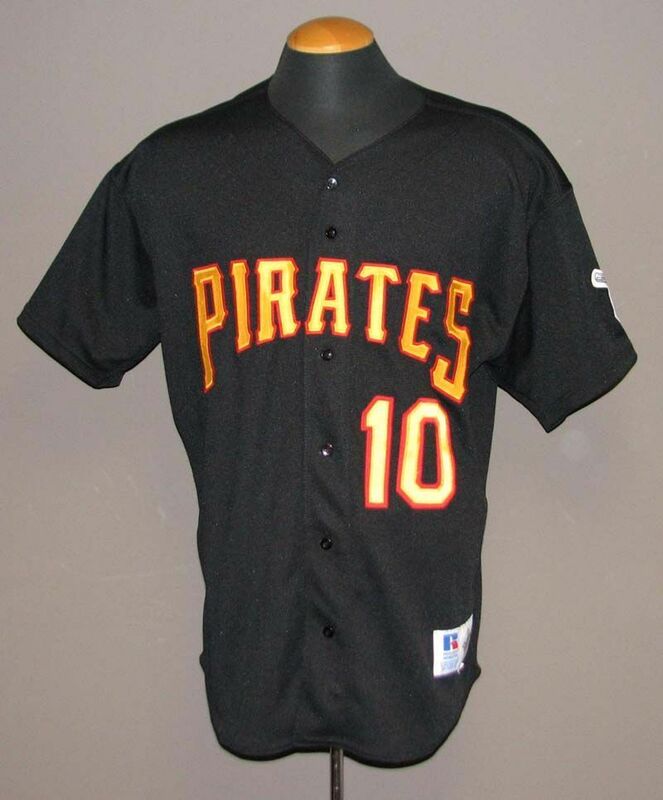 The Pirates wear the 1994 All Star game patch instead of the MLB 125th anniversary patch. 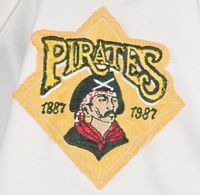 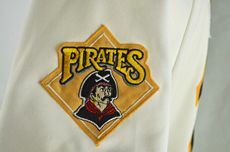 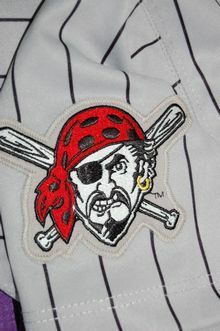 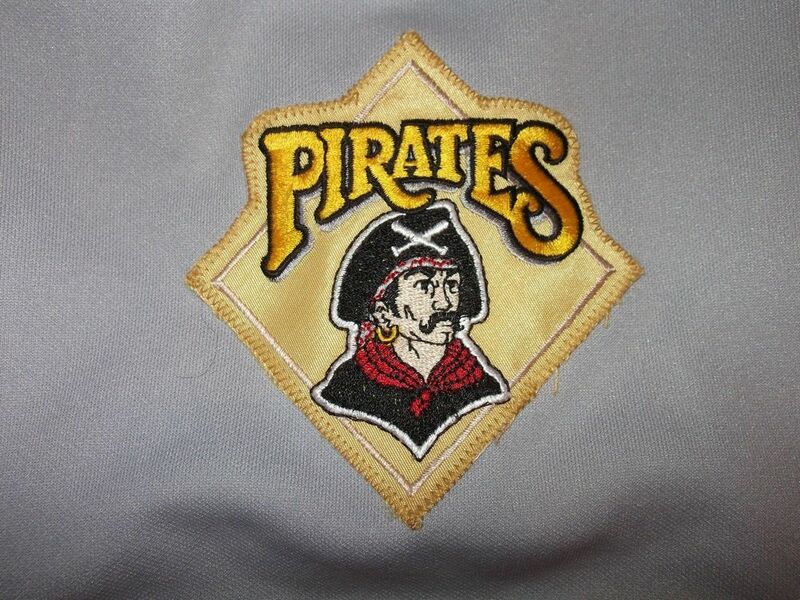 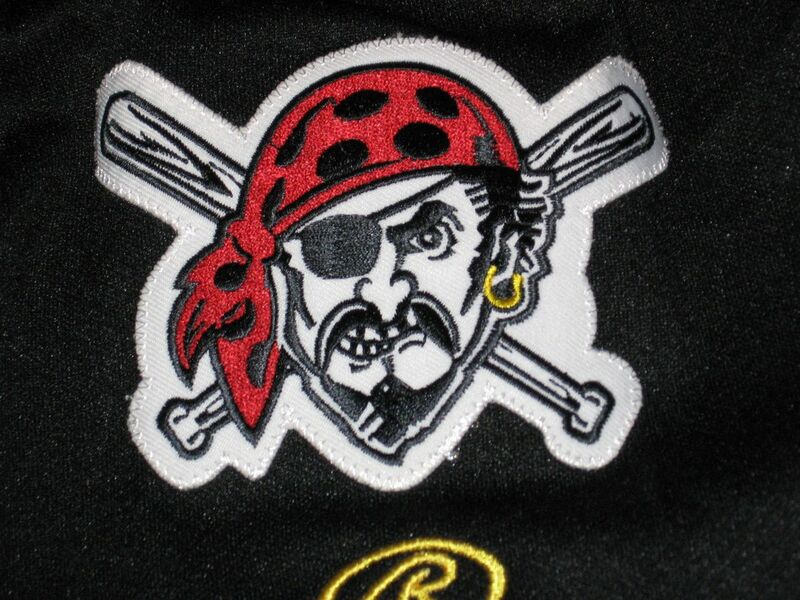 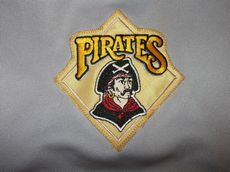 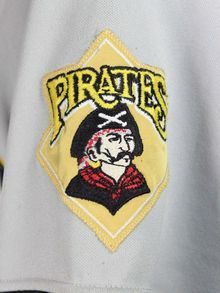 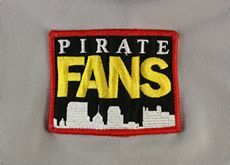 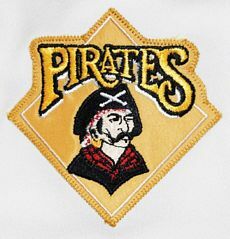 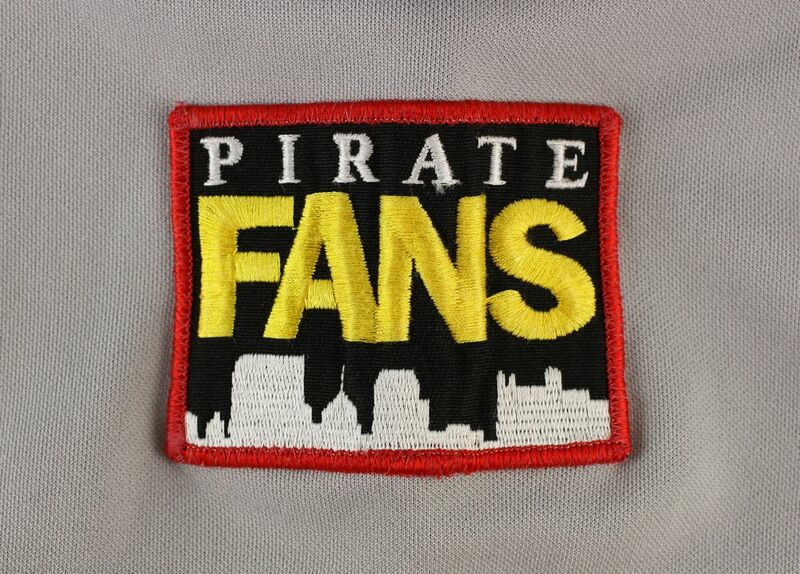 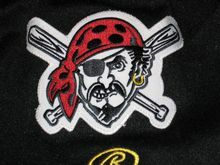 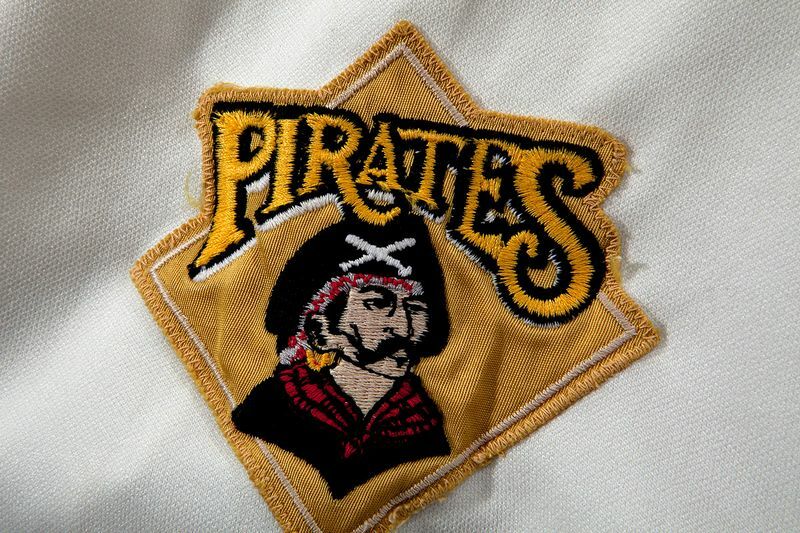 Pirate Fans sleeve patch worn to lure fans back after the strike. NOB removed from home jerseys. Both Rawlings and Russell are used. 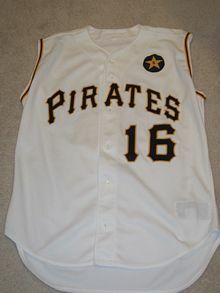 NOB returns to the home jersey. 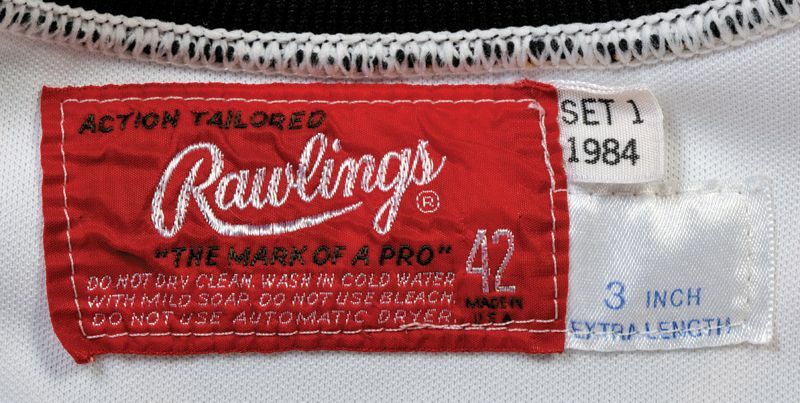 Both Rawlings and Russell are used. 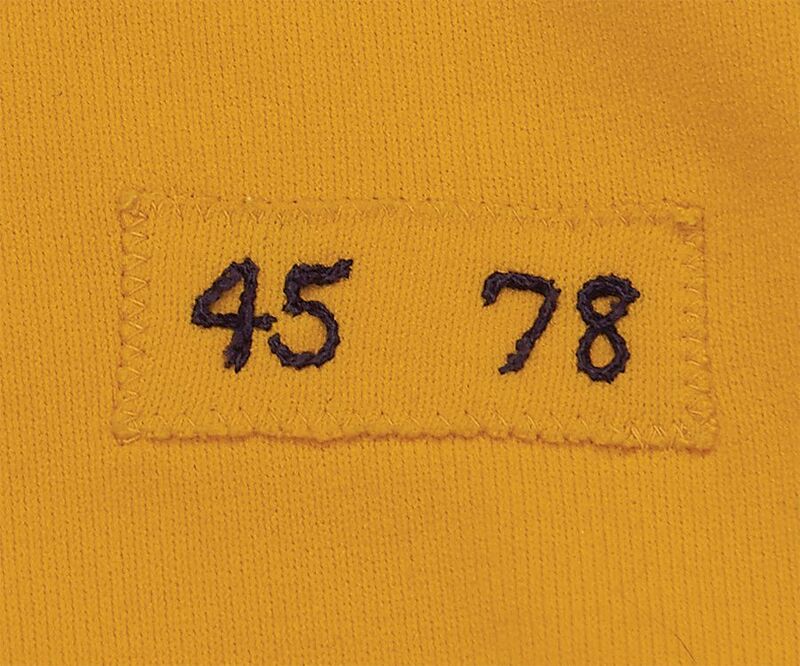 Lettering revised on home jersey. 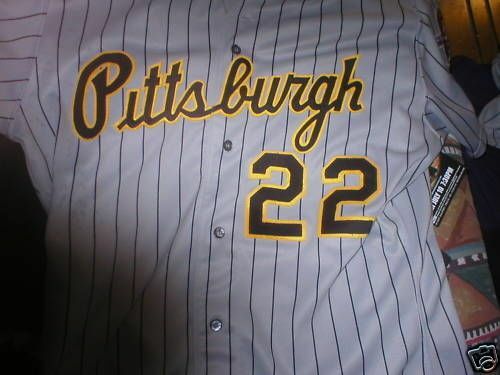 Pinstripes added to road jersey along with a grey road cap (not used too often though). 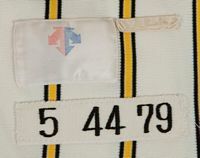 Sleeve cuffs removed from both. Black alternate jersey added with red trim and a red-billed cap, adding red for the first time since 1947. New sleeve patch. 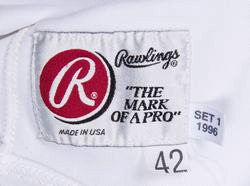 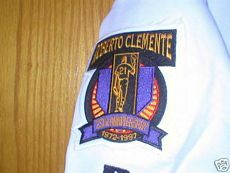 Roberto Clemente and Jackie Robinson patches worn in 1997. 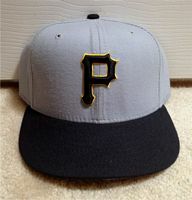 Road grey cap is rarely used. 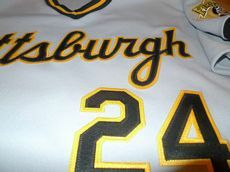 Three Rivers Stadium patch worn on 2000 home and alternate jerseys. Home and road jerseys change to sleeveless vests. 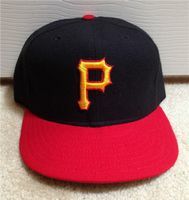 New alternate cap.